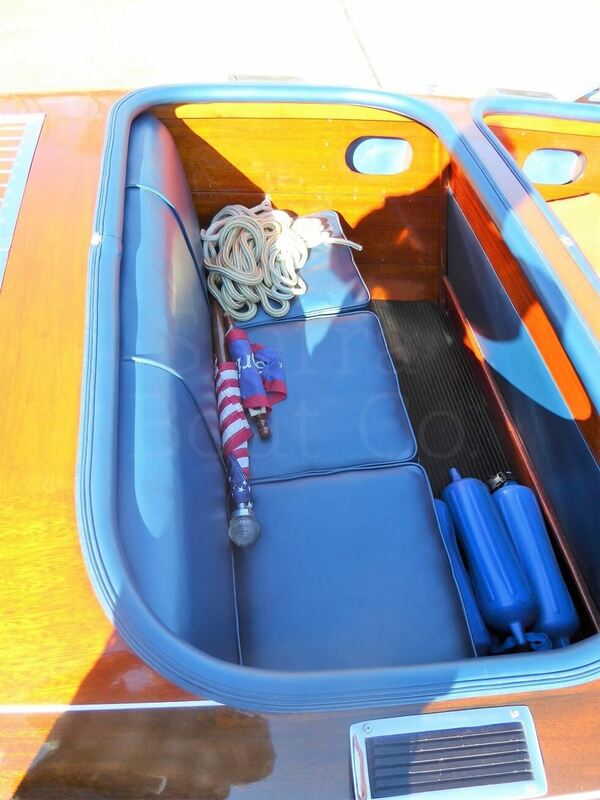 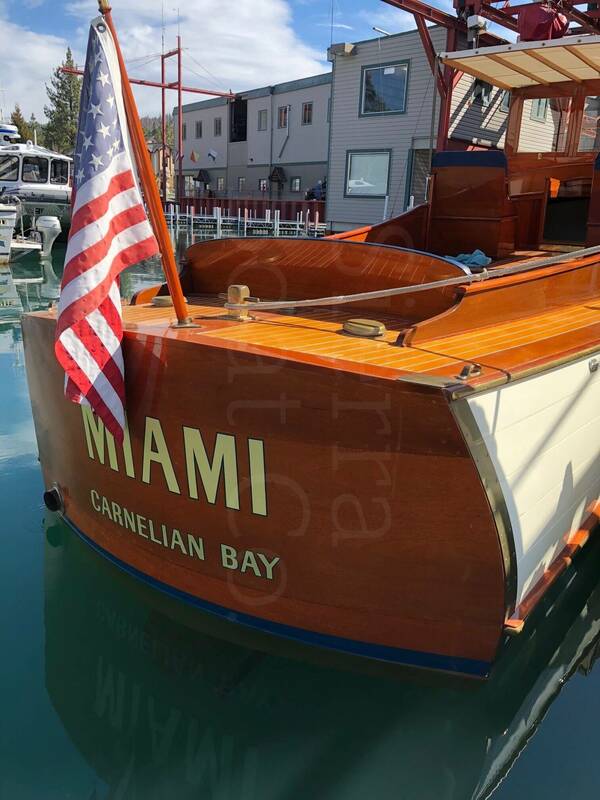 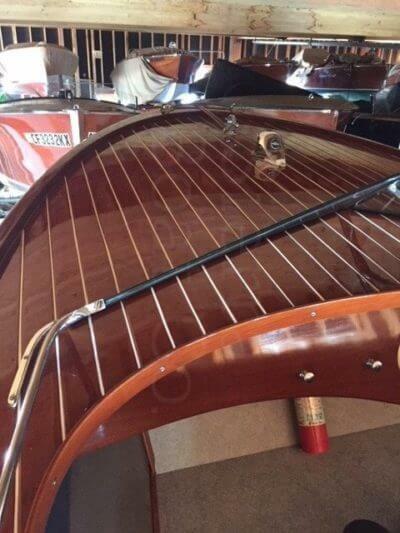 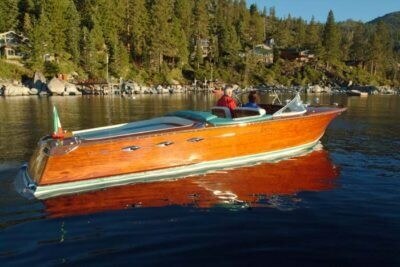 1939 Chris Craft 19ft Custom Runabout, “Barrel Back”. The Chris Craft Custom Runabout, known colloquially in classic boating circles as the “Barrel Back,” is arguably the most desirable Chris Craft model produced. 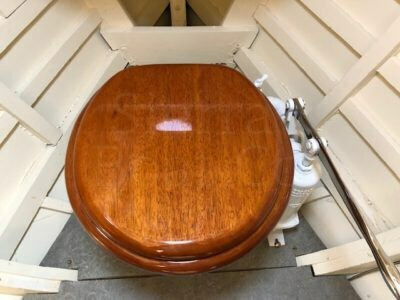 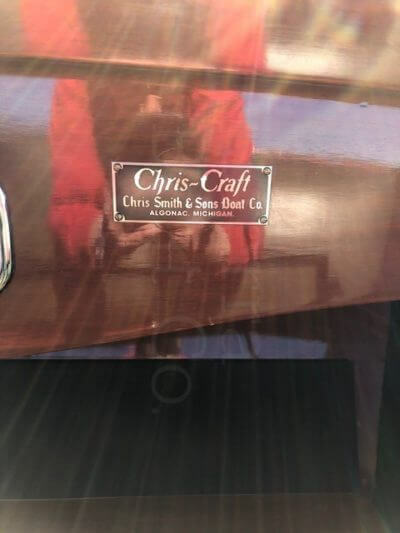 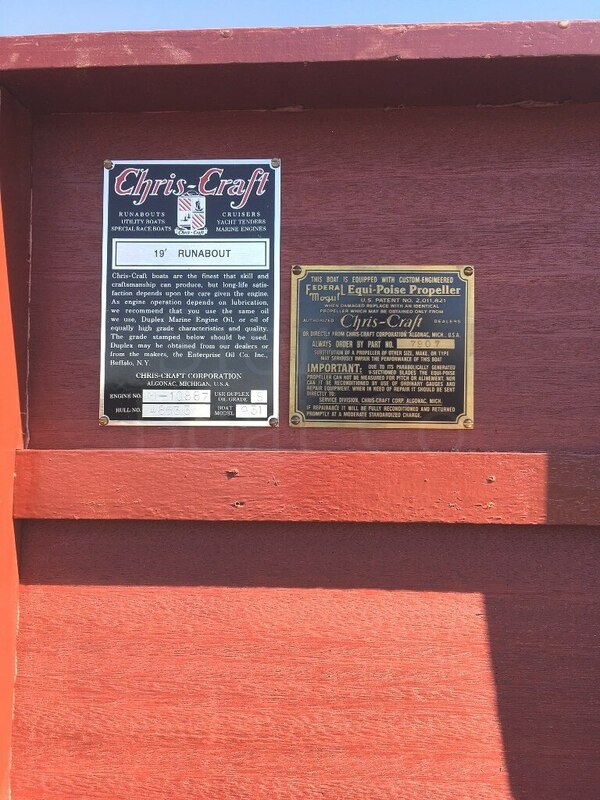 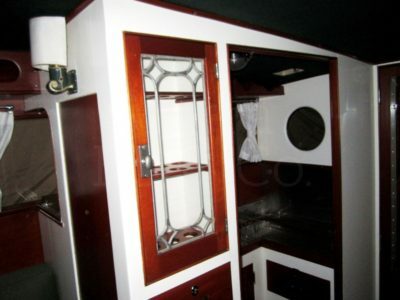 They represented the highest level of craftsmanship Chris Craft ever offered because it required skilled craftsmen to produce the full half circle transom shape. 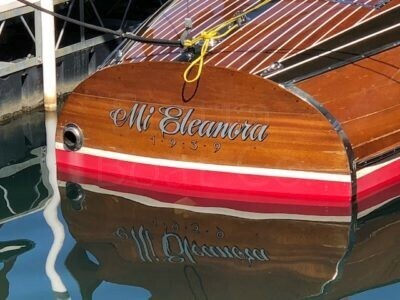 The transom is so round above water that it actually looks like a floating barrel. 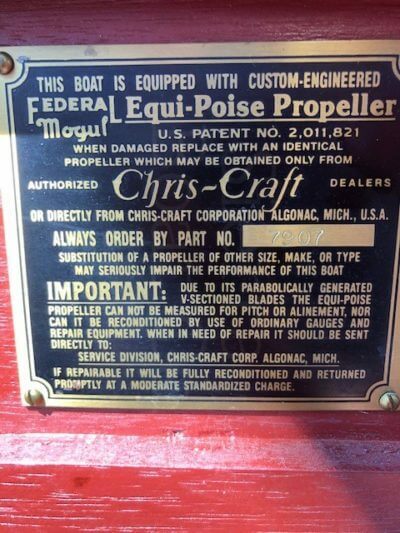 While Chris Craft never officially adopted the moniker, it stuck anyway. 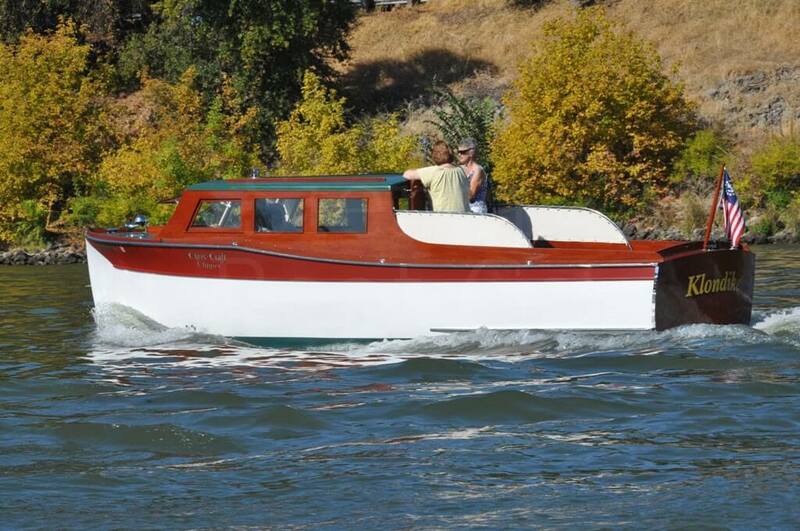 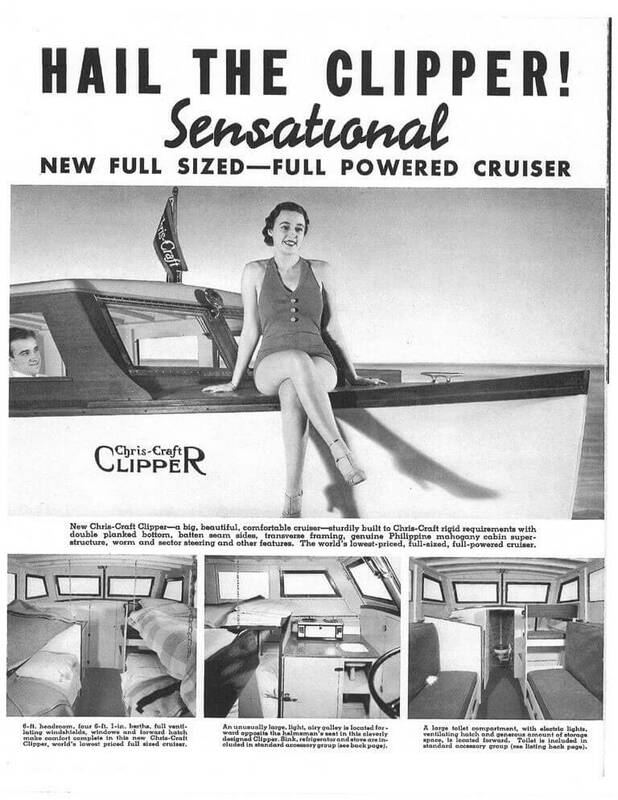 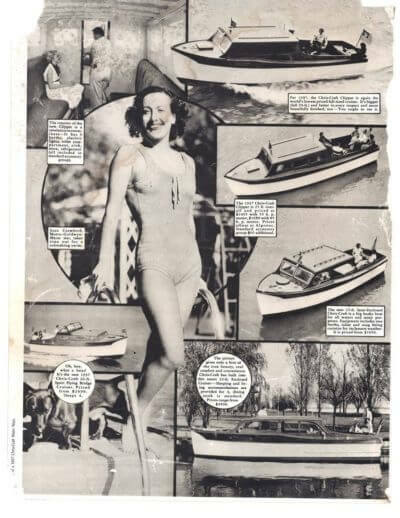 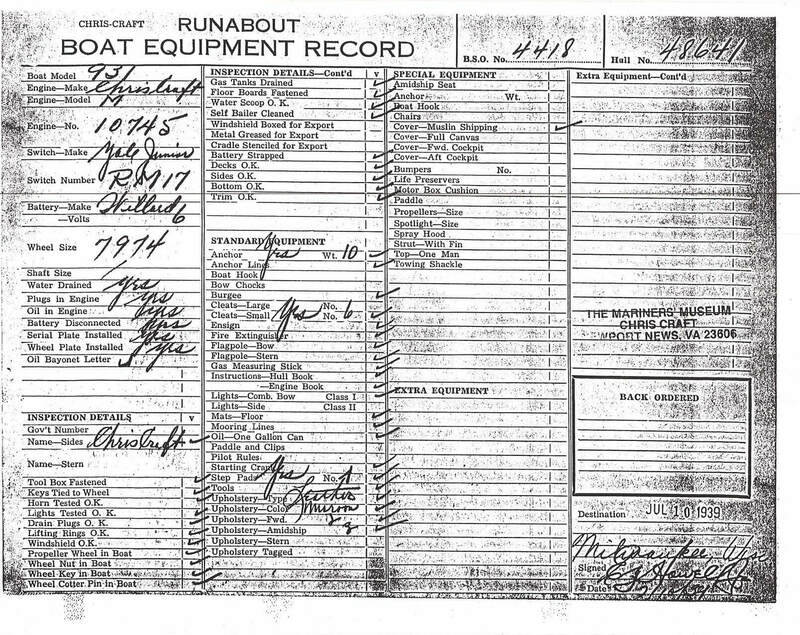 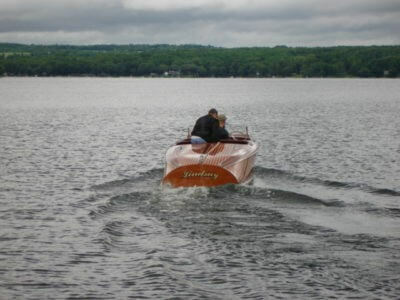 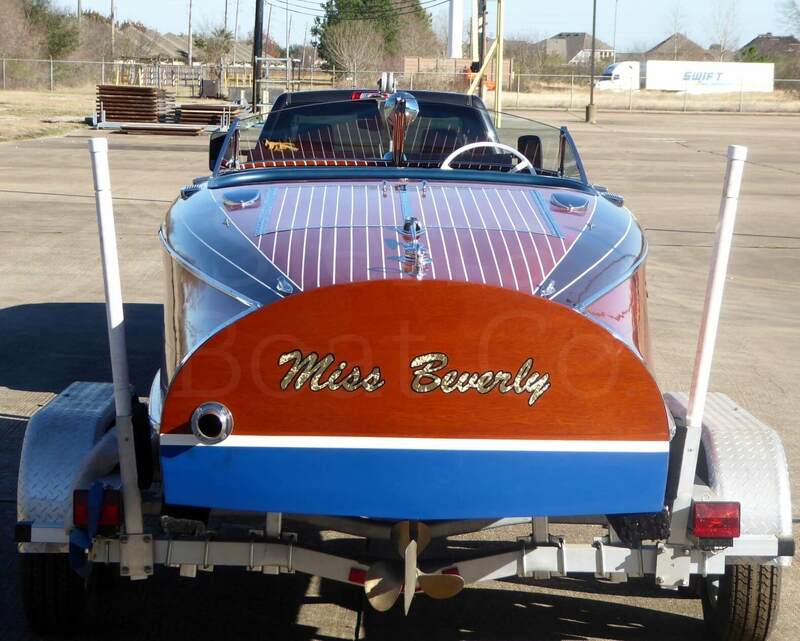 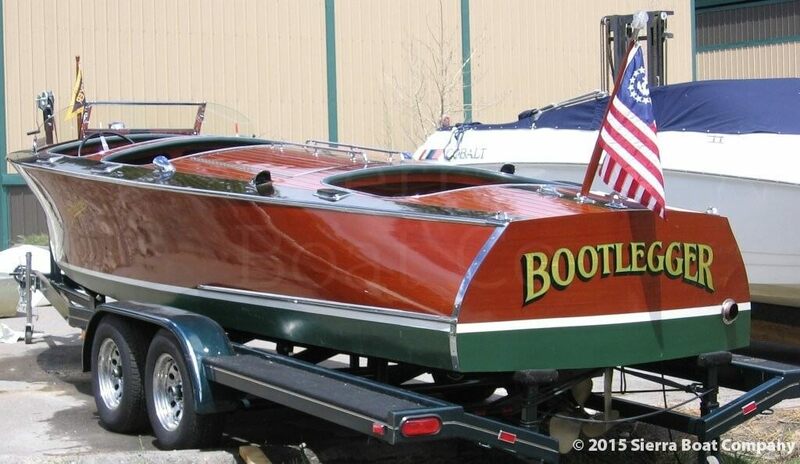 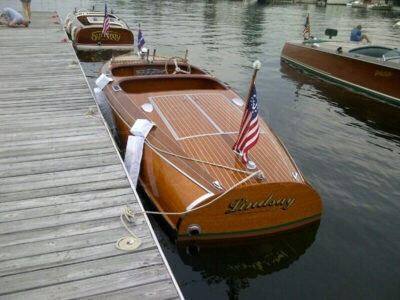 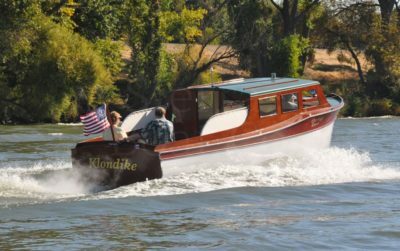 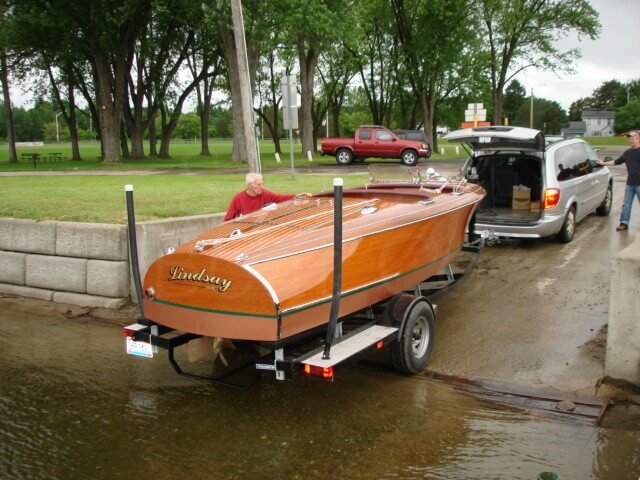 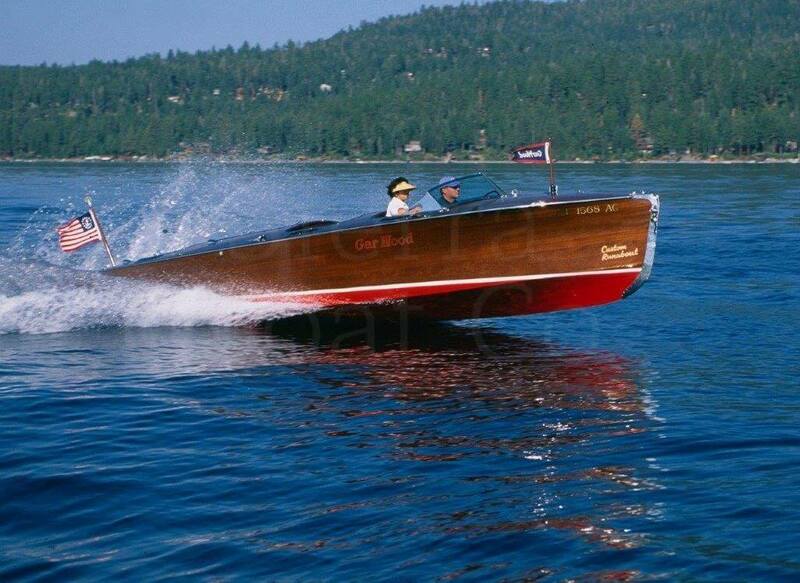 The 19-foot Custom Runabout model was built from 1939 through 1942 and only 433 were made. 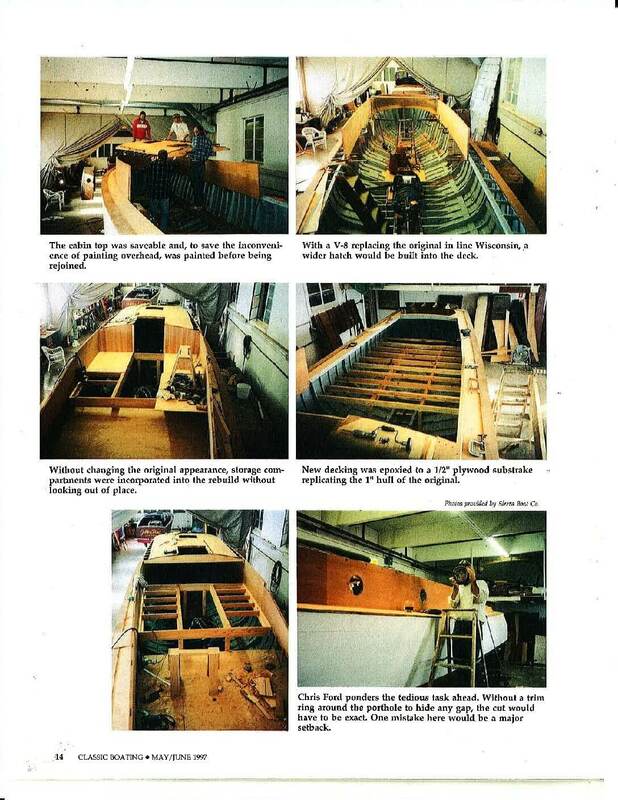 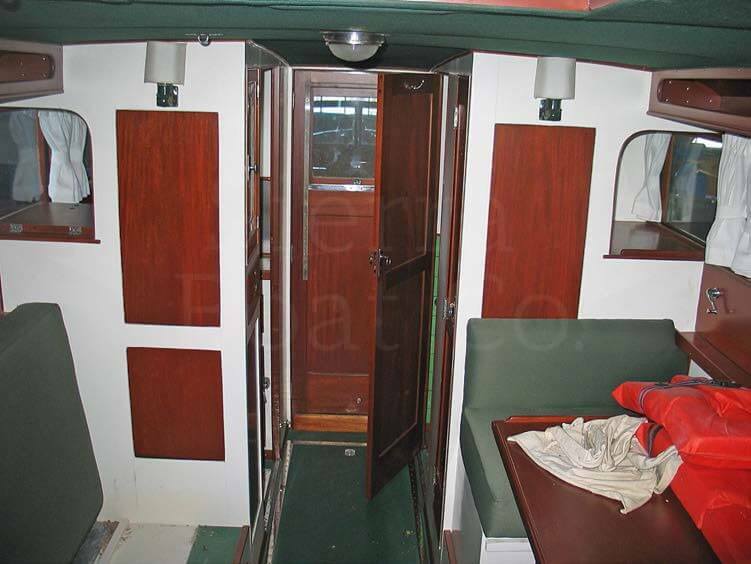 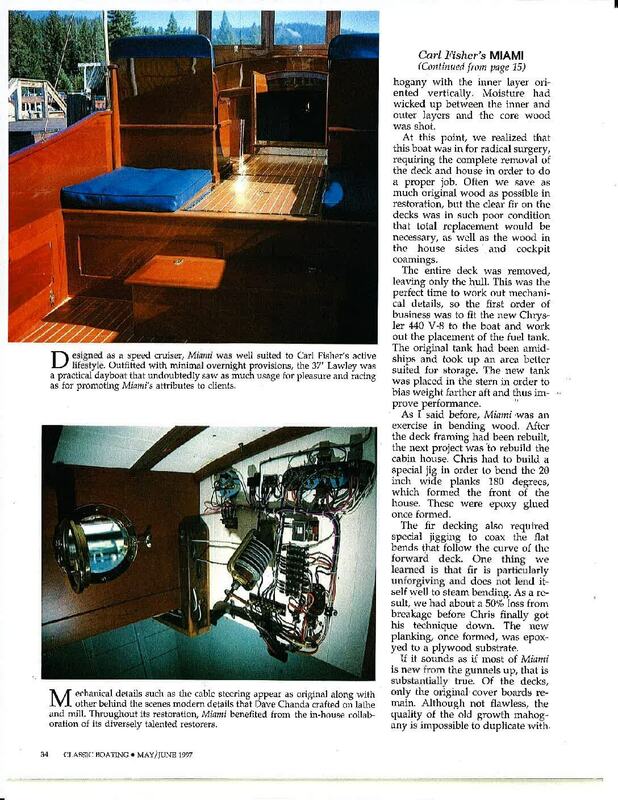 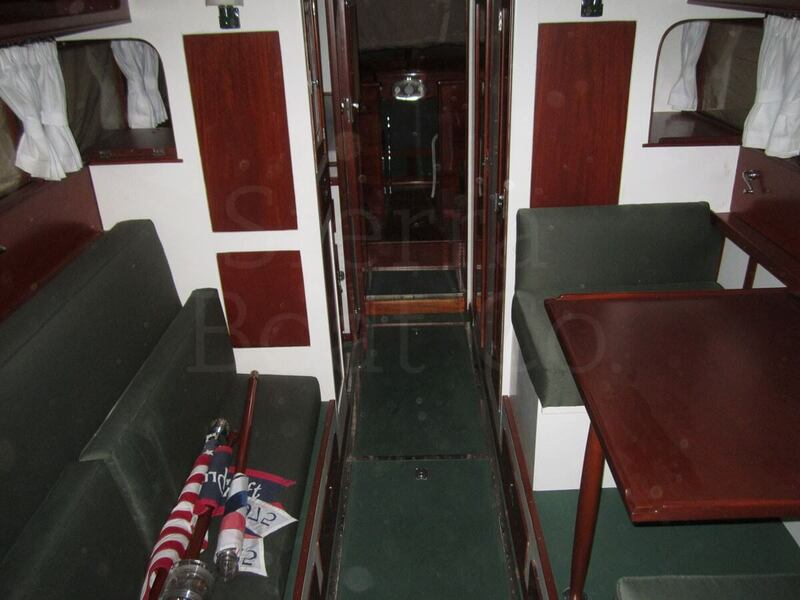 This Custom Runabout, hull number 48641, was completely restored in 2007/2008 with photo documentation of the project. 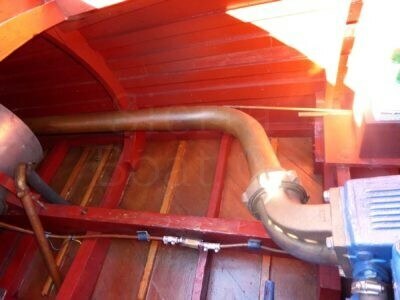 The boat is currently in Bristol Condition and is equipped with a 5200 bottom to eliminate soaking. 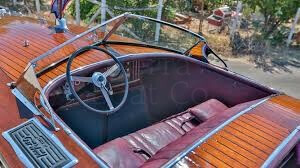 It has the fold down Bugatti style windshields as used in 1939 and 1940. 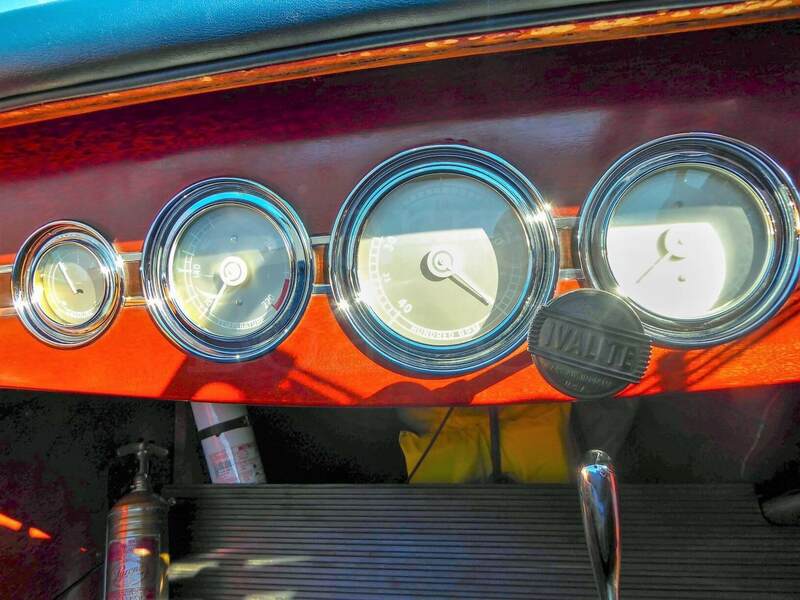 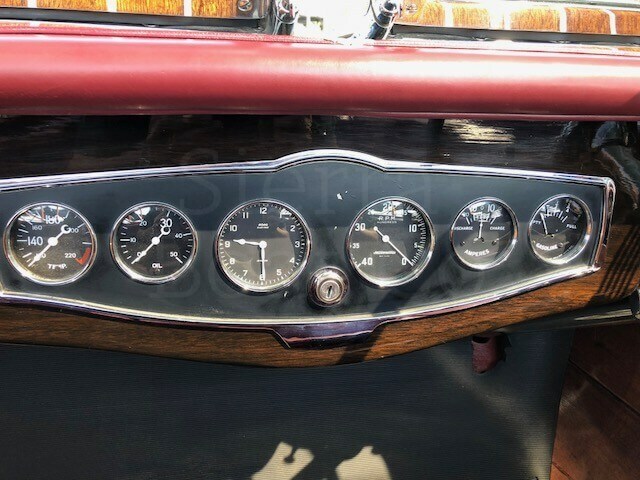 Also unique to this year is the one-piece instrument panel. 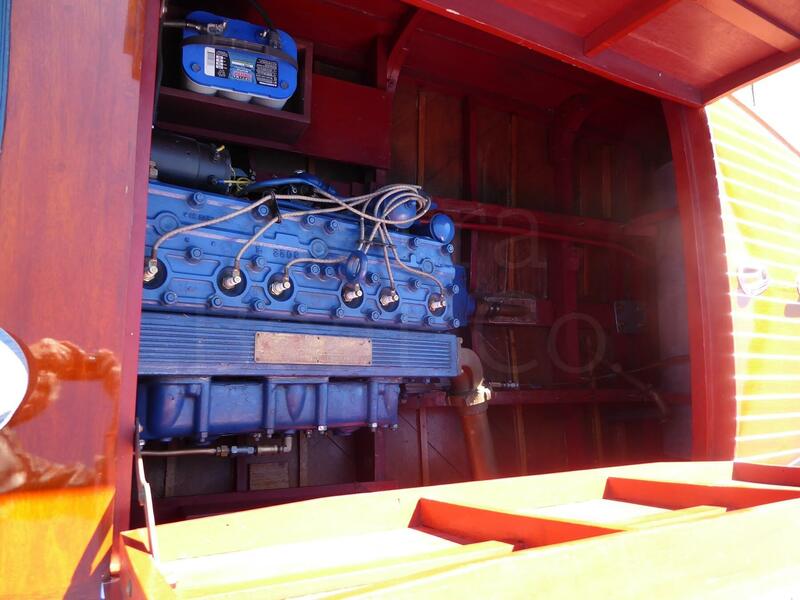 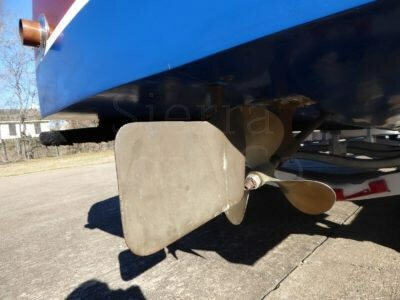 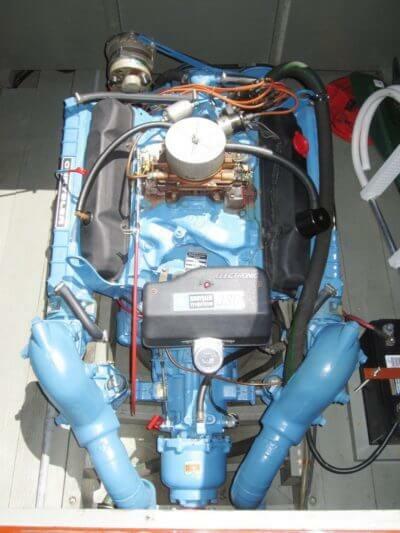 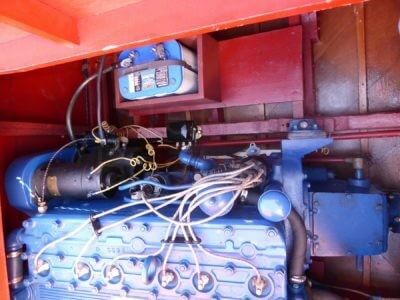 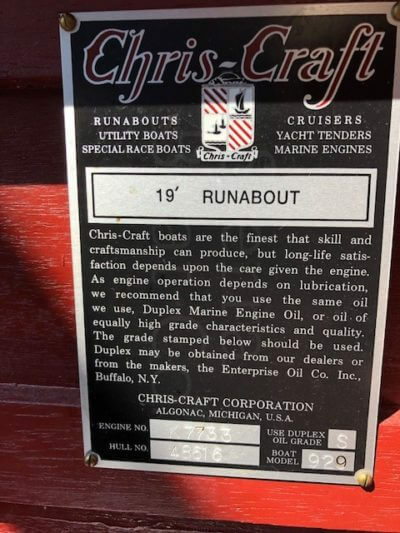 It is powered by the original Chris Craft M engine with 135 hp. 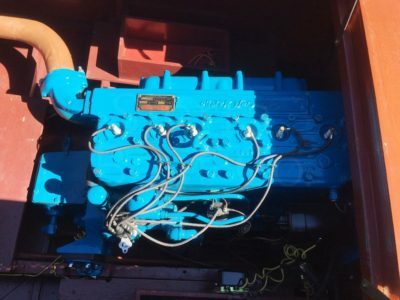 The engine was rebuilt in 2007 and currently has less than 25 hours on it. 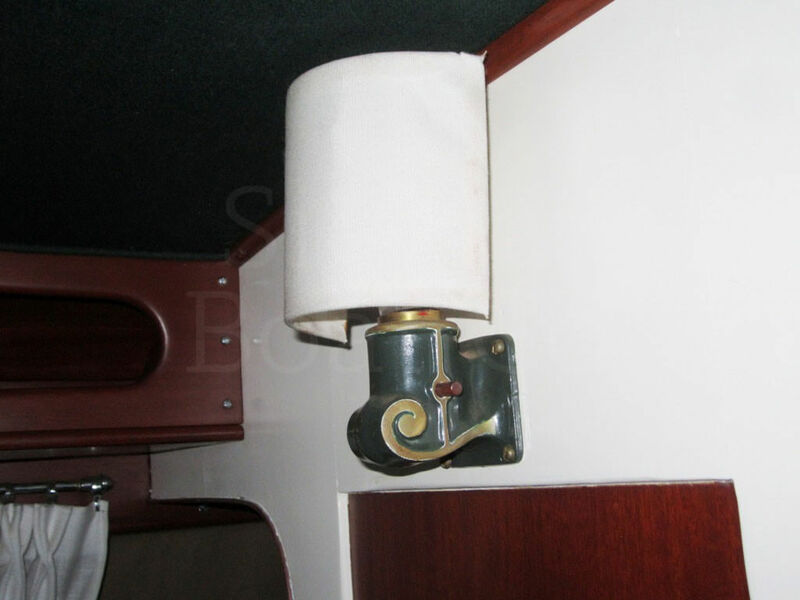 It features a 12V charging system with one battery, a bilge pump and horn. 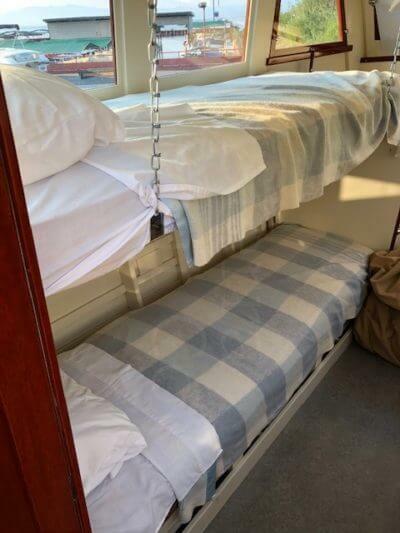 It also comes with two covers, summer and winter. 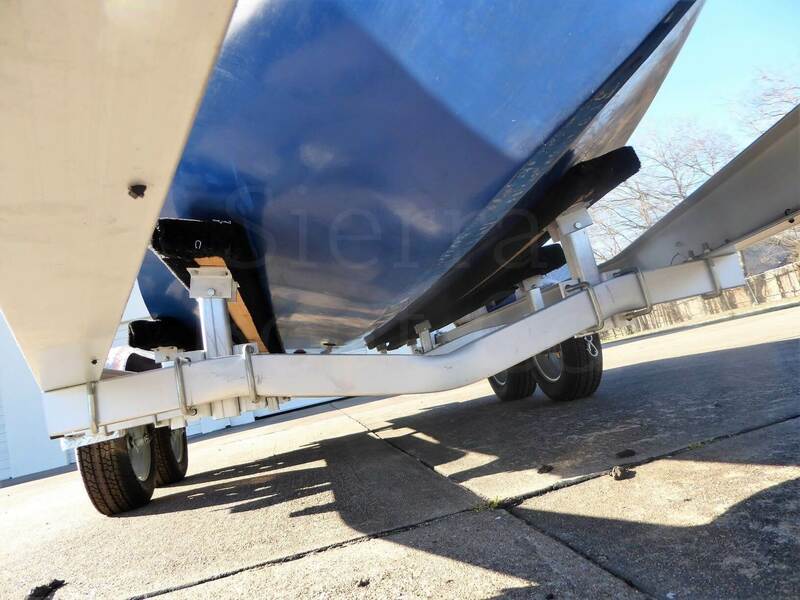 The boat sits on a single axle 2007 Trailmaster trailer with spare tire and is annually serviced. 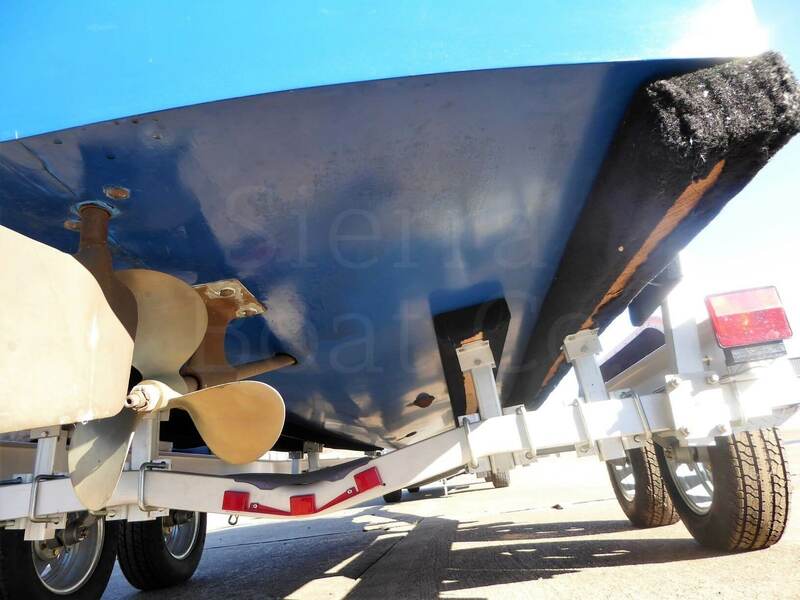 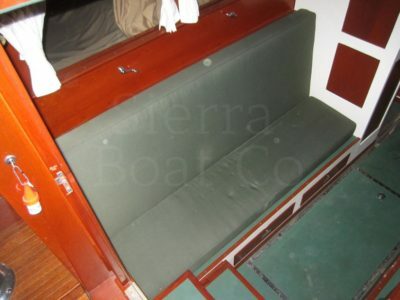 This boat is offsite and has not been inspected by Sierra Boat Co.
1967 Rio 28ft Super Colorado. 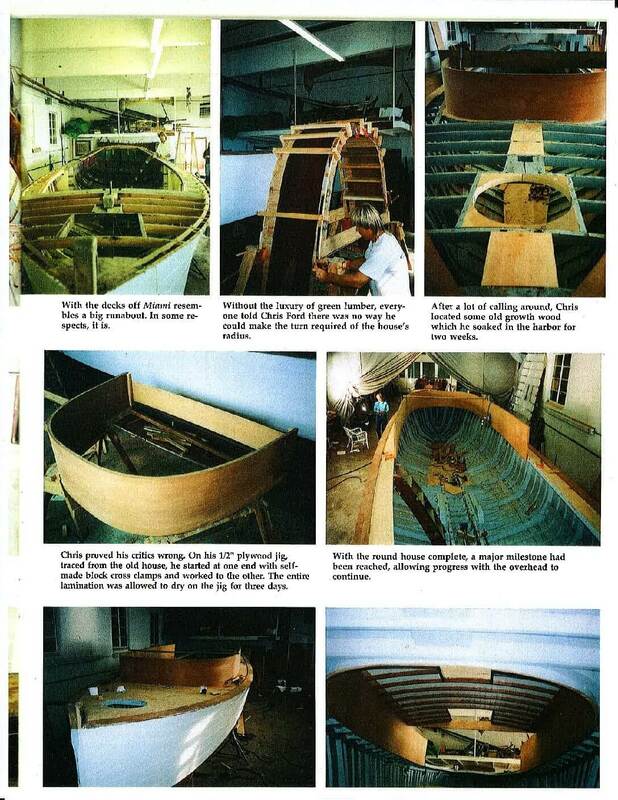 The Rio shipyard was originally just down the street from the famed Riva shipyard. The influence of the Riva brand is evident in the Colorado, taking many styling clues from the iconic Aquarama. 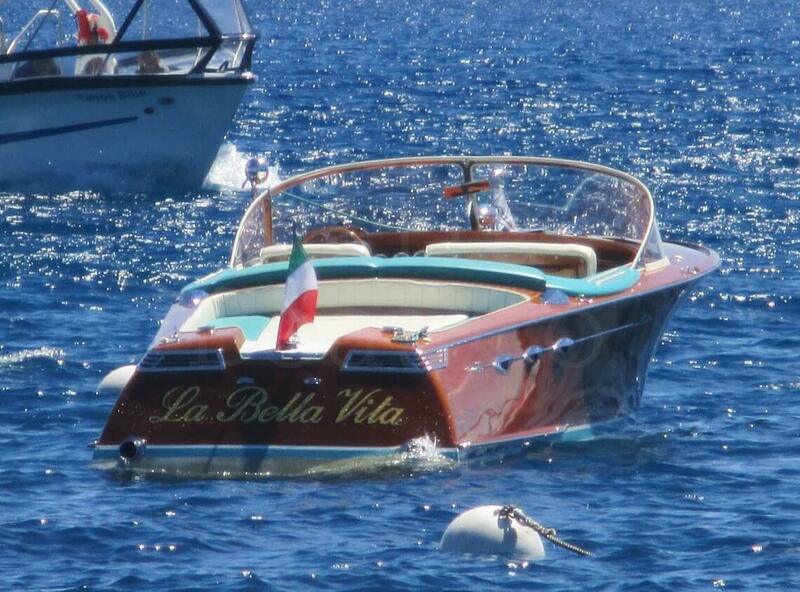 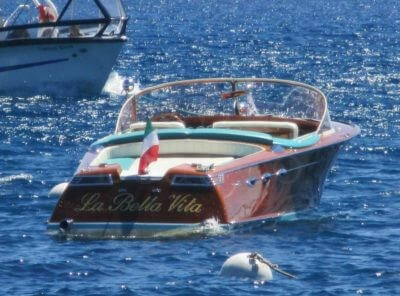 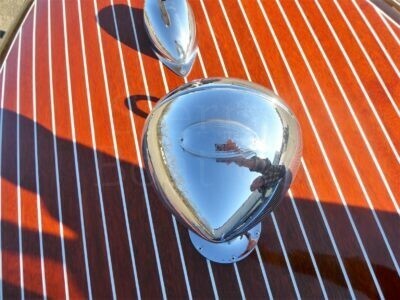 True to all things Italian, the Rio boats are highly crafted works of art. Rio’s should be seen as a different brand than Riva, just as Lamborghini is different from Ferrari, not inferior just different. 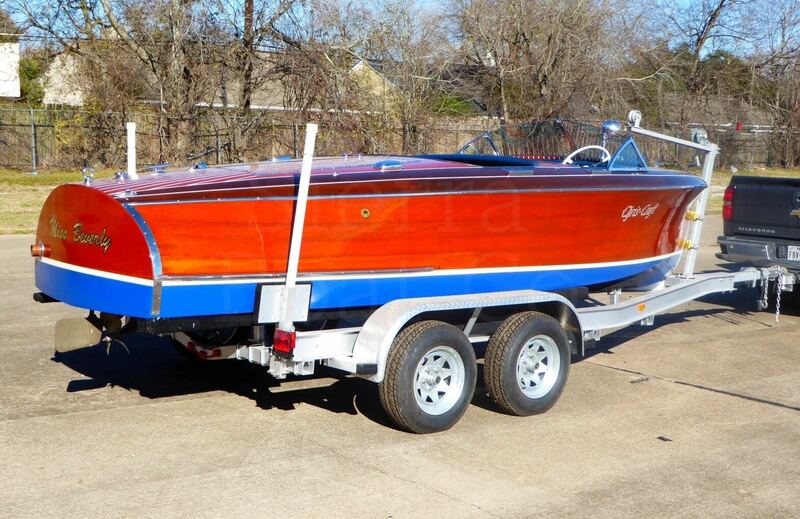 The example listed here is the only known to exist 1967 Rio 28ft Super Colorado in the US, and one of only a handful of Rio’s in this country. 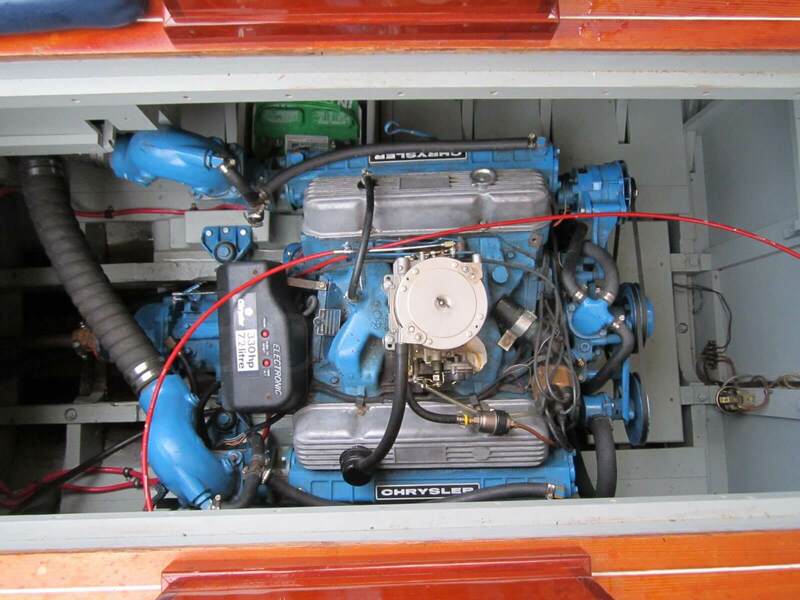 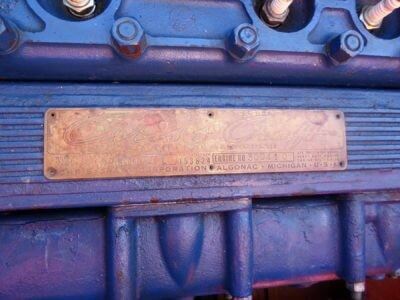 The “super” designation is due to the use of “Big Block” engines, in this case a pair of Chrysler Marine 440’s. 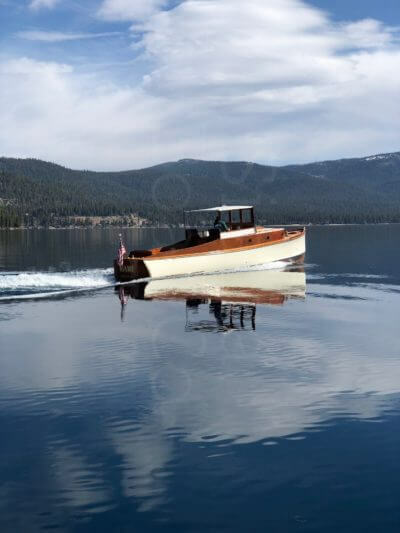 It is not known how many Colorado’s were built, but it is estimated that the numbers were very low, and certainly the Super is rarer still. 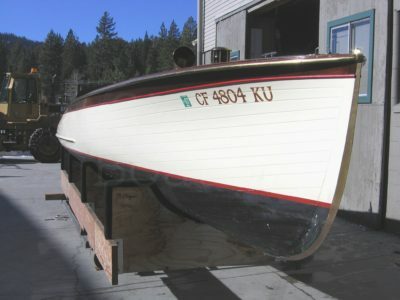 The hull number is 035, which assumes it is the 35th built. 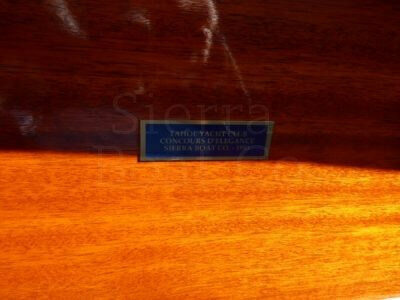 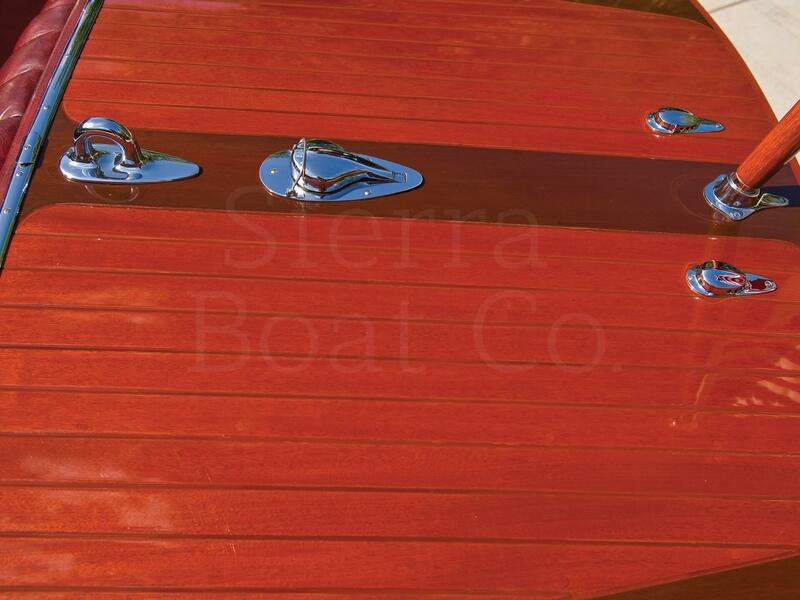 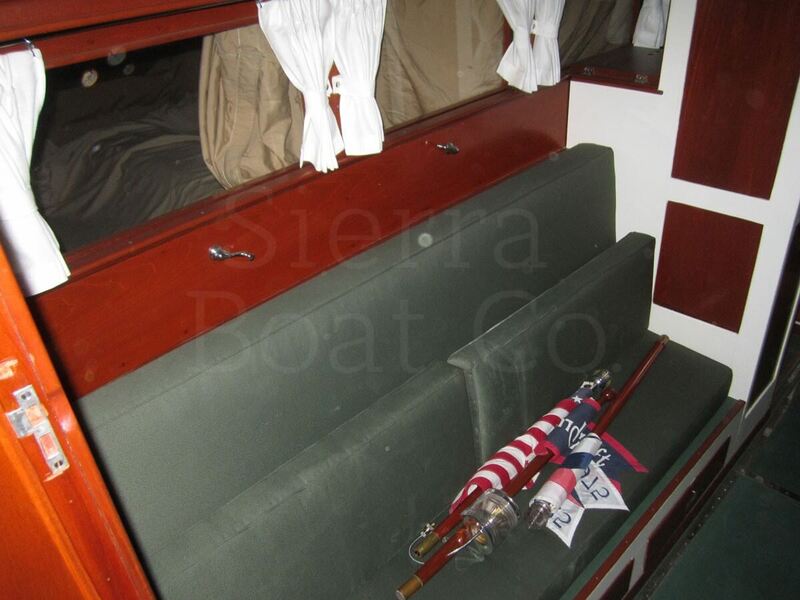 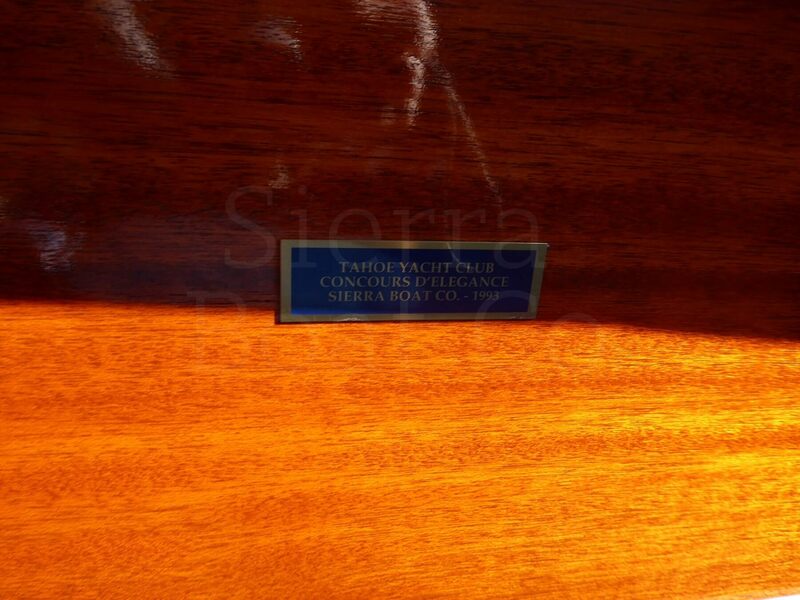 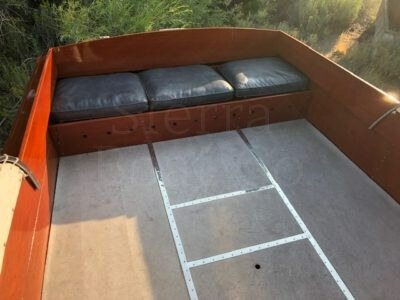 Sierra Boat has been the primary caretaker of this boat since its restoration in the mid 90’s. 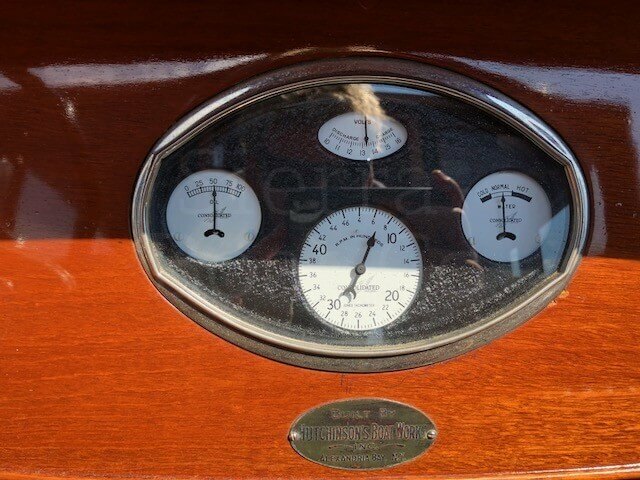 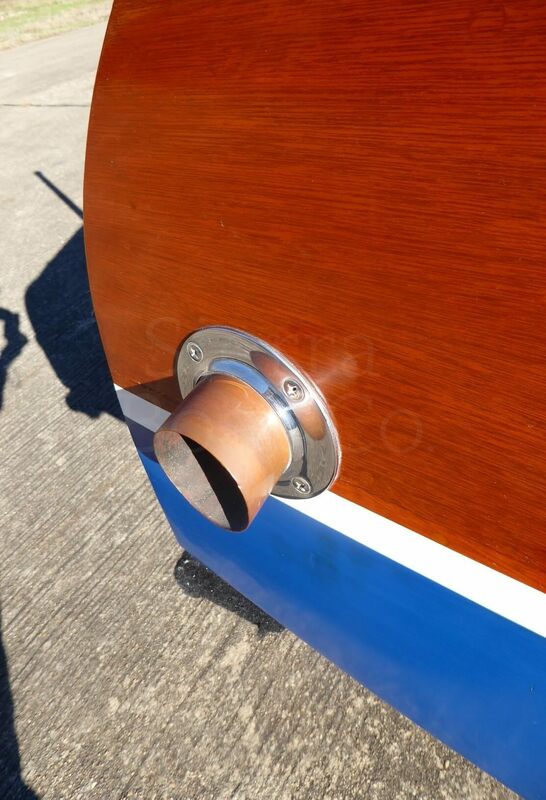 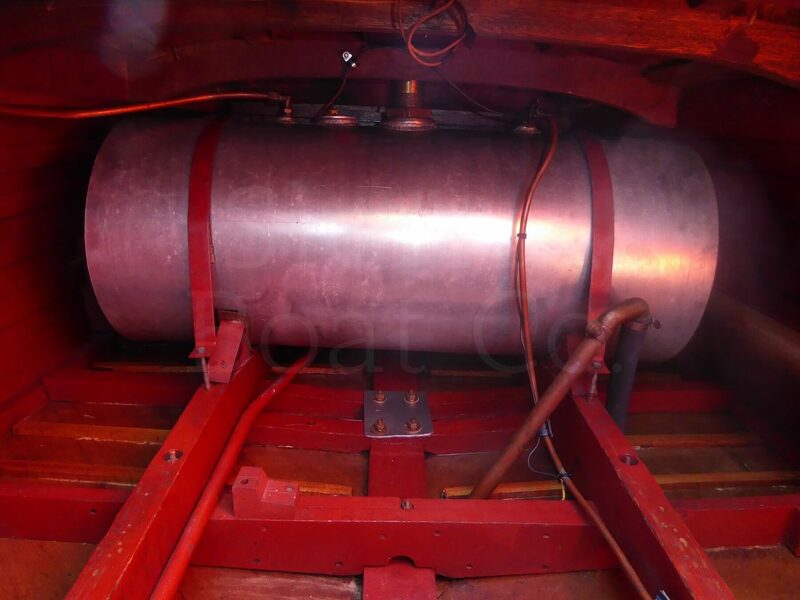 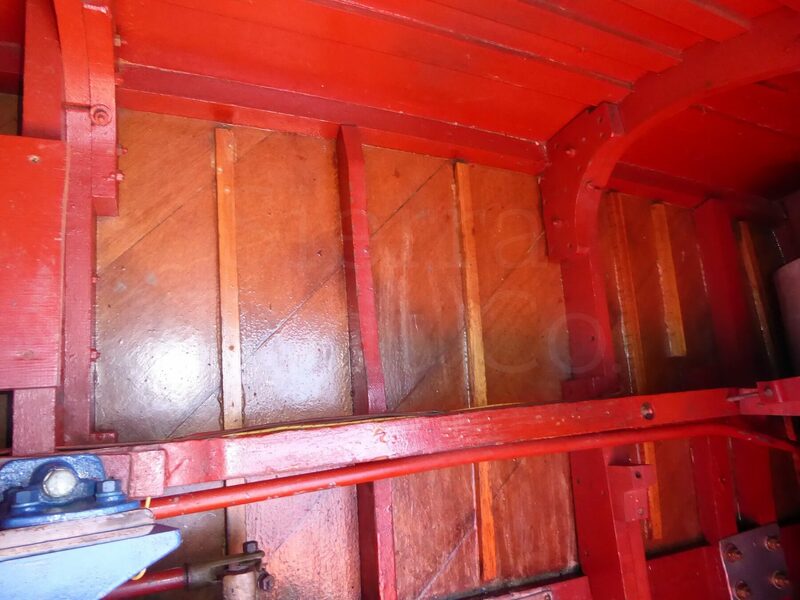 It has been well taken care of and was recently completely re-varnished and the engines were totally re-built. This is a perfect boat for Tahoe and capable of handling rough water with ease. 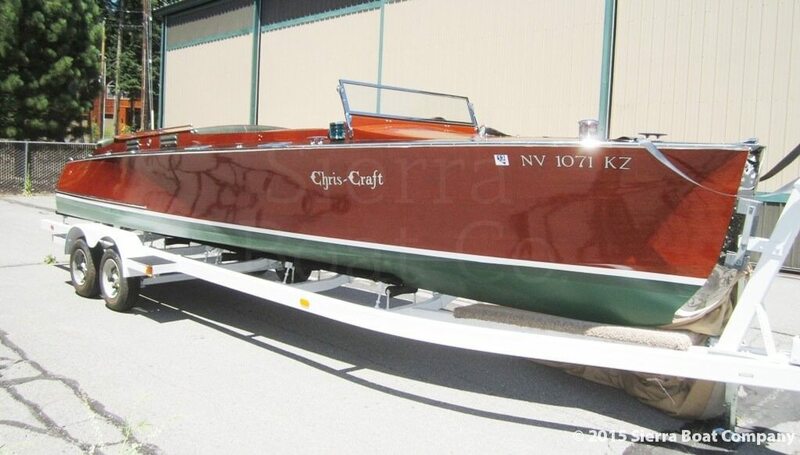 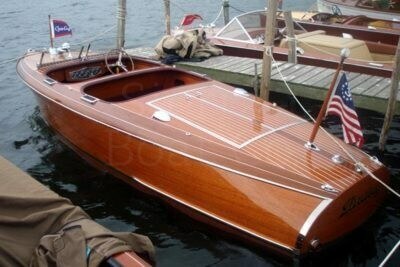 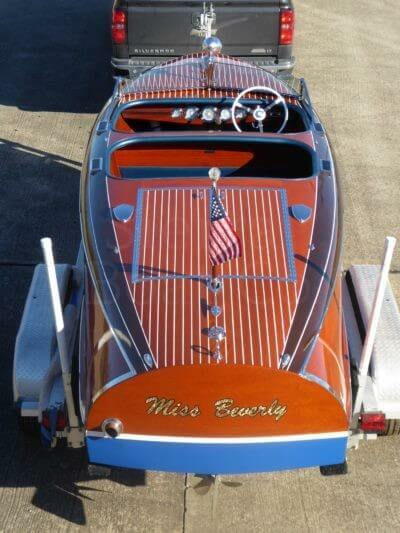 1941 Chris Craft 19ft Custom Runabout. 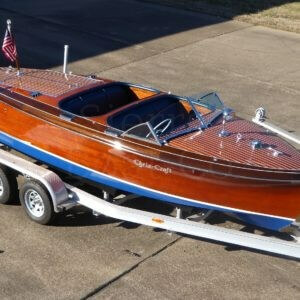 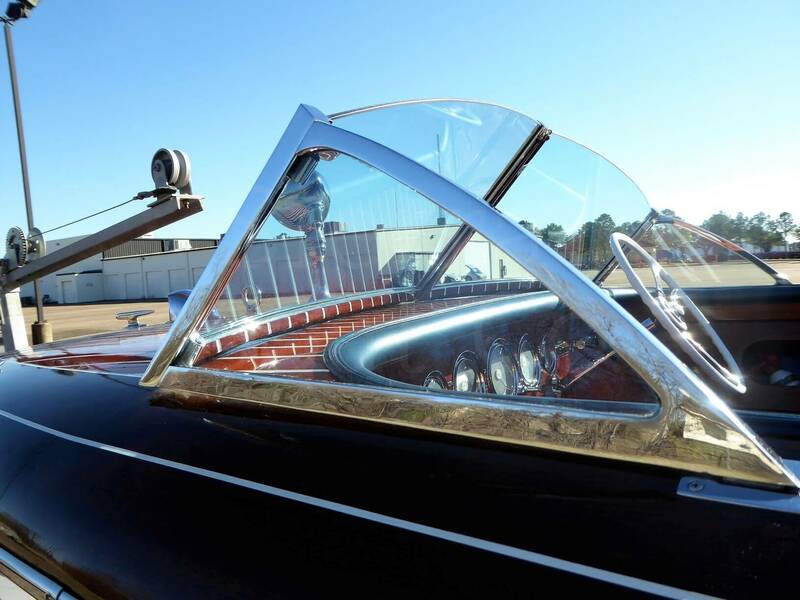 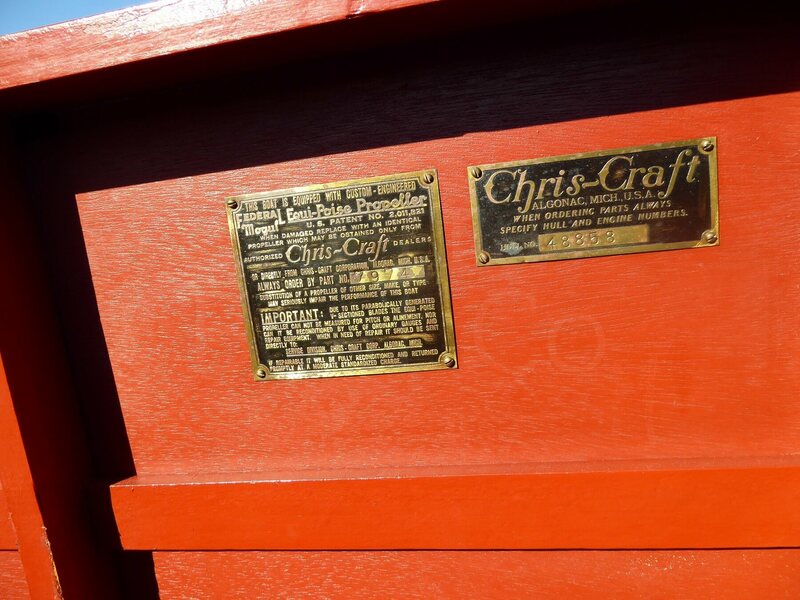 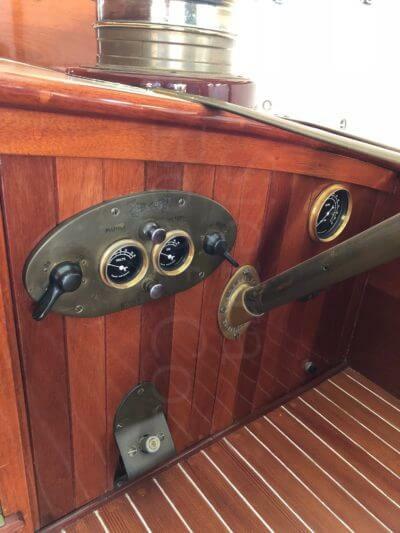 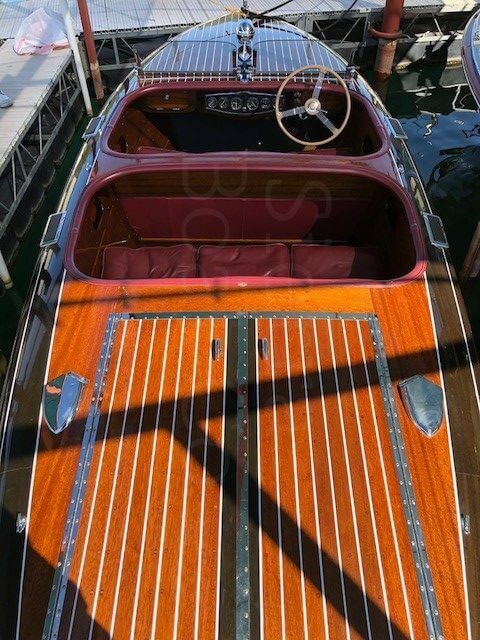 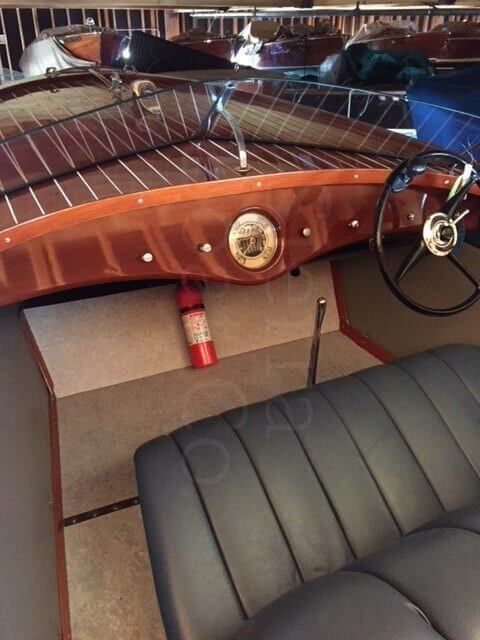 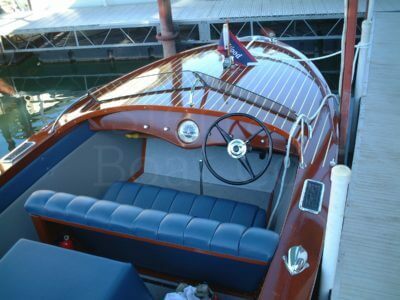 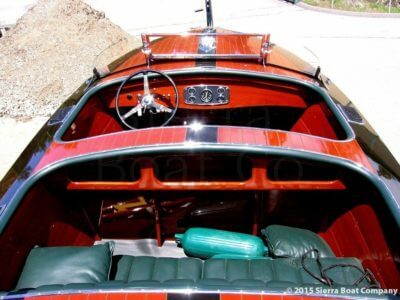 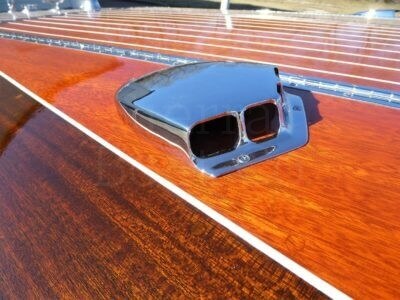 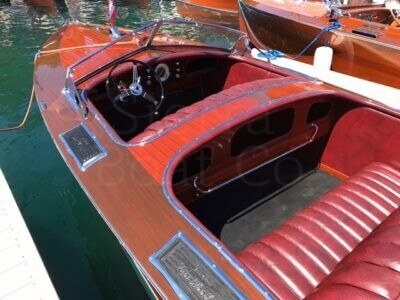 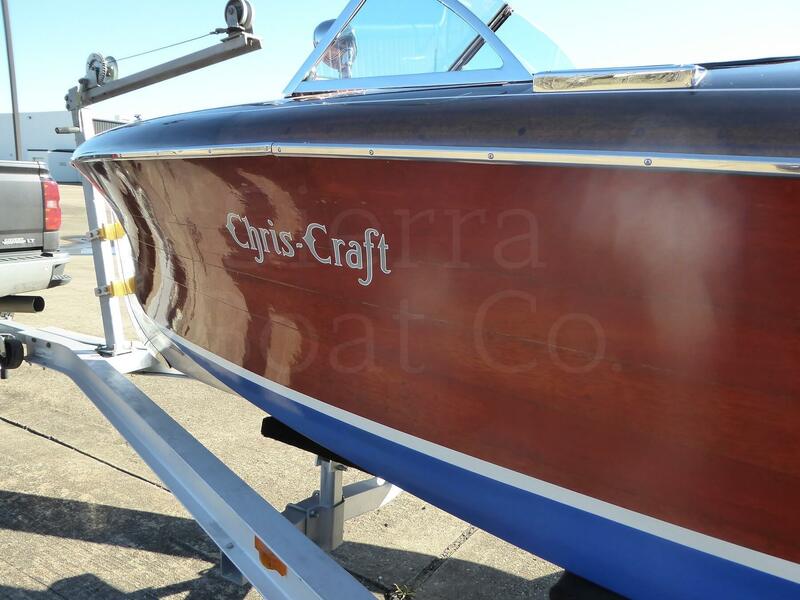 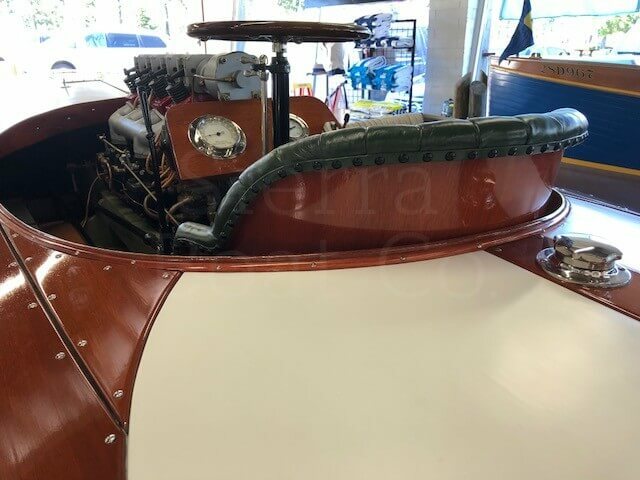 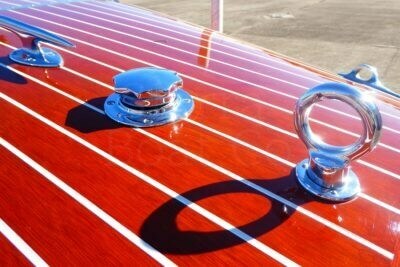 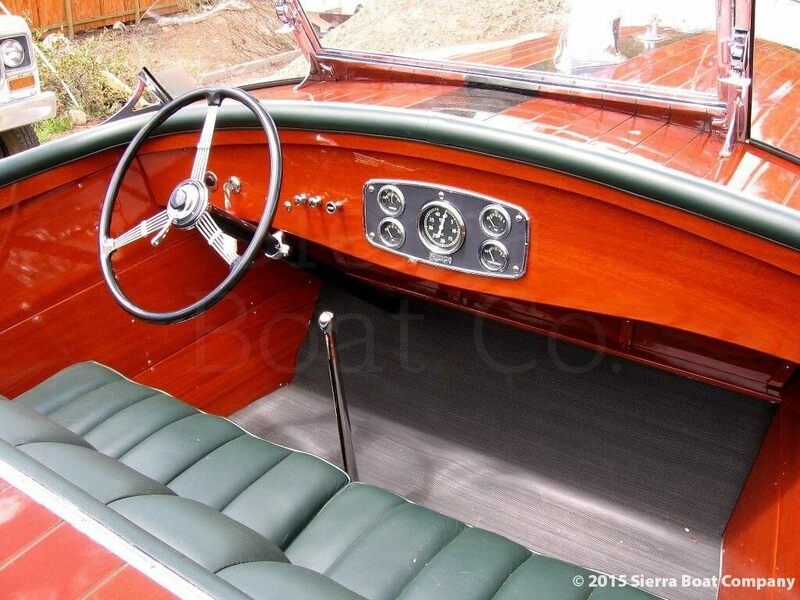 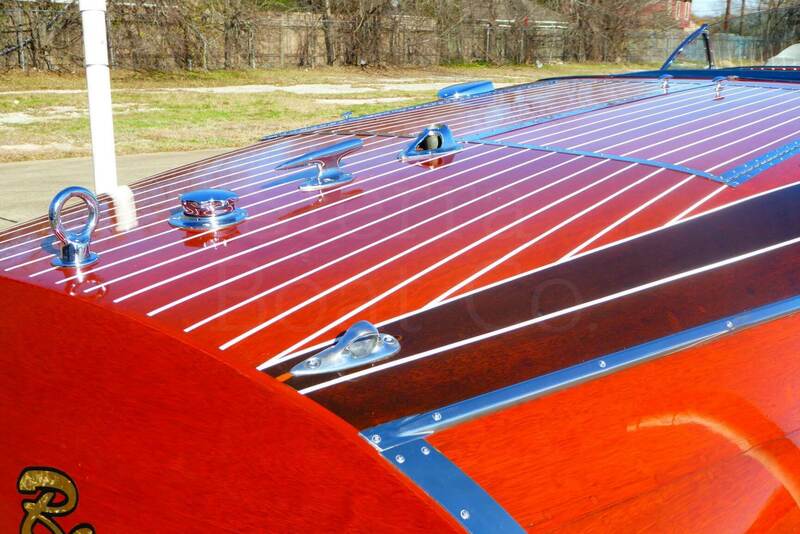 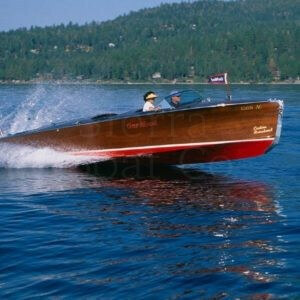 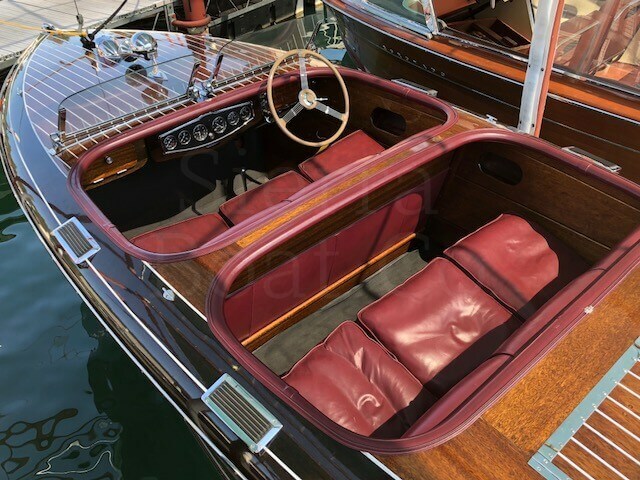 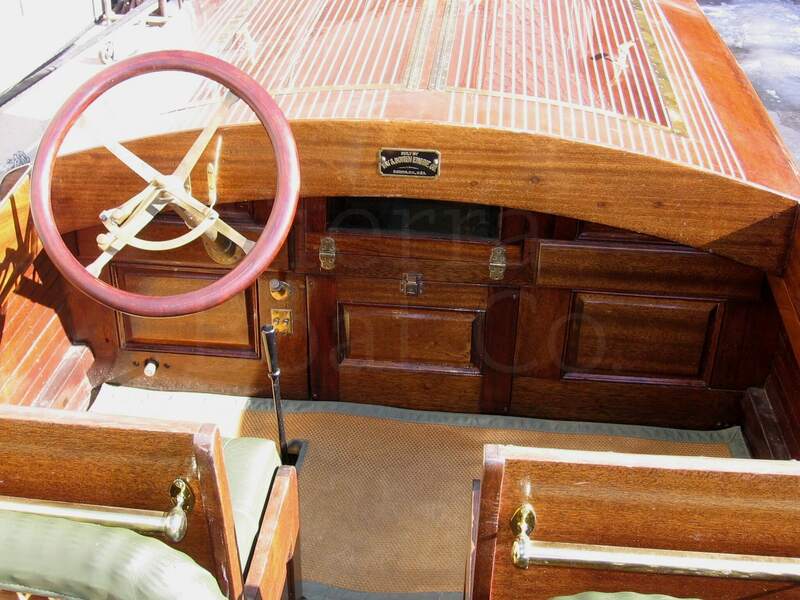 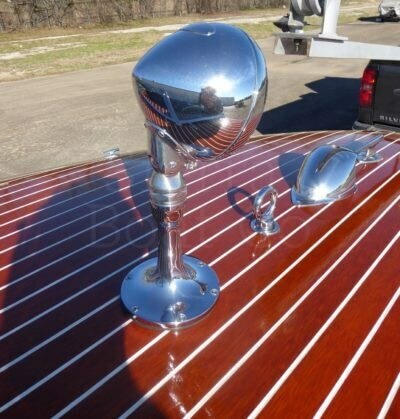 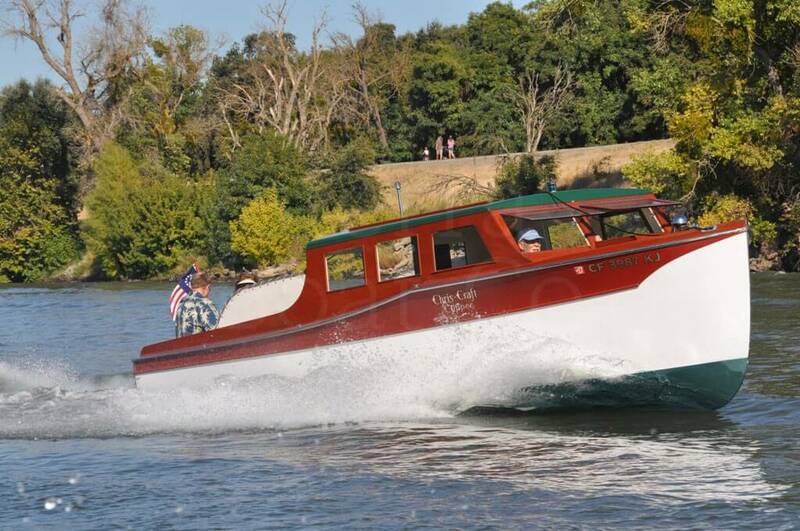 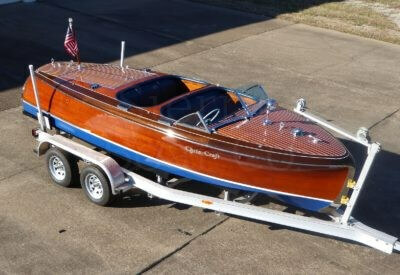 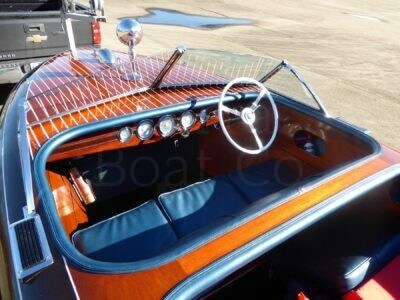 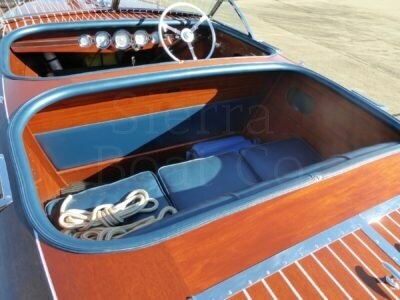 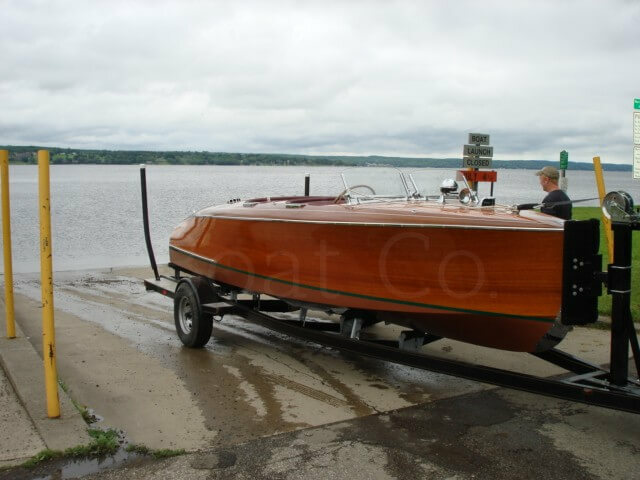 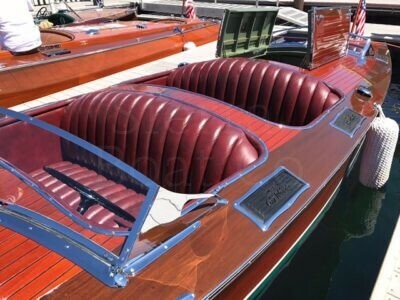 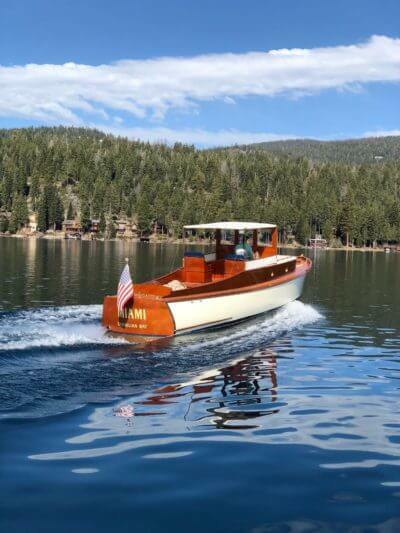 The pre-war Chris Craft Custom Runabouts are the most iconic and collectible of all of the vintage runabouts. The 19’ version was built from 1939 to 1942. 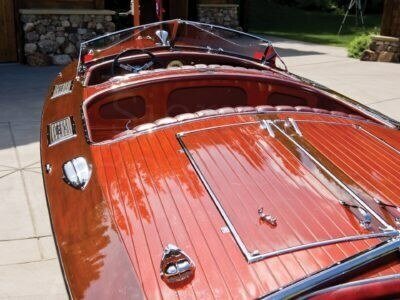 The vintage boat hobby refers to these boats as barrel backs. 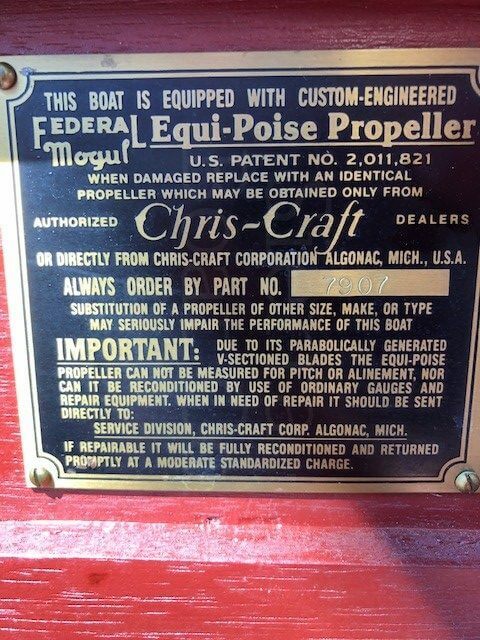 This is a hobby term and was never a factory name, the correct model name for the 19’ being a “custom”. 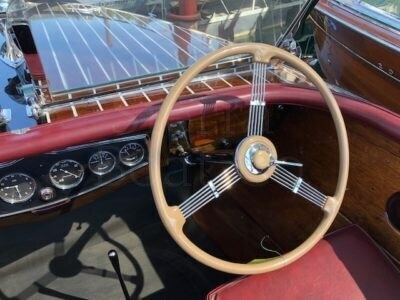 In the first two years this model had a more pointed bow and fold down small windshields, often termed Bugatti windshields. 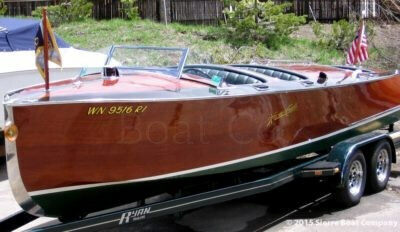 For the model year 1941 and later, the hull received a more rounded bow and a four panel, folding windshield. 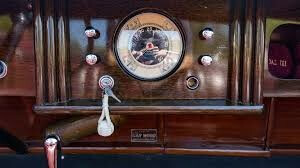 Collectors have their preferences and the style is a matter of taste more than function. In the water they are essentially the same boat. The boat featured here is an older restoration with little use. 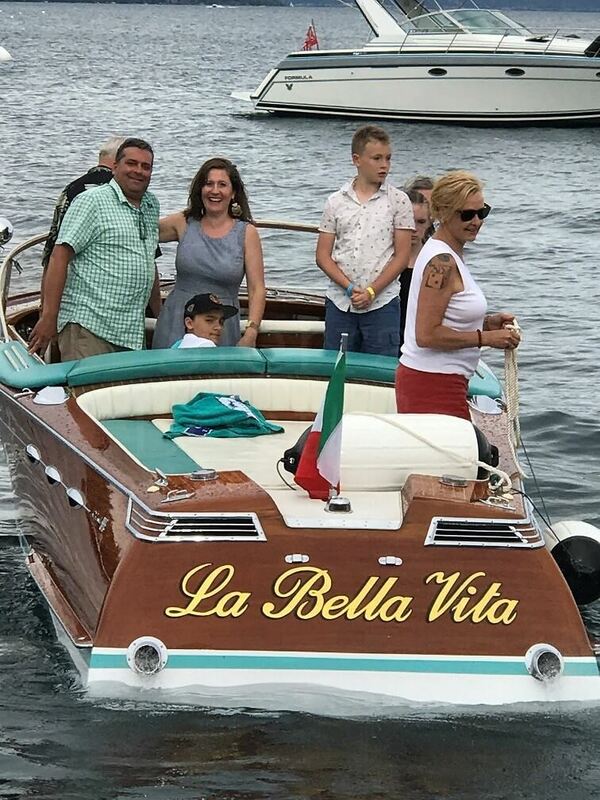 It was purchased by the current owner at the Tahoe Concours d’Elegance boat show and has primarily been used on Lake Tahoe. 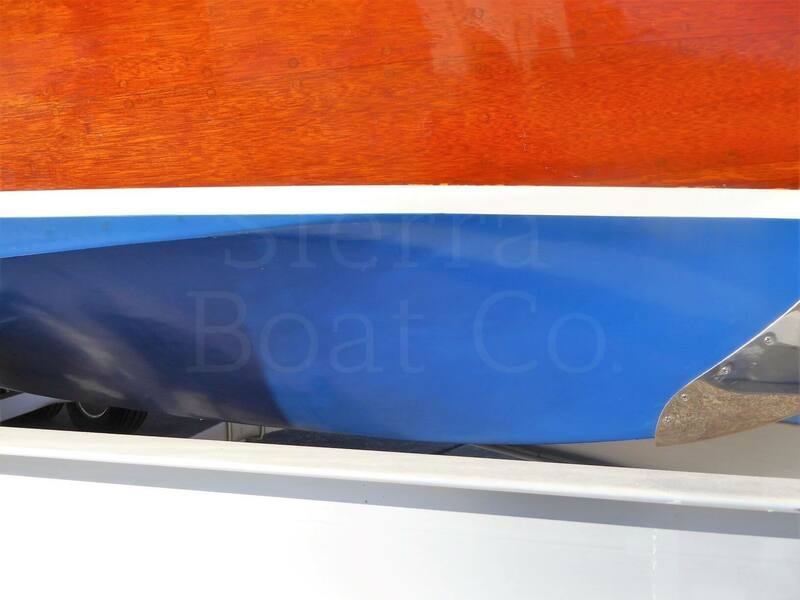 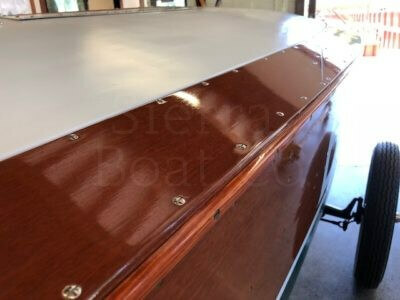 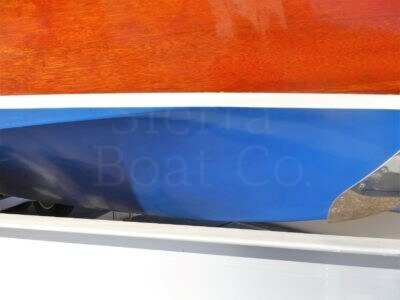 A key feature on this boat is a glued West System bottom which is the ultimate bottom for durability. This boat can be dry launched without soaking. 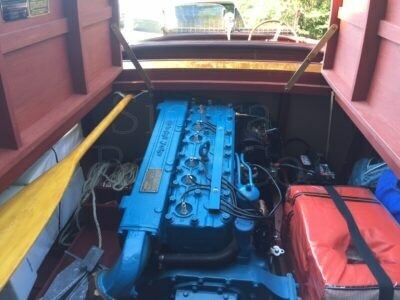 It also features a later series M type engine from the late 50’s. 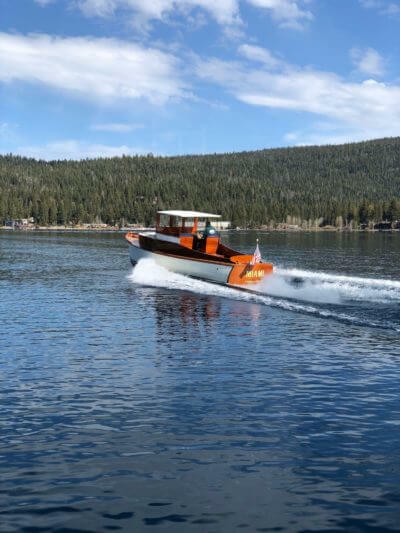 The MCL engine makes 175 hp which is 45 hp more than the original 130 hp model M. This means that the boat will really perform, especially in Tahoe’s higher altitude. 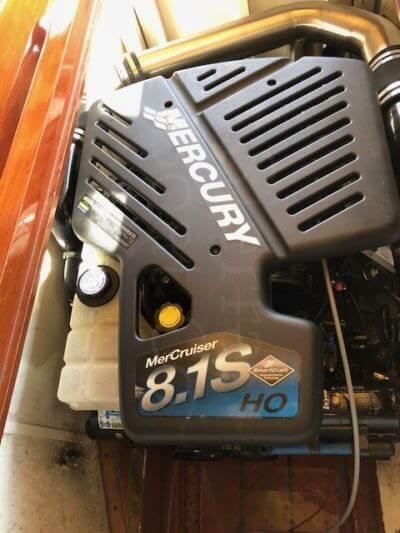 It also features a 12V electrical system. 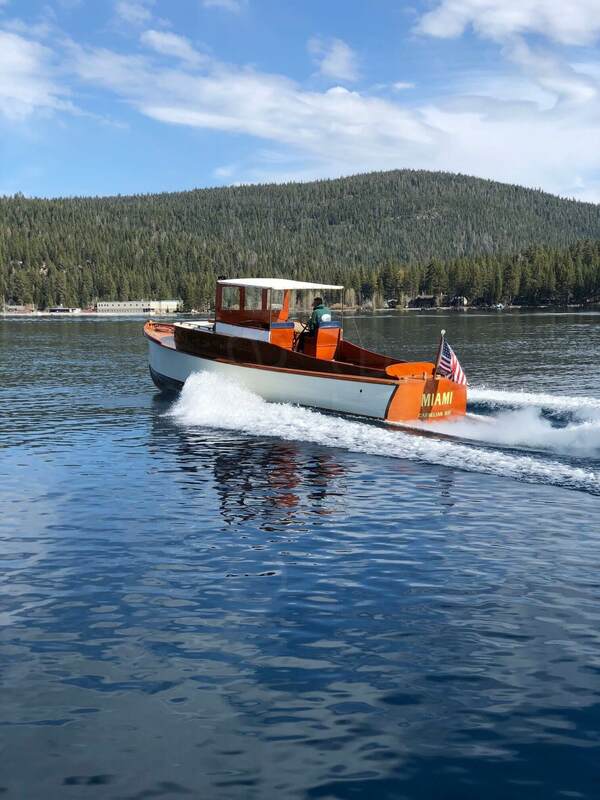 This is not a Concours boat show winner due to the upgraded West System bottom and engine, but if you want a reliable boat you can really use, this is the one for you! 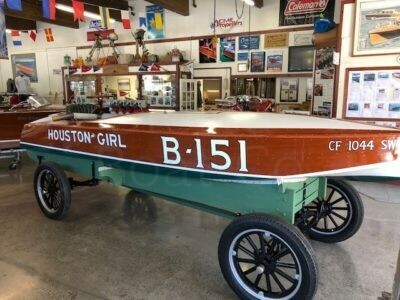 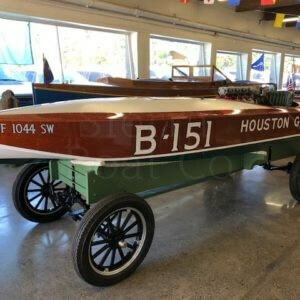 “Houston Girl” is a 1928 17ft Custom Hacker 151 Class Pelican single step racing hydroplane. 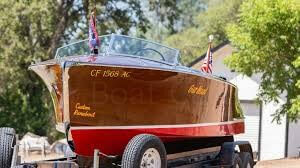 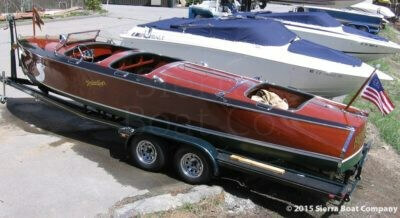 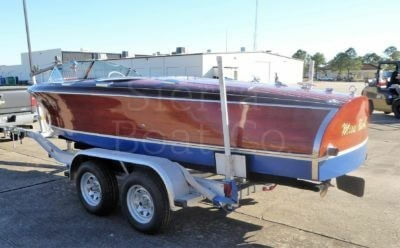 This boat is a John Hacker design which ran in the limited 151 cu.in. 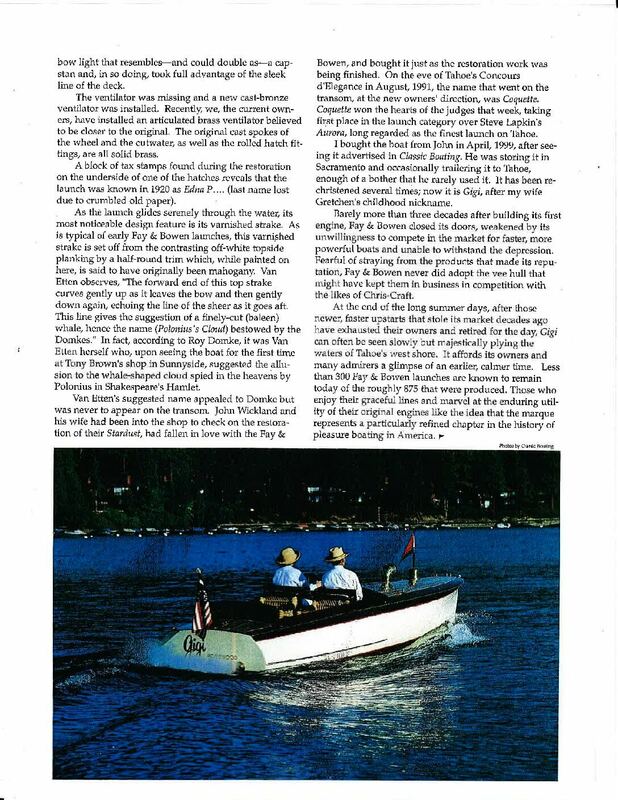 displacement class in the late 1920’s and early 1930’s, a support class running with the APBA Gold Cup race series. 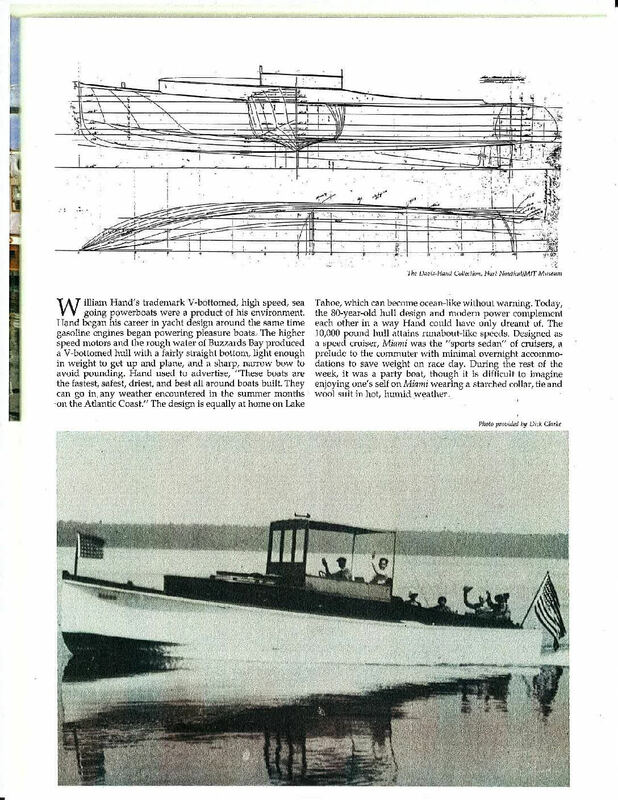 Commodore Henry Faulk of the Houston Yacht Club and President of the Mississippi Valley Power Boat Association had her built. 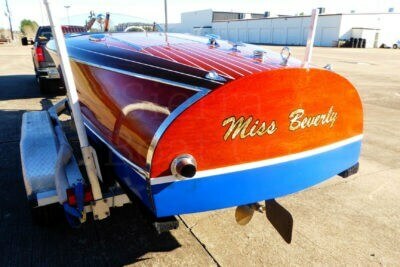 She was campaigned from Havana, Cuba to San Diego, California. 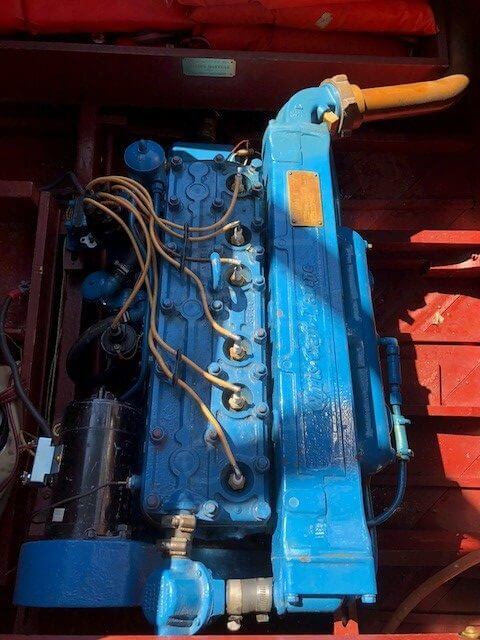 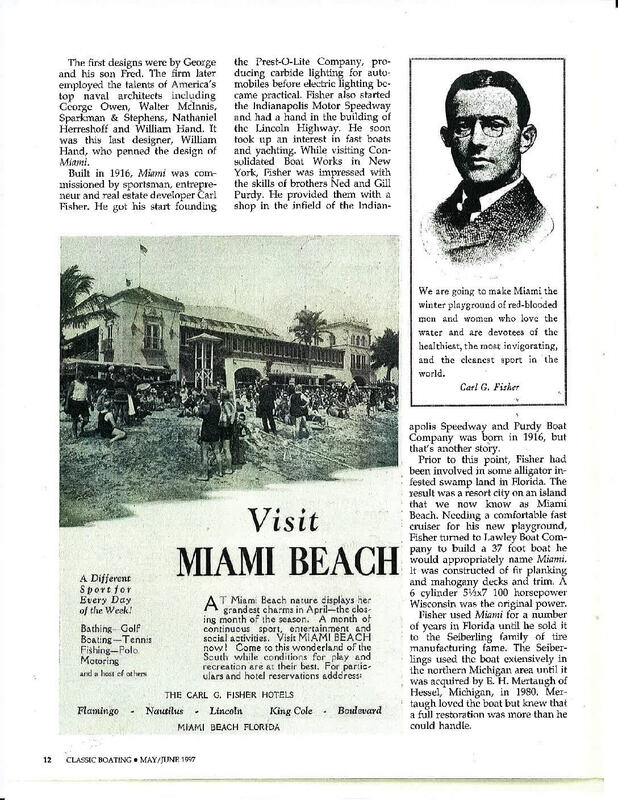 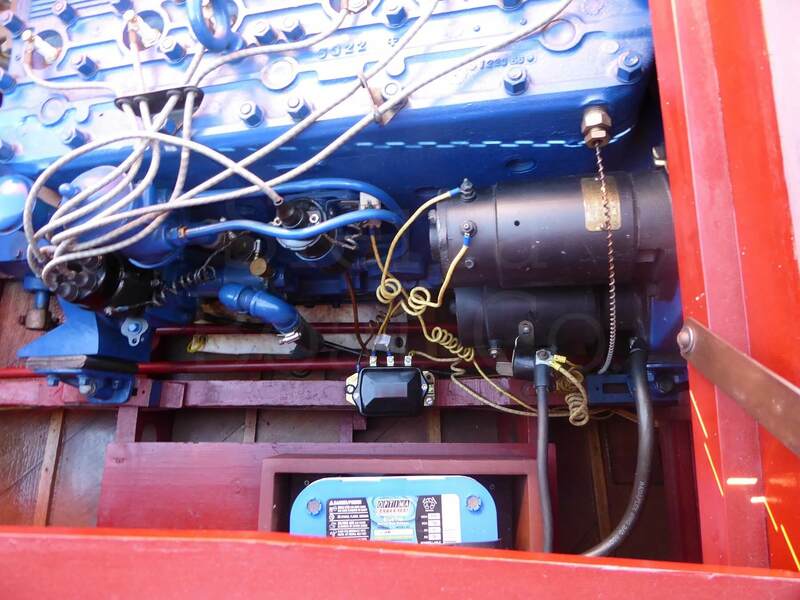 The Peerless 151 motor was restored by John Allen of Allen’s Marine Engines. 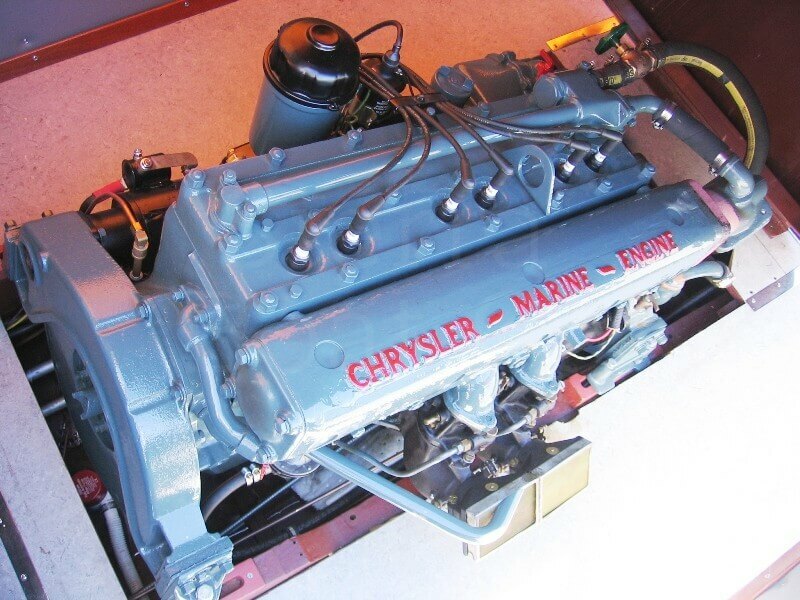 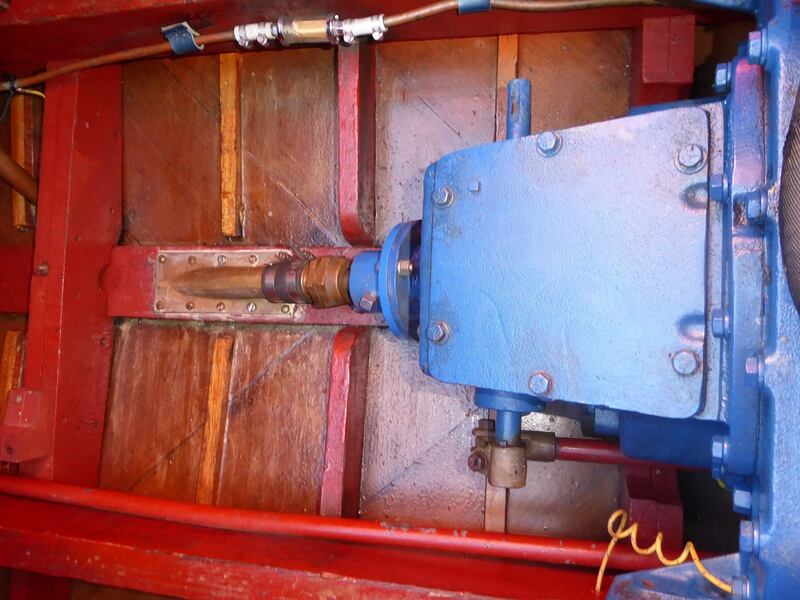 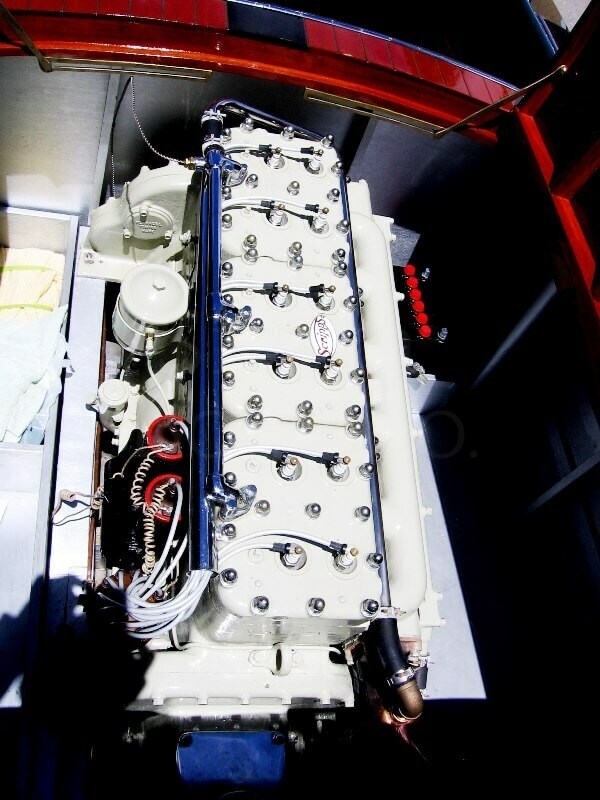 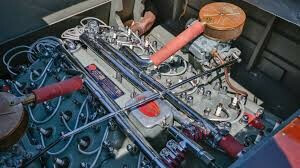 John Allen is considered to be one of the top vintage marine engine restorers on the west coast. 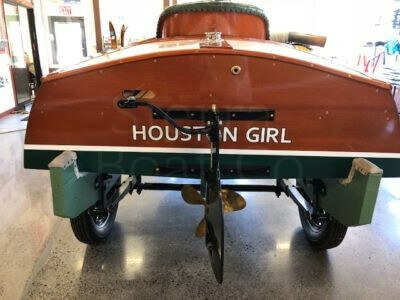 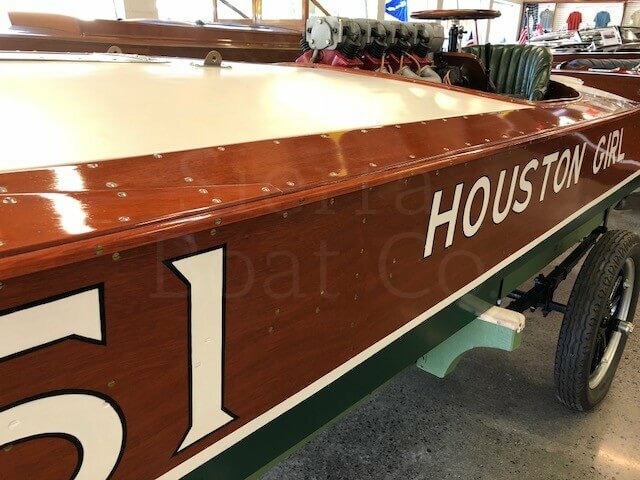 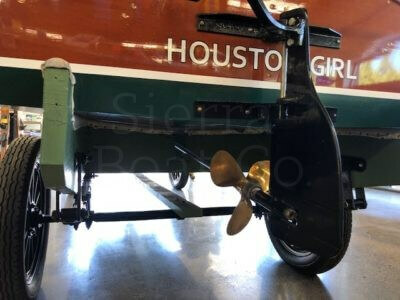 But not only did John Allen restore the motor for “Houston Girl”, he completed the restoration of the boat and the original vintage trailer too. 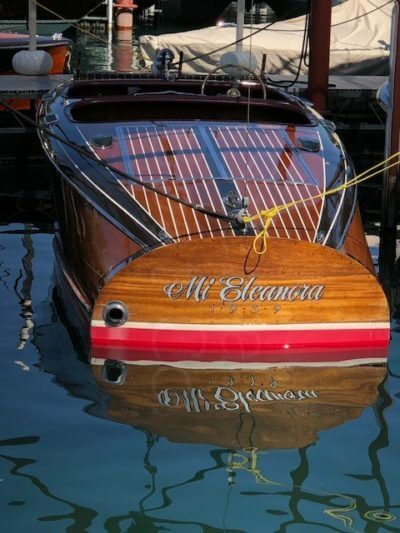 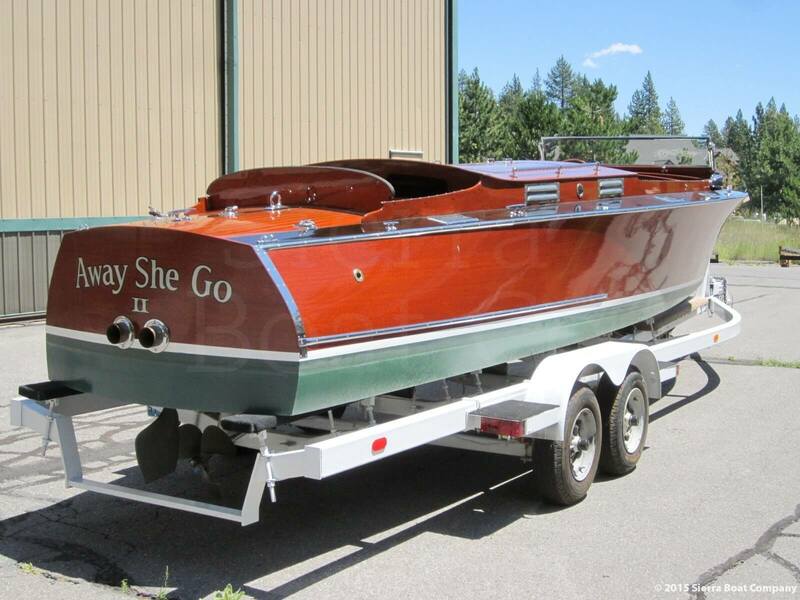 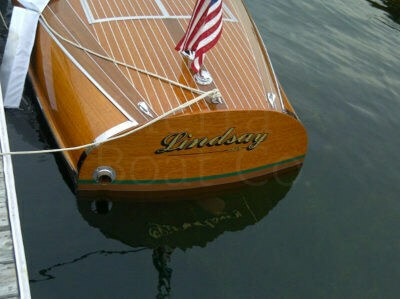 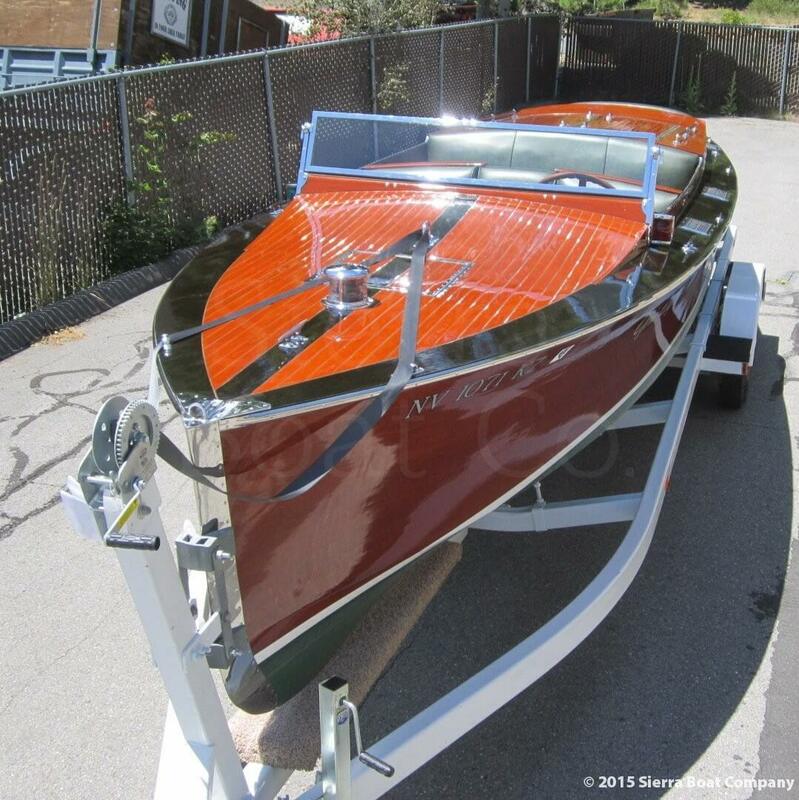 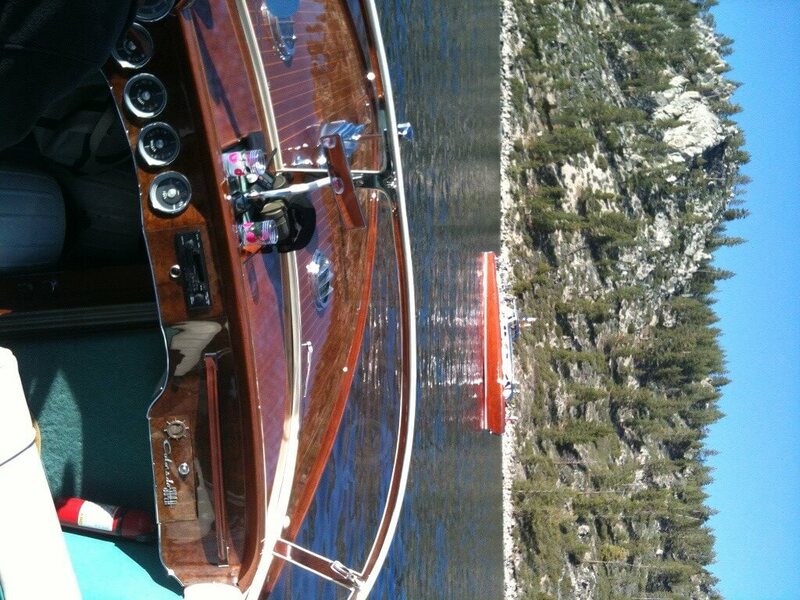 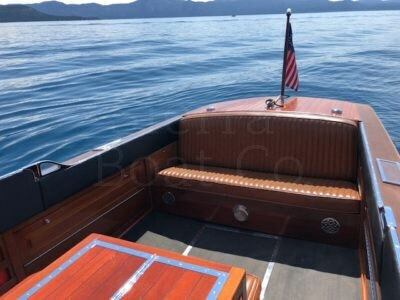 She was completed in 2010 in time for the Lake Tahoe Concours d’Elegance in June. 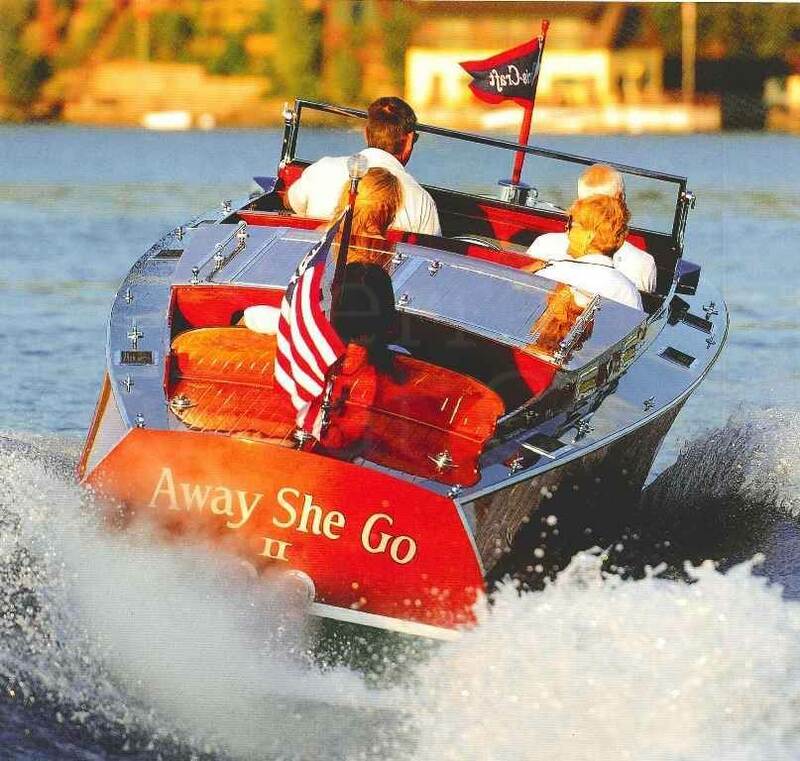 “Houston Girl” was awarded the Most Unique Boat of Show and Best Hacker Craft of Show at the prestigious 2010 Lake Tahoe Concours d’Elegance. 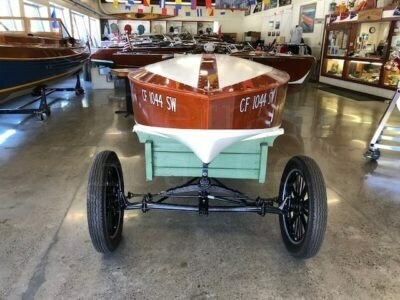 This is a 1929 Chris Craft 38ft Custom Commuter. 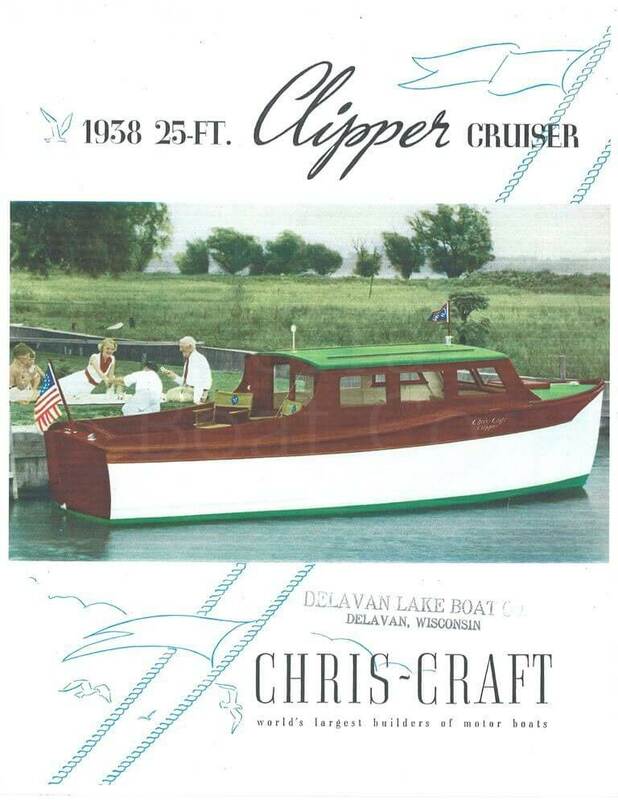 The Custom Commuter was Chris Craft’s first cruiser type boat. 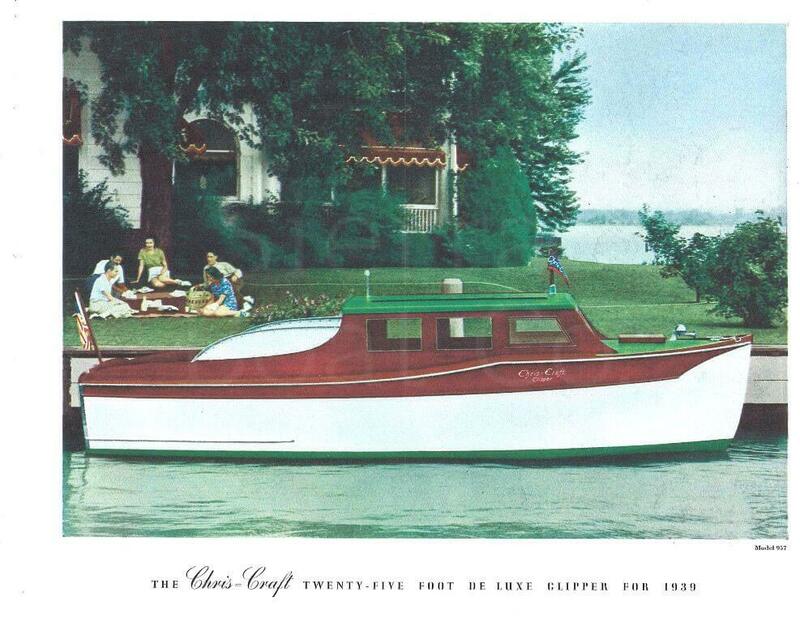 The Commuter name comes from the use of this type of boat to “commute” from Long Island sound to Manhattan. 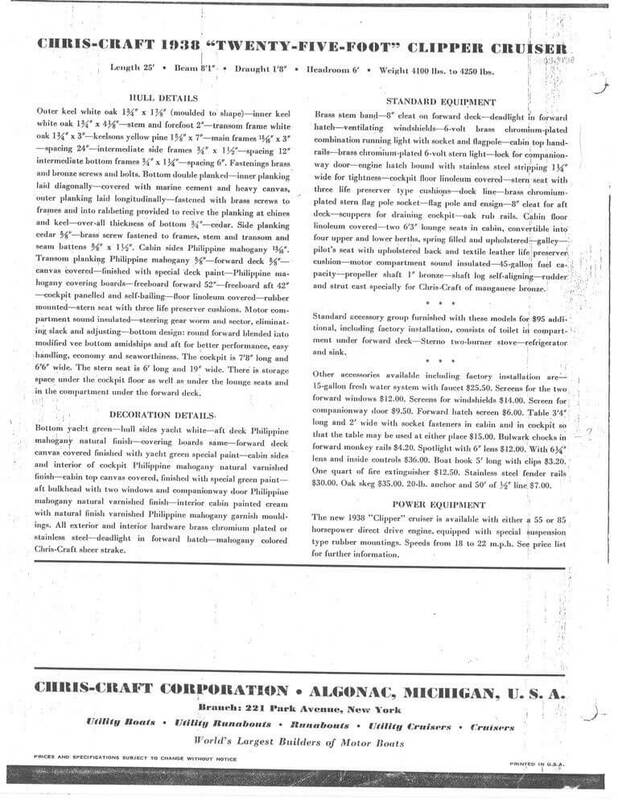 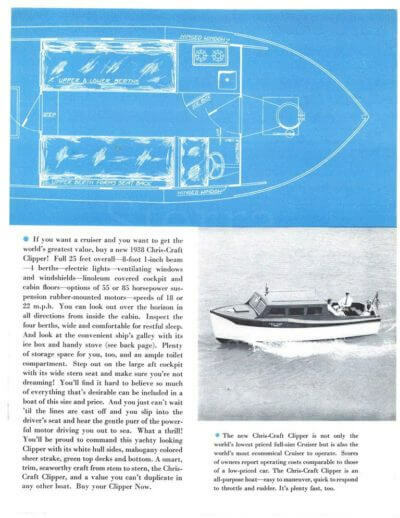 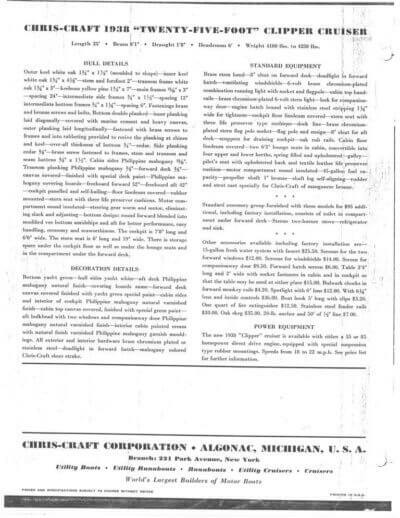 At the time the only boats available were custom built boats and Chris Craft saw an opportunity to build a production boat to fill the demand. 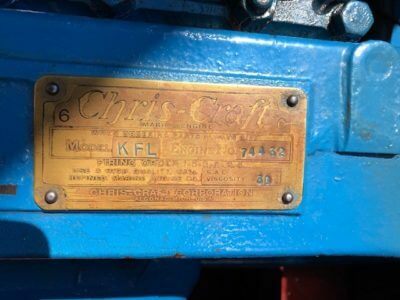 65 examples were built from hull no. 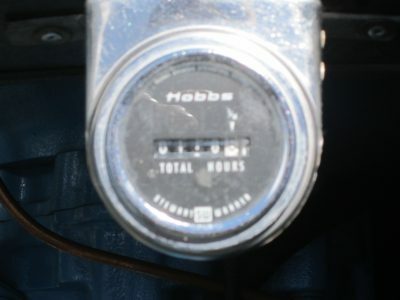 5001 to no. 5065, most of them built in 1929 before the depression killed the demand. 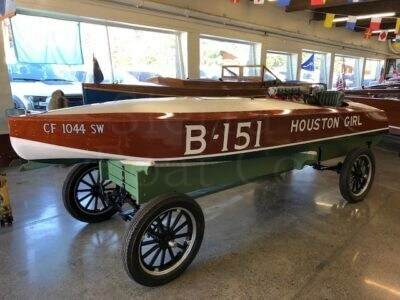 Dat-So-La-Lee is number 15 in the series. 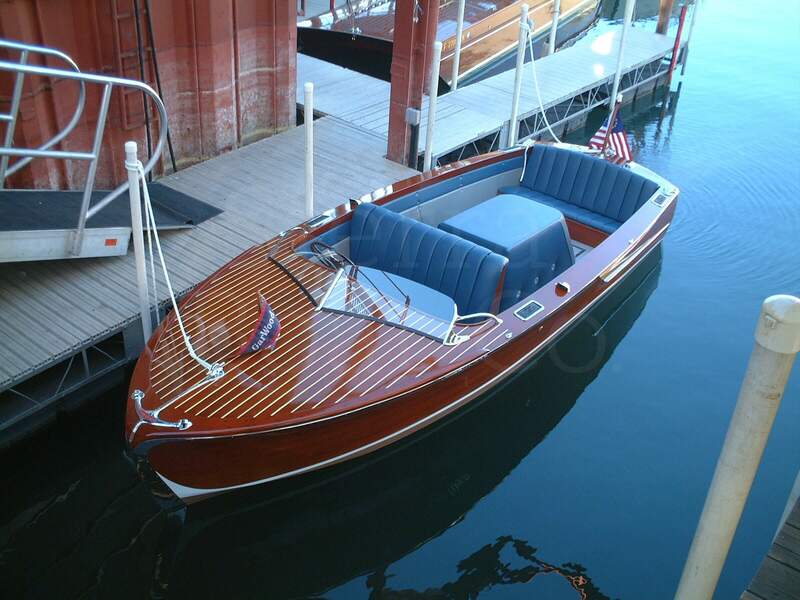 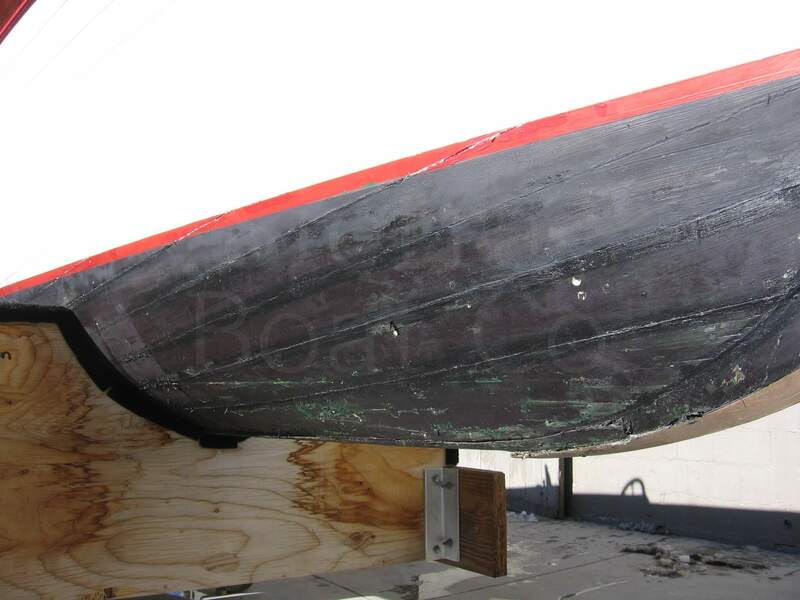 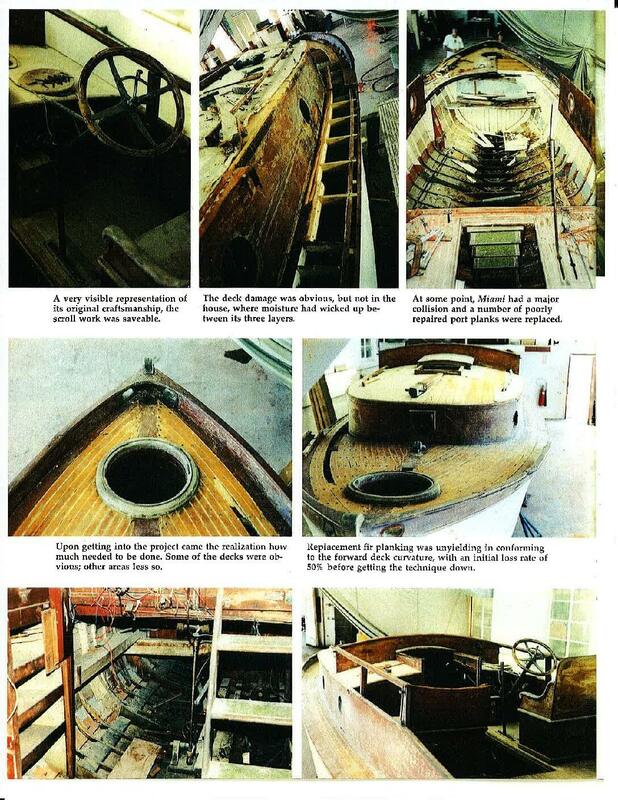 This boat was fully restored in 1991 and has received additional work in later years. 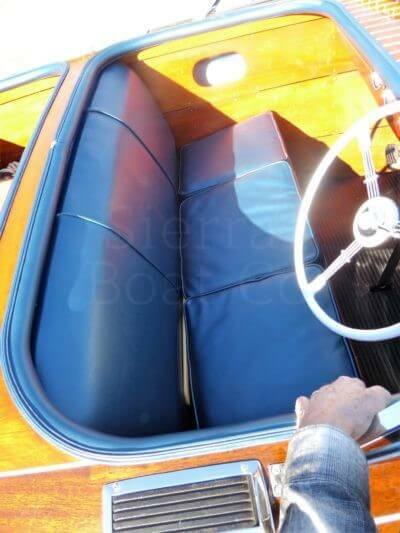 Most notably, the bottom was fully replaced with the 5200 style bottom. 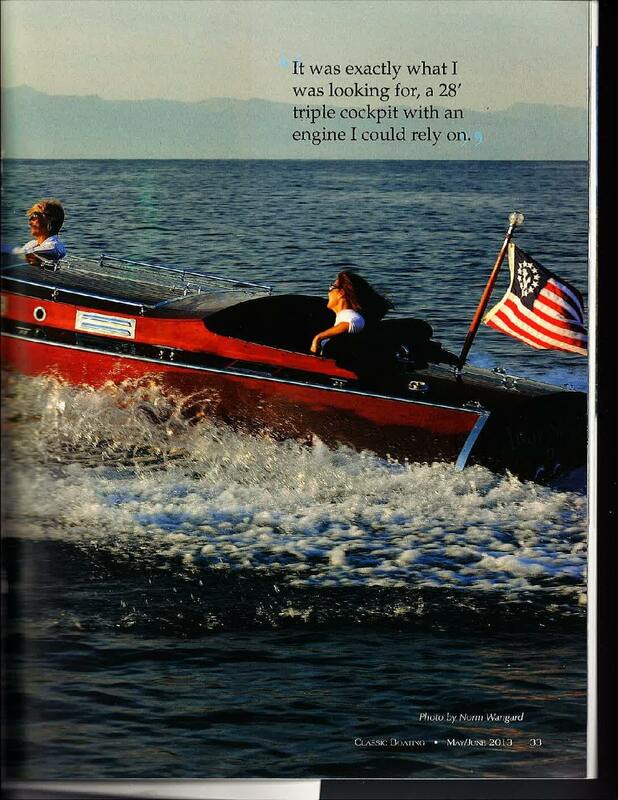 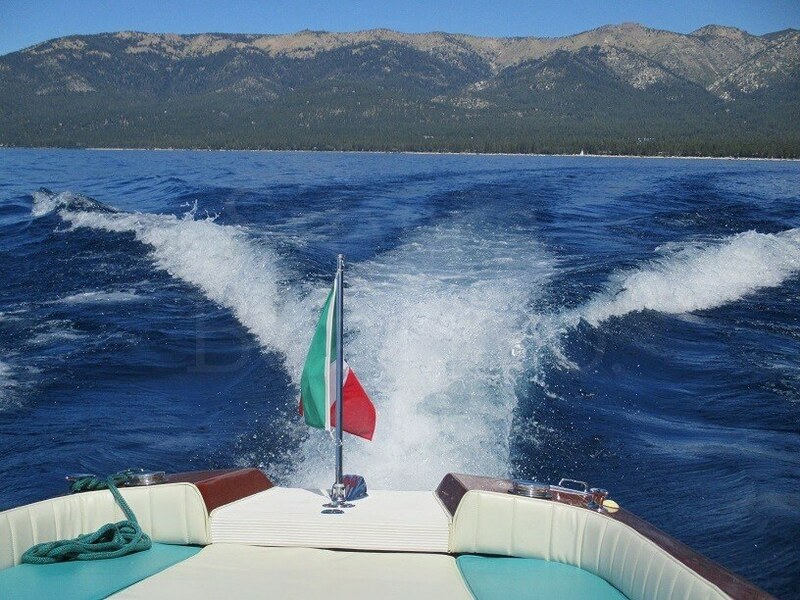 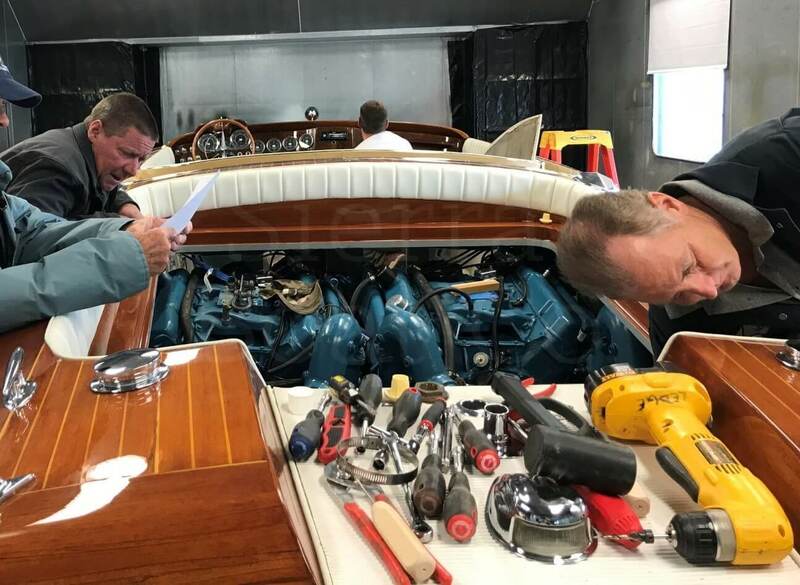 The engine was changed out to a modern Mercruiser 496, giving the power needed in Lake Tahoe’s altitude. 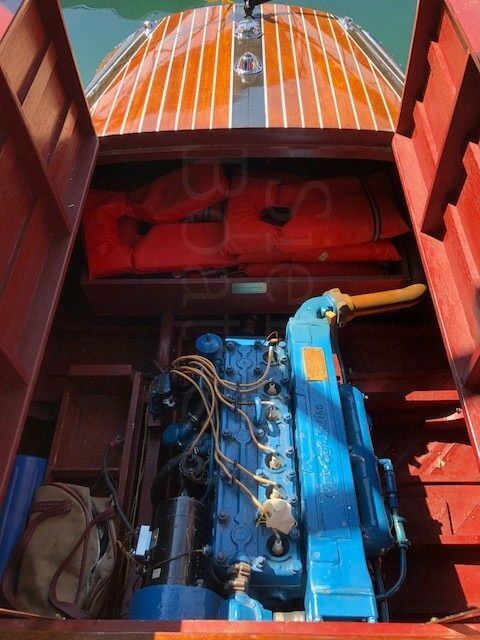 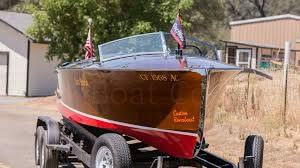 The boat comes with a fully re-built Chris Craft A-120, which was the original engine used before the restoration, but is not the original engine to the boat. 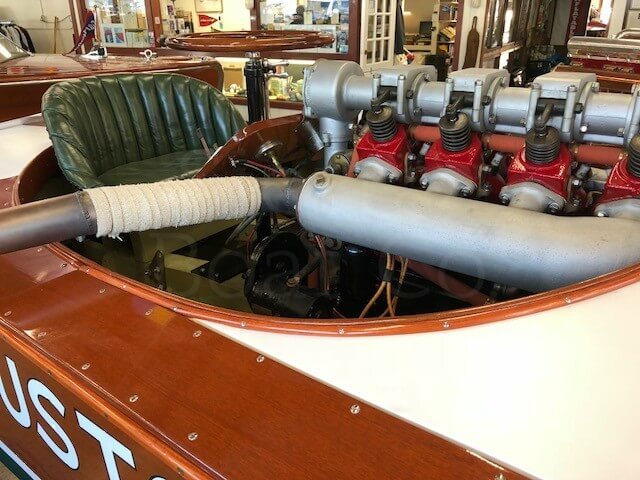 The original engines in 1929 were the A-70 engine of a similar design. 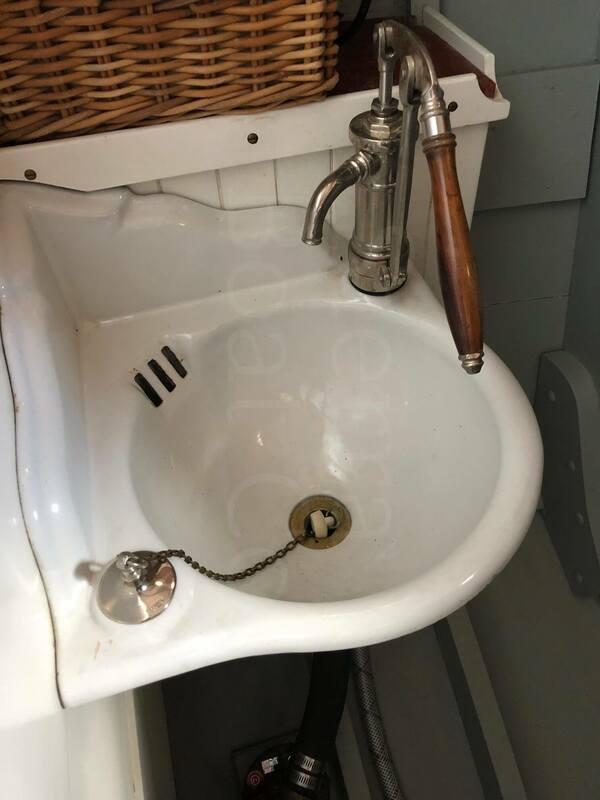 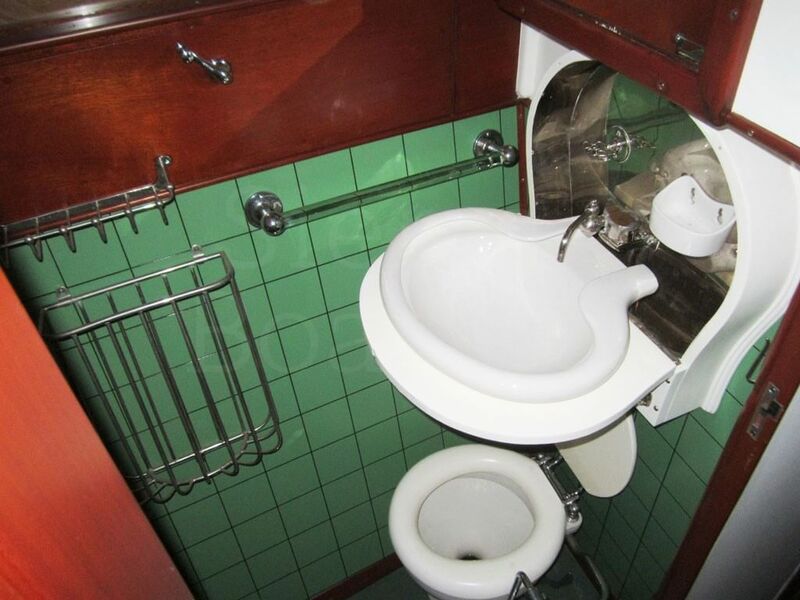 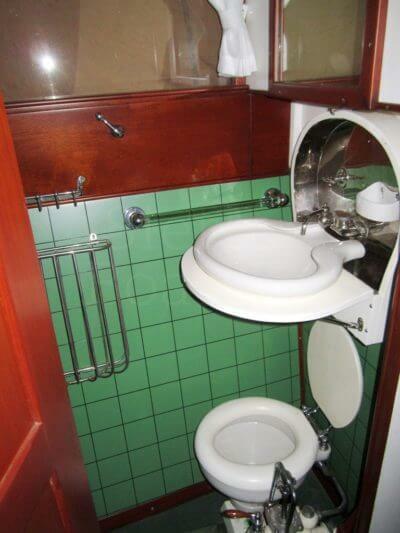 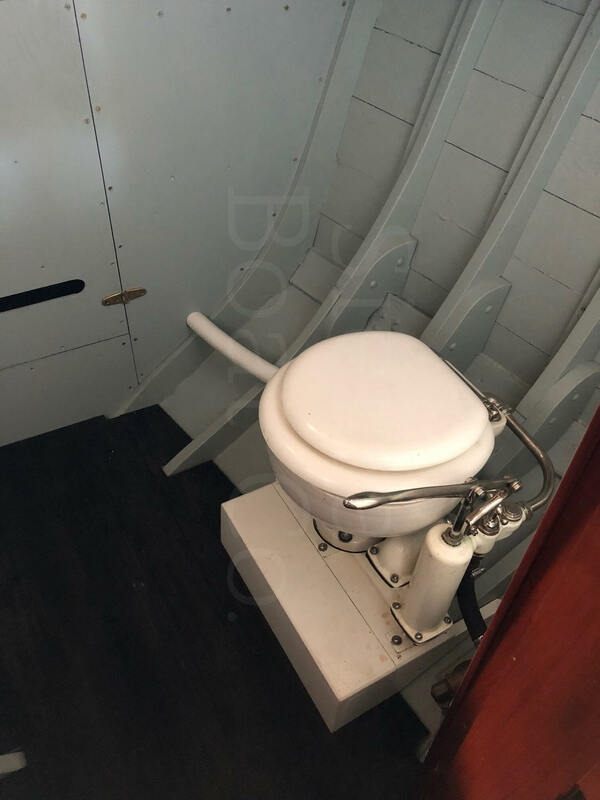 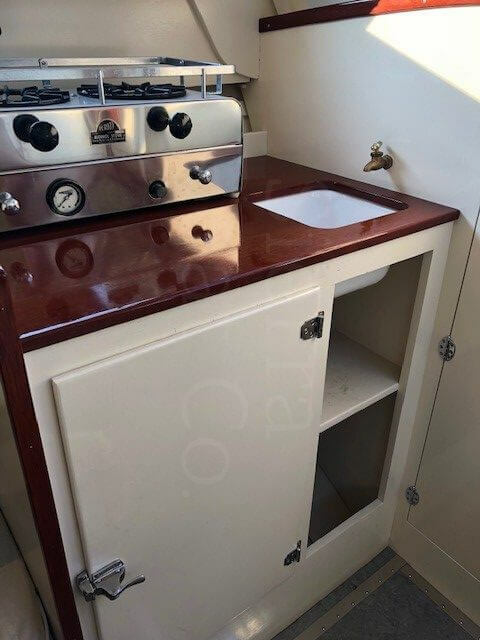 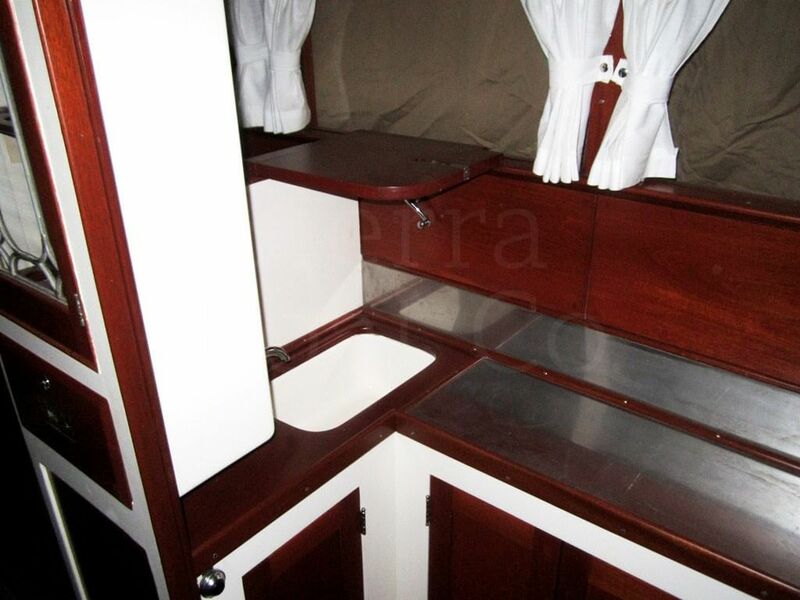 The boat is very original and still has the correct head with a pull-down pull man style sink. 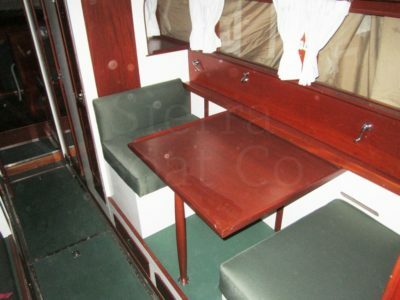 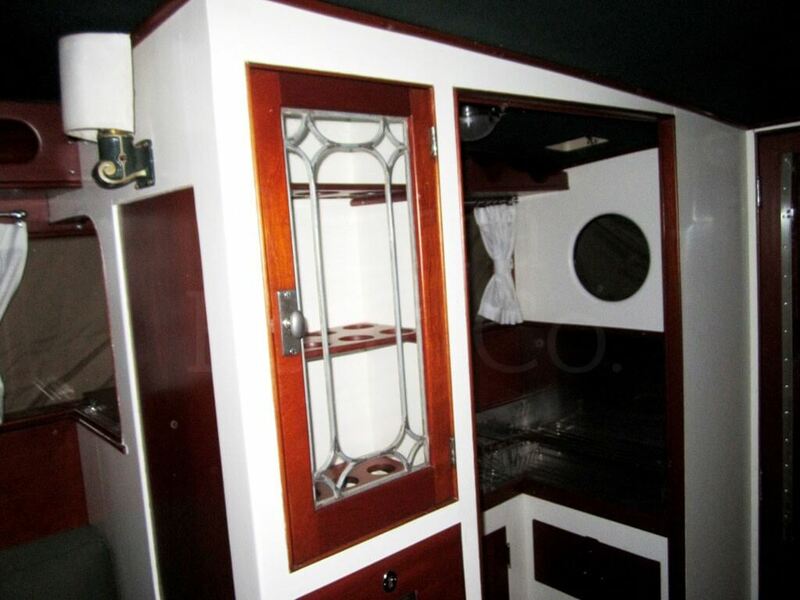 The main modification was the conversion of double bunks to a table and benches. Otherwise, every attempt was made to retain originality throughout using the original factory drawings as a guide. 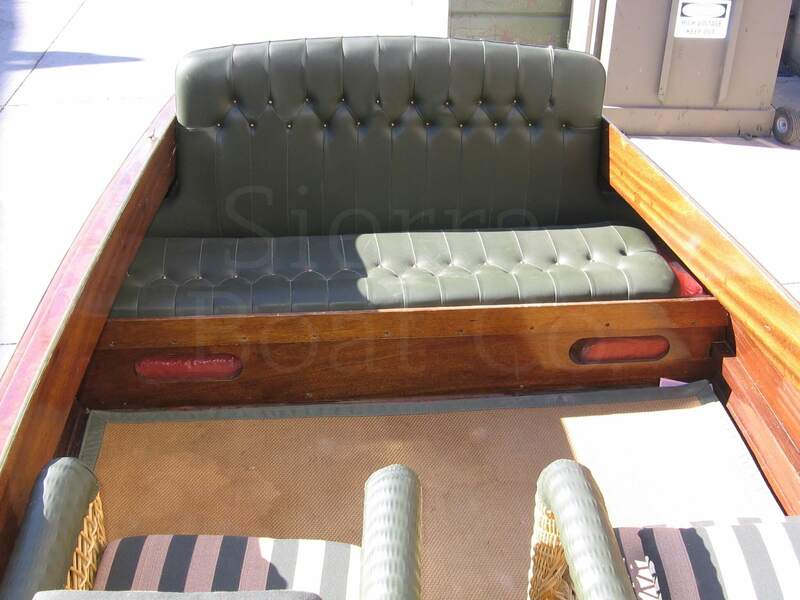 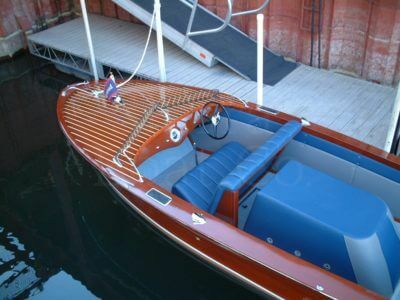 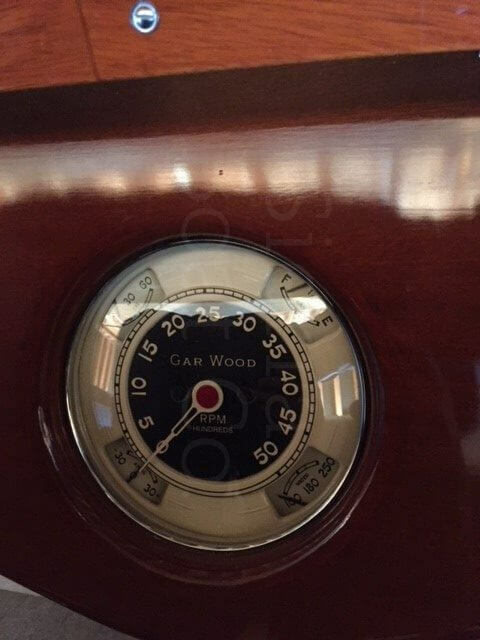 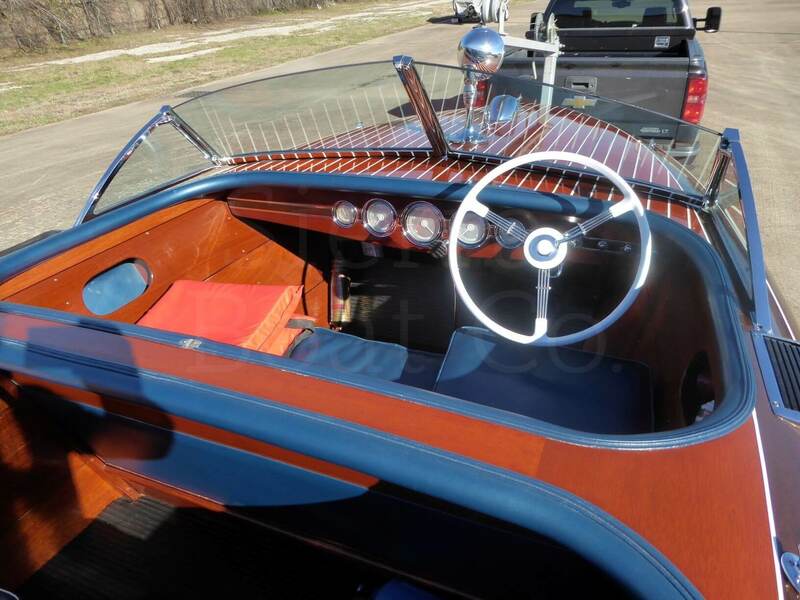 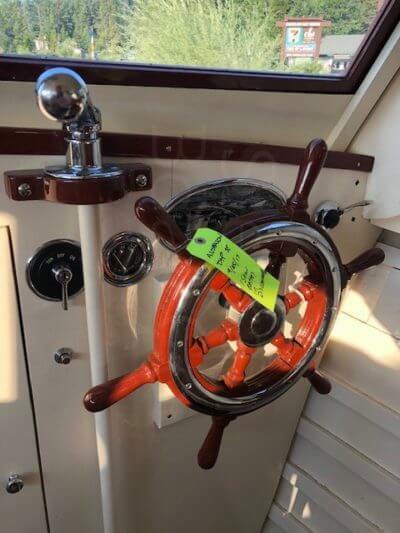 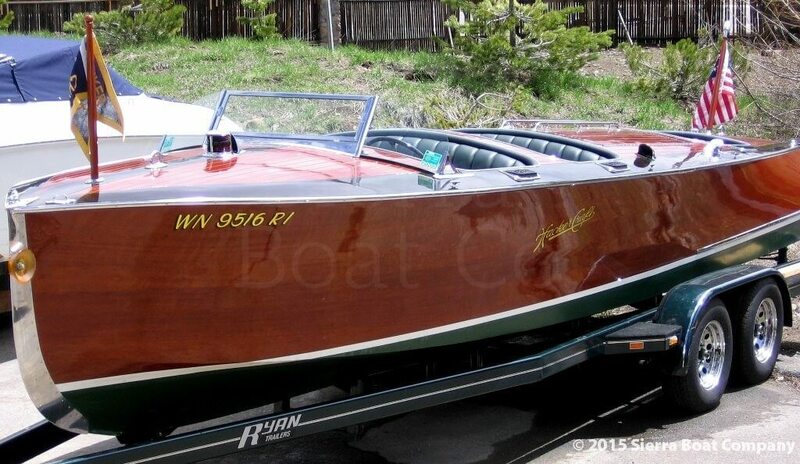 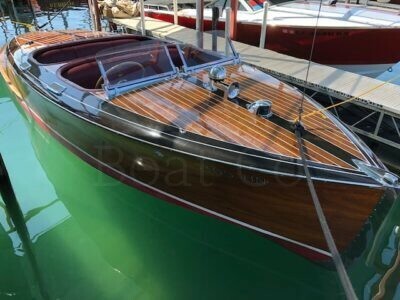 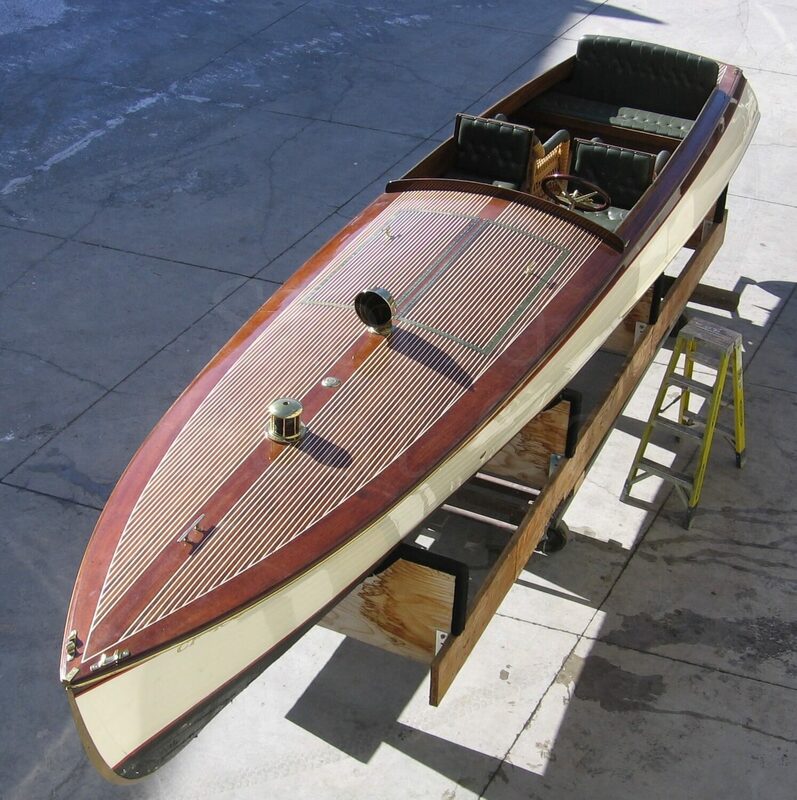 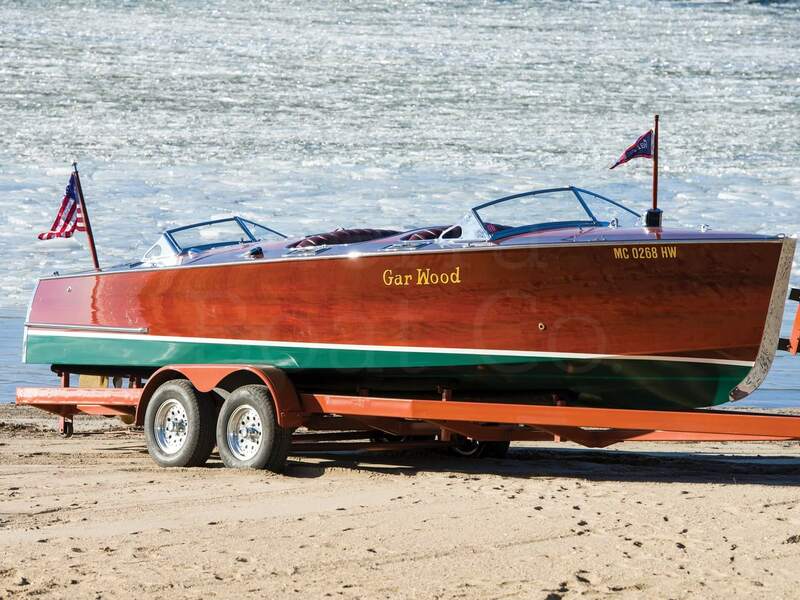 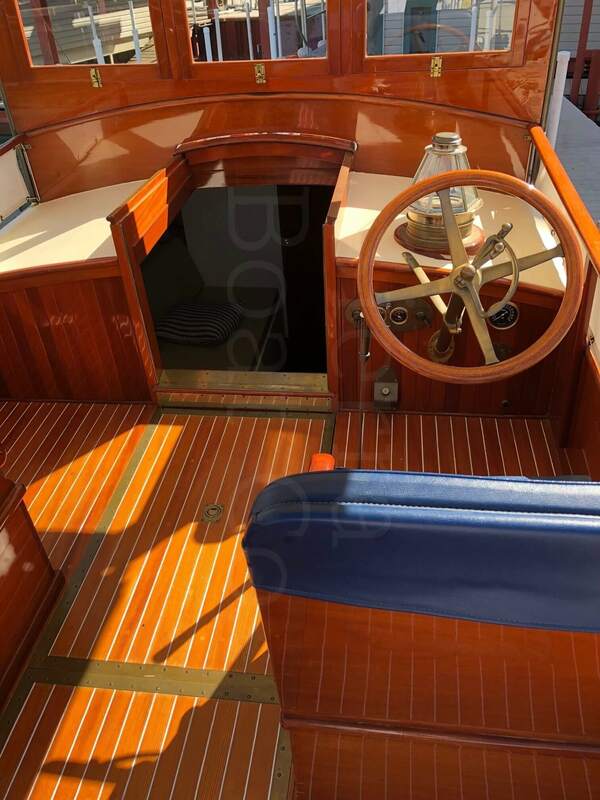 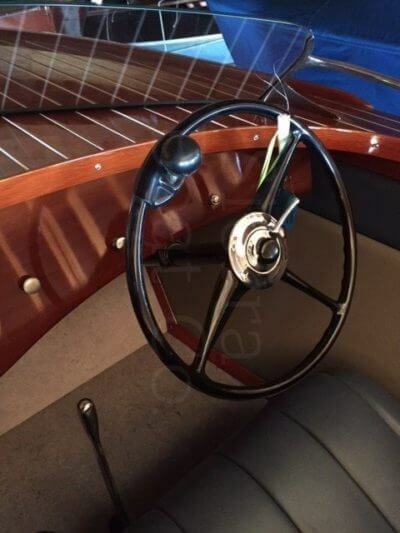 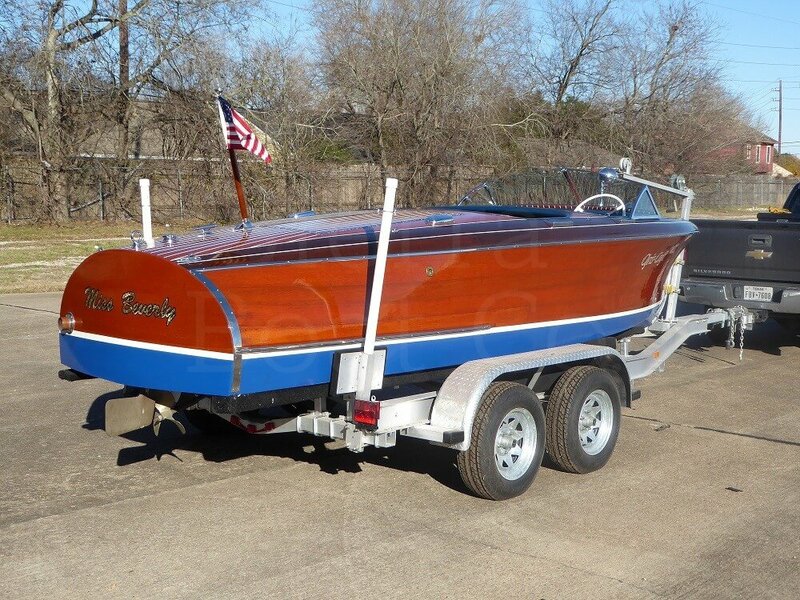 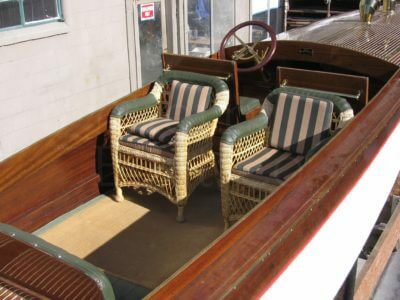 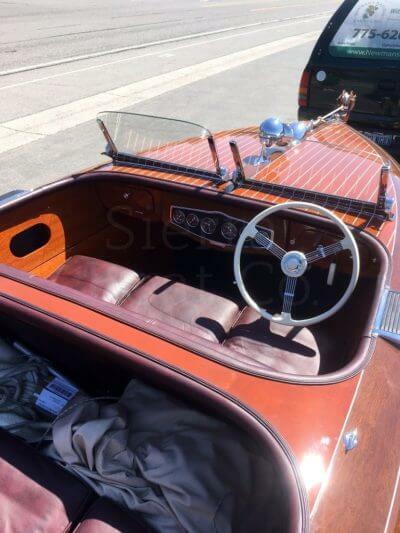 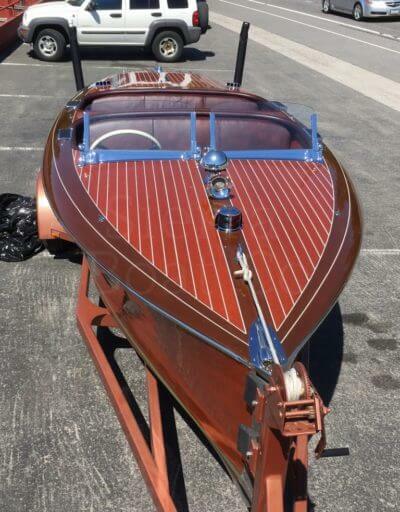 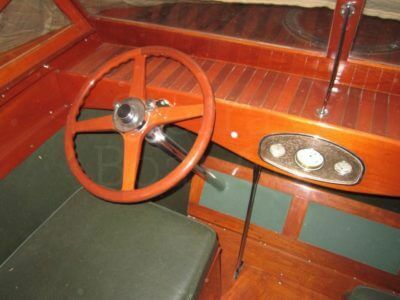 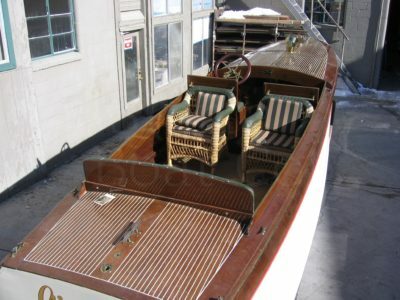 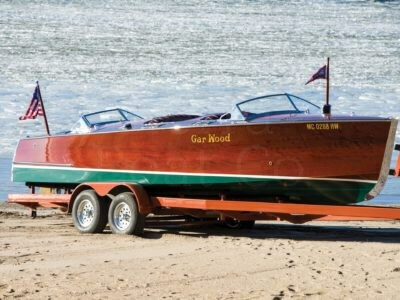 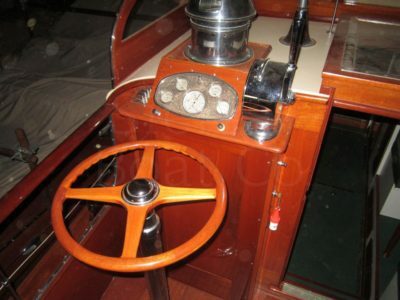 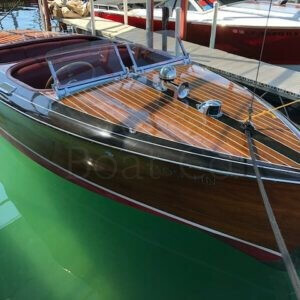 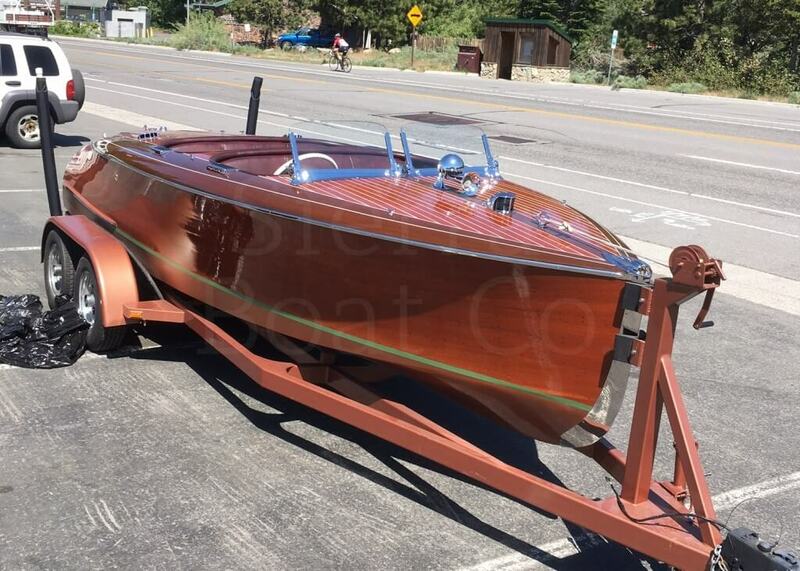 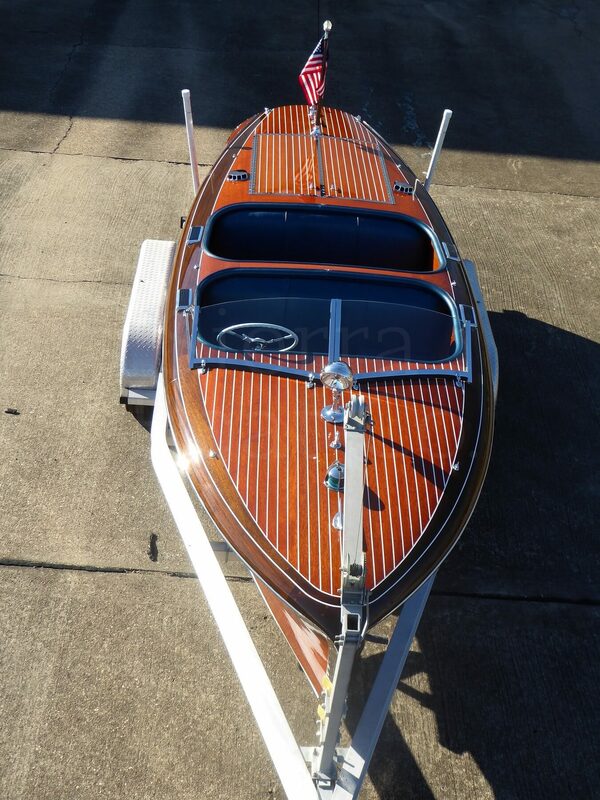 This is a very rare 1941 Gar Wood 25’6’’ Triple Cockpit Custom Runabout. 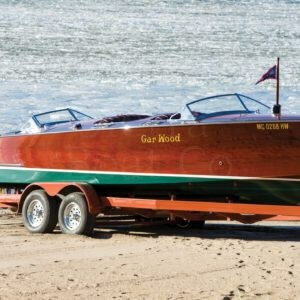 Only 35 25-foot Custom Runabouts were ever built by Gar Wood during its 10-year production run from 1932-41. 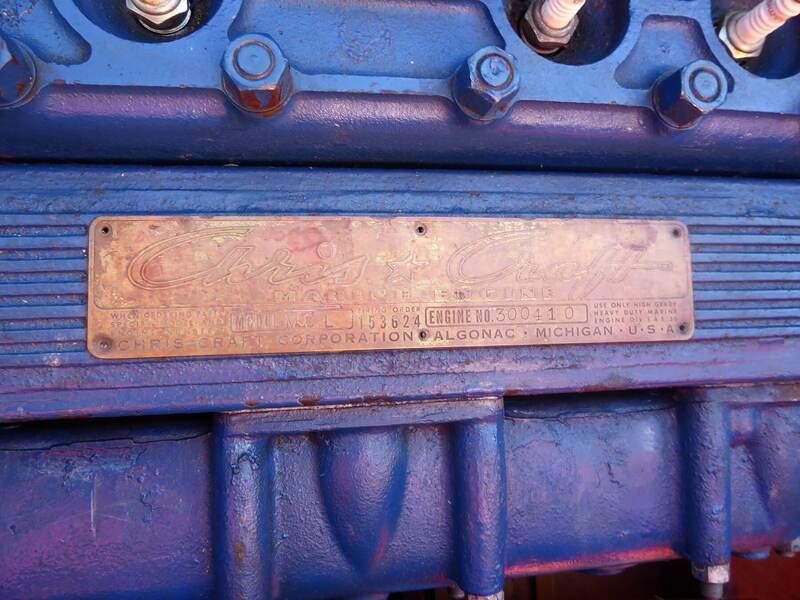 A mere sixteen are known to exist today. Considered by most to be the pinnacle of Gar Wood design, the 1941 models had the most bow flare, the barreled-cutwater design, high-crowned decks and the aft-raked transom, which added 6 inches of length and completed the radical streamlining of the 1941 lineup. 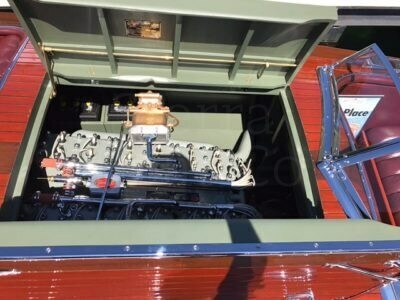 One of only two 25-foot 6-inch hulls built—both for 1941—it is the last of only five with the huge 316 HP, 894 CI Scripps model 302 V-12 engine. 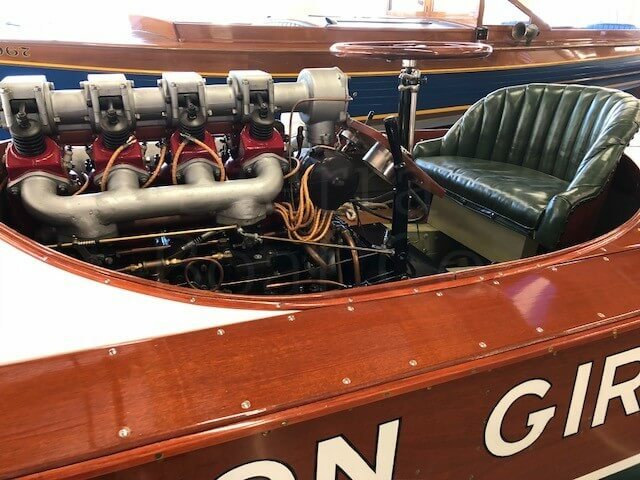 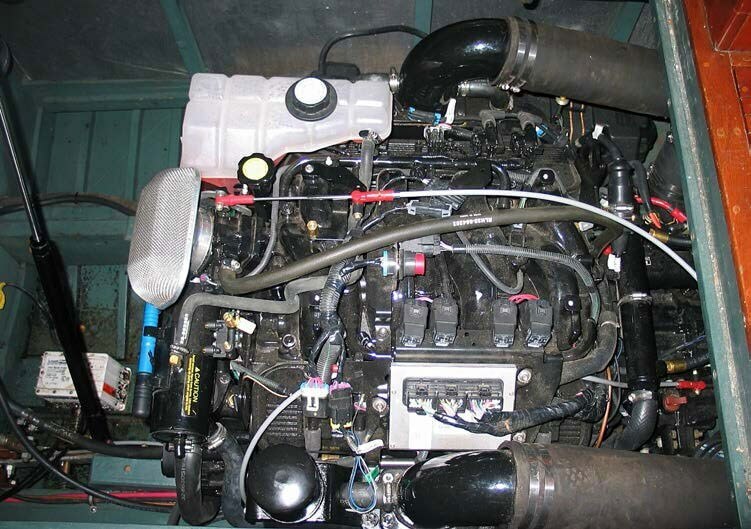 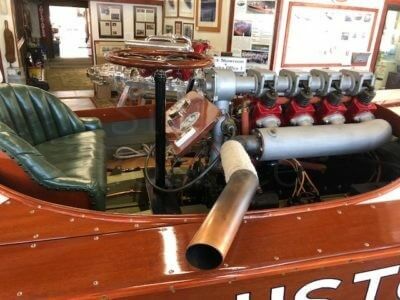 This engine was the top-of-the-line option for the 25-footers, and it pushed the boats to 50 MPH, making it what Gar Wood claimed to be the fastest stock runabout available at the time. It’s price when new in 1941 was a staggering $7,550. 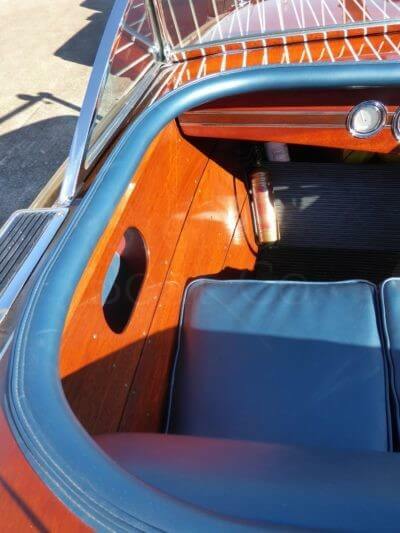 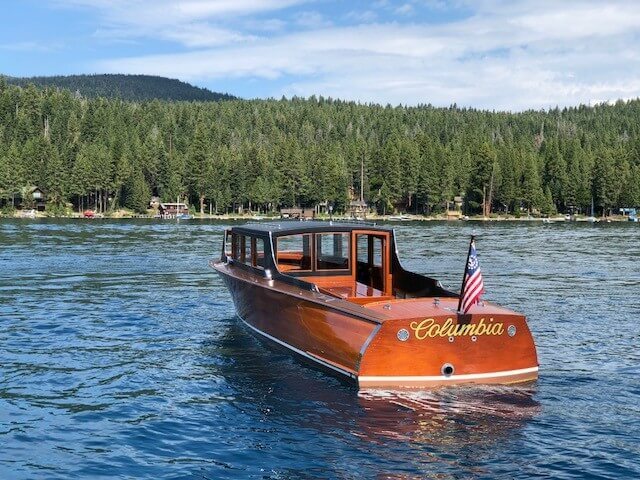 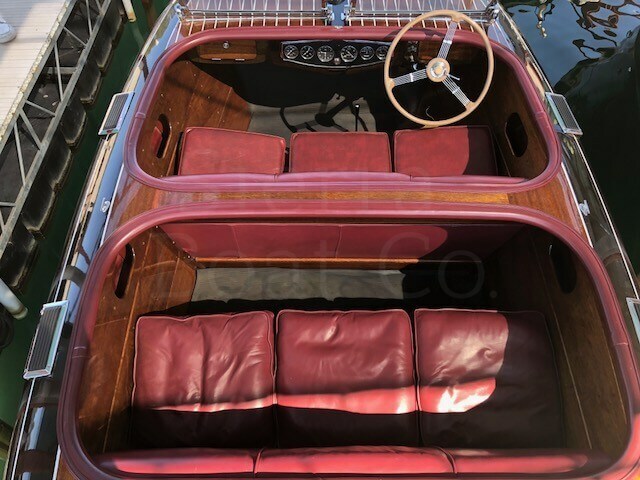 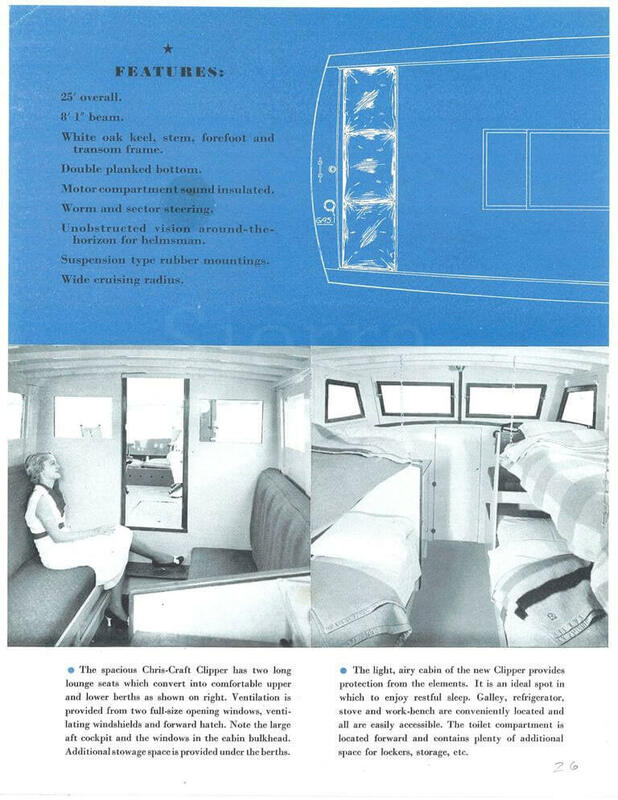 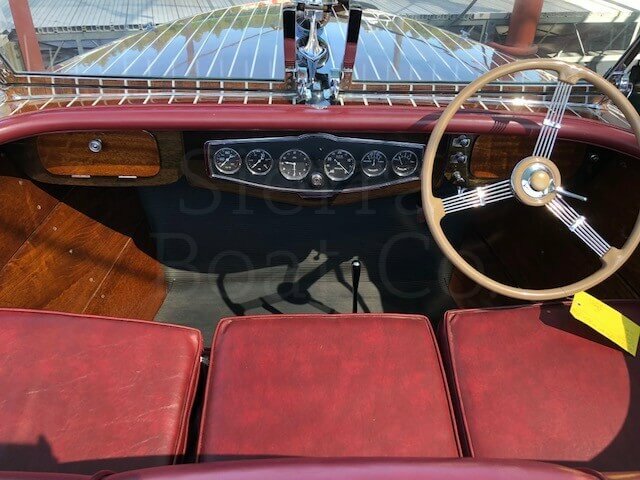 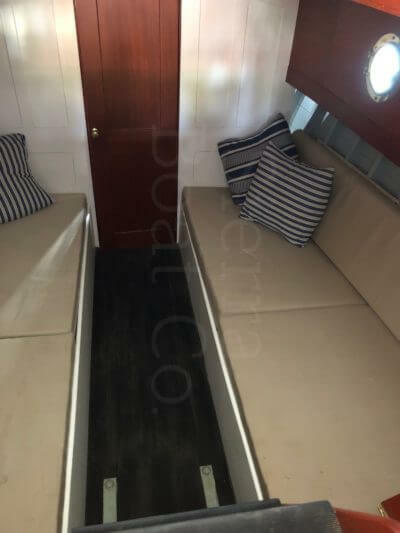 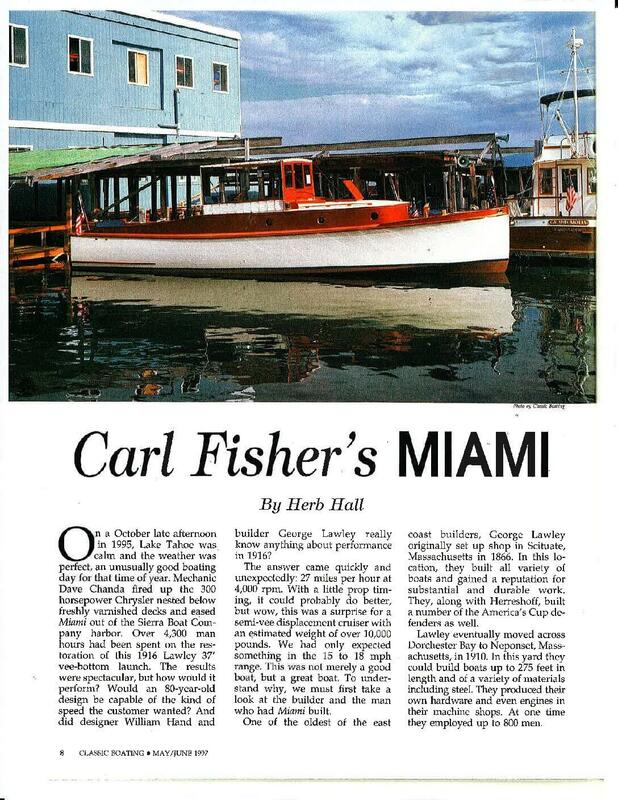 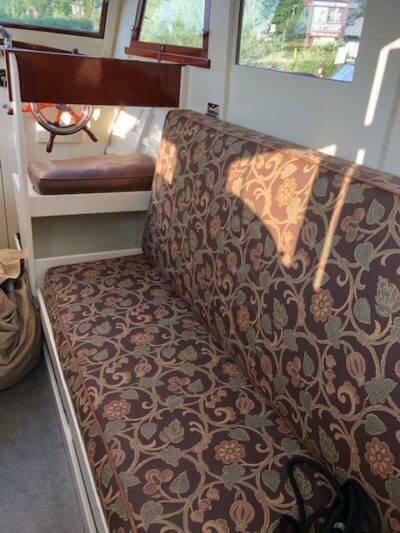 The 1941 Gar Wood 25-foot 6-inch Custom Runabout featured rich heavy-grained pleated burgundy leather upholstery throughout, with comfortable seating for eight to 10 adult passengers. 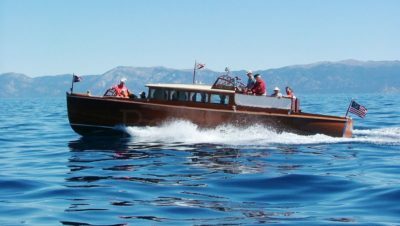 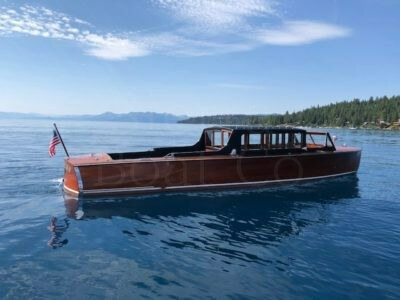 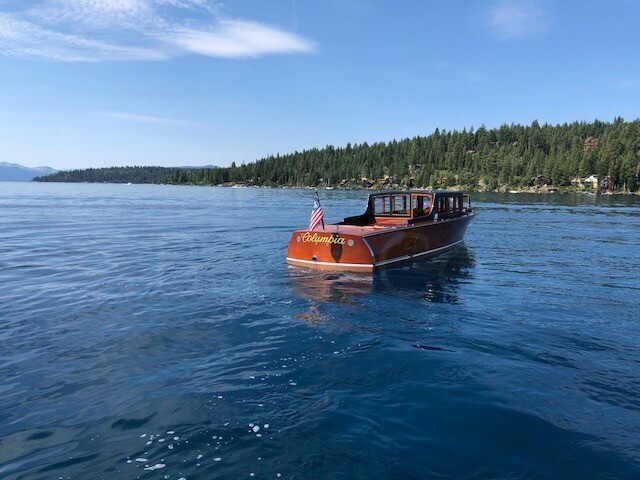 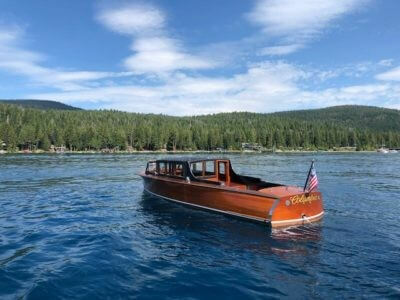 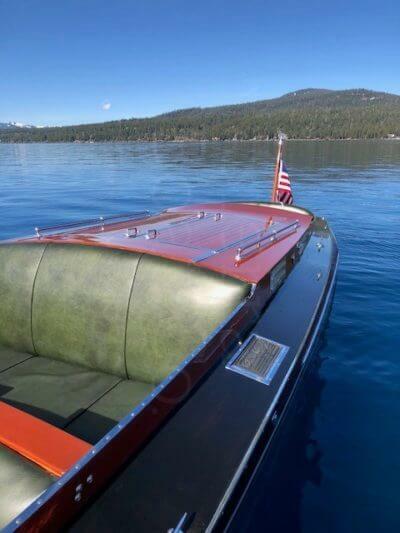 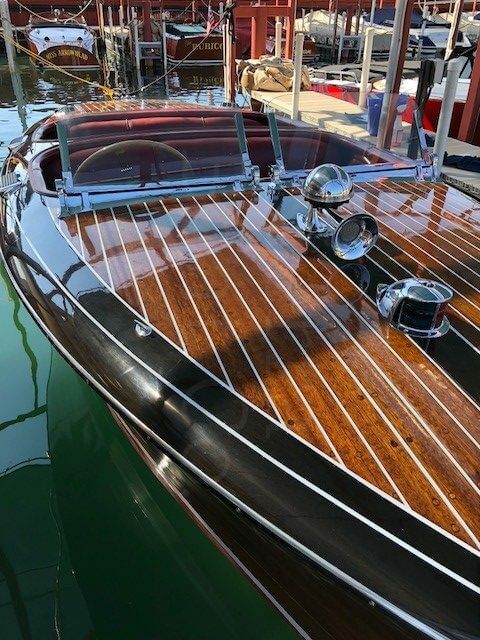 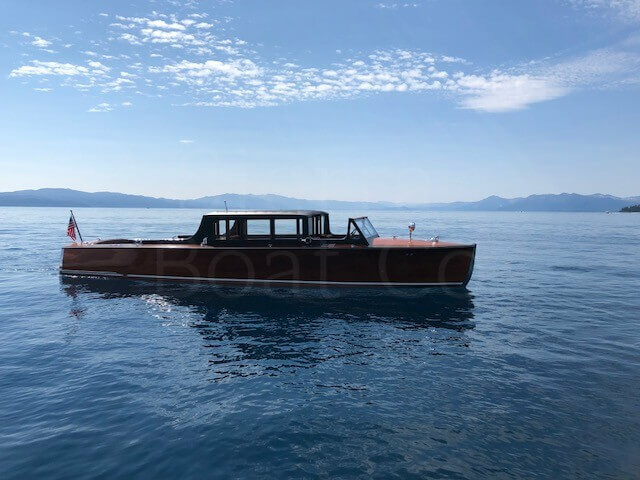 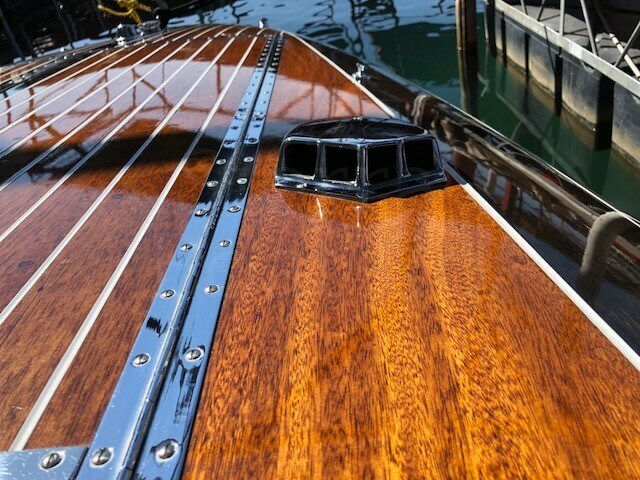 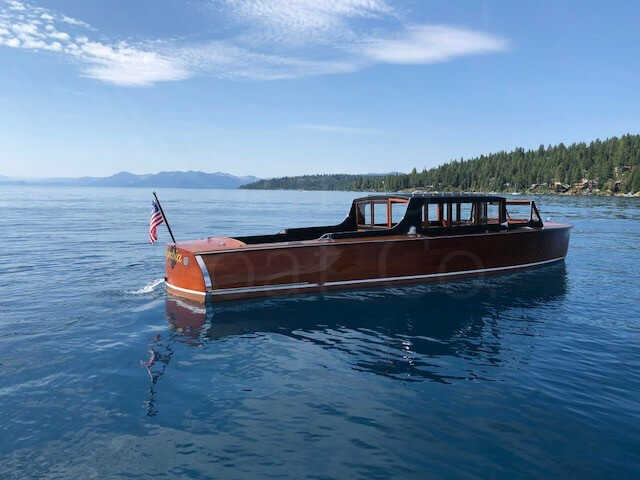 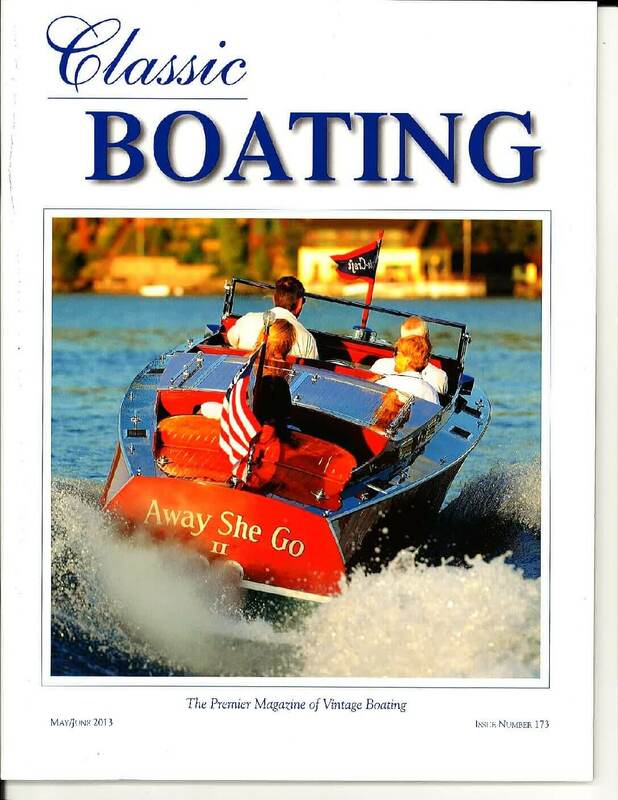 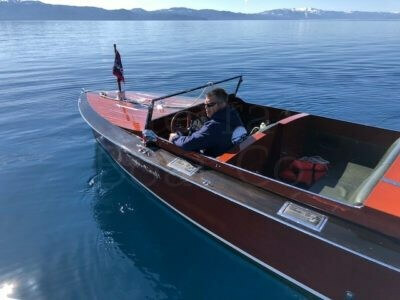 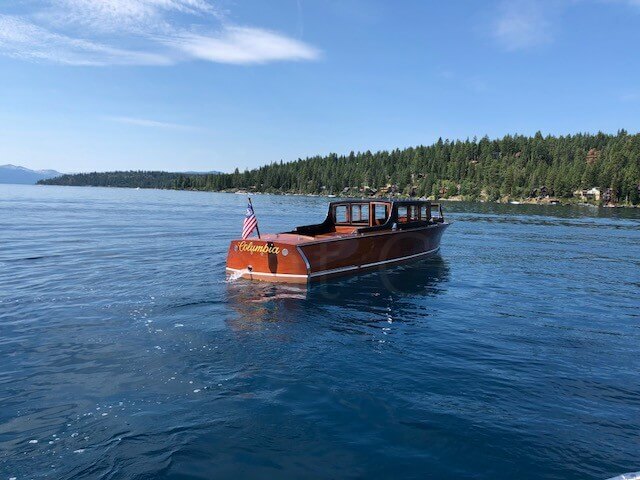 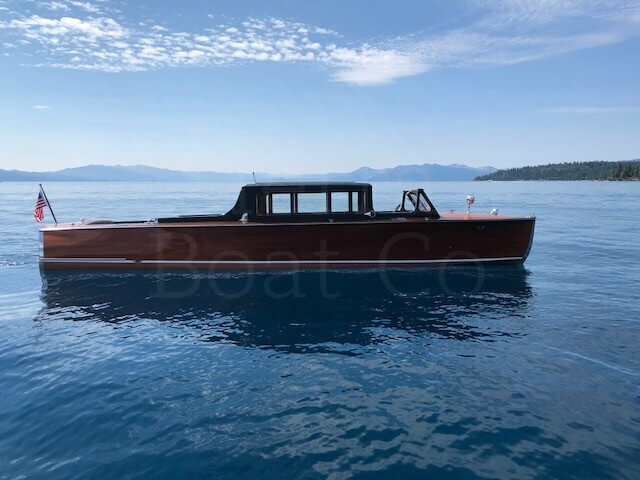 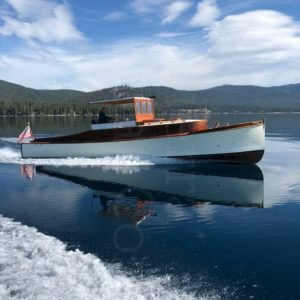 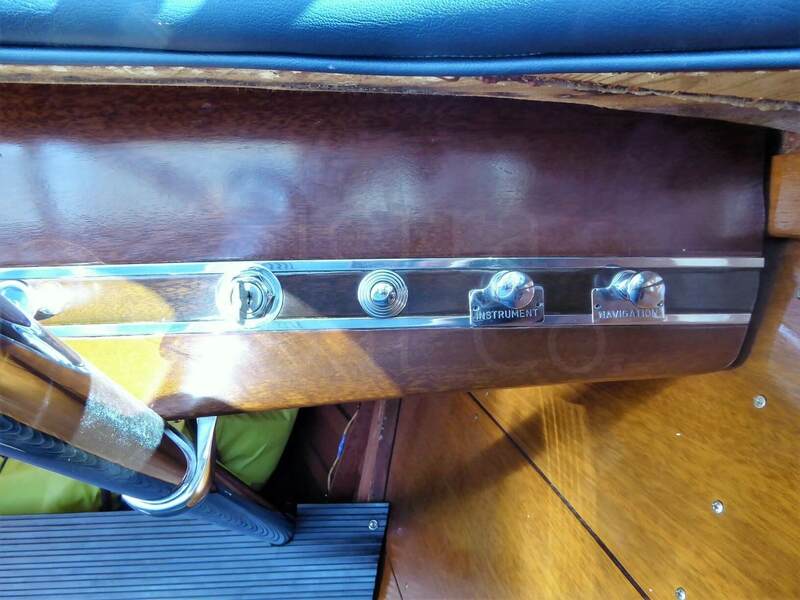 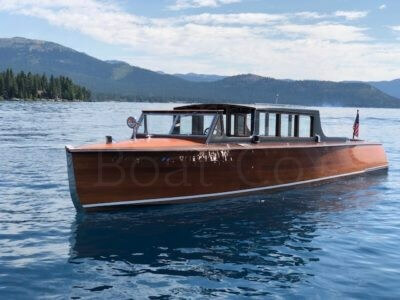 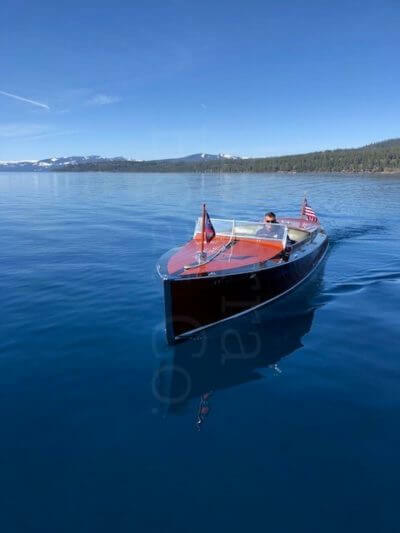 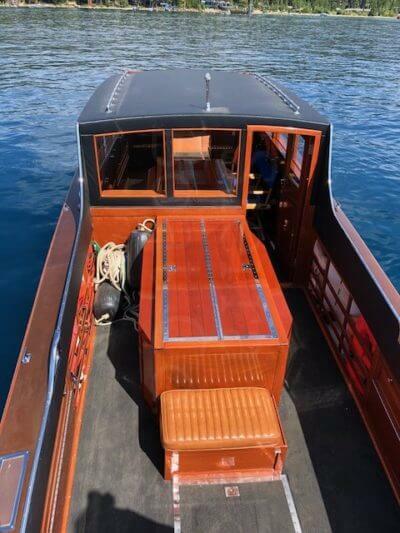 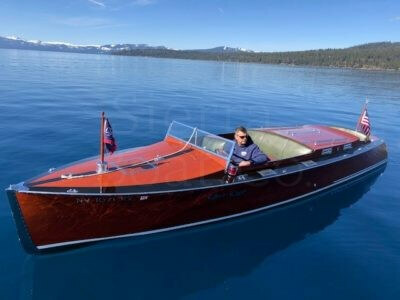 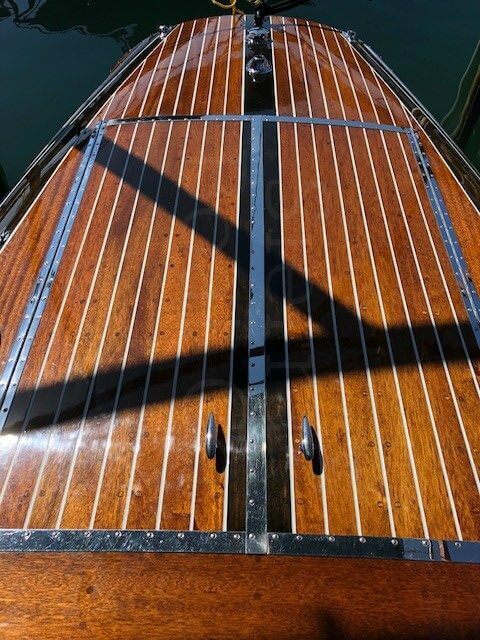 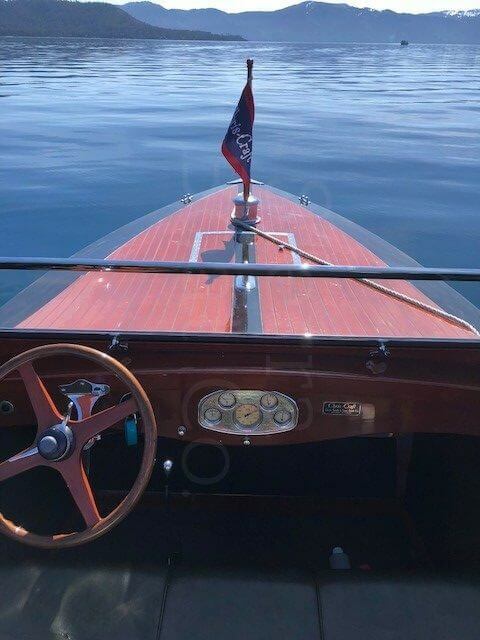 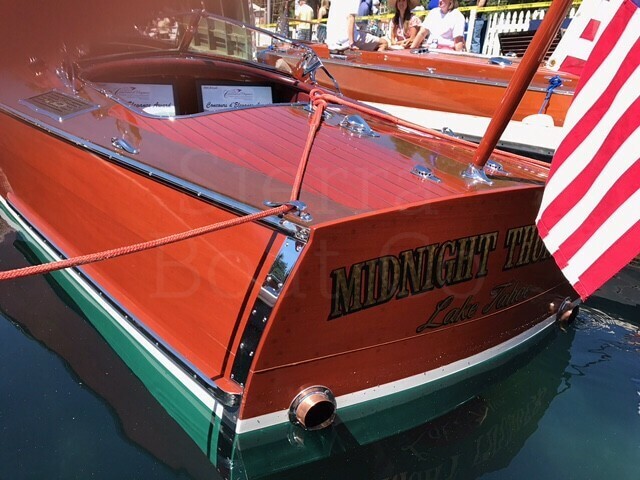 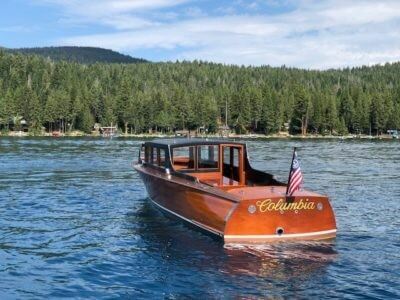 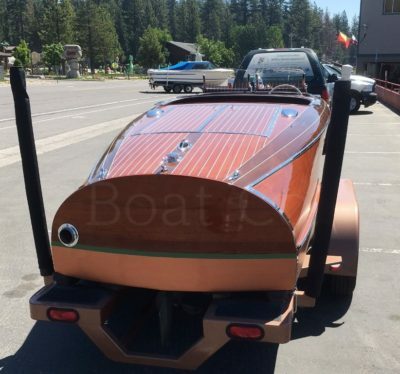 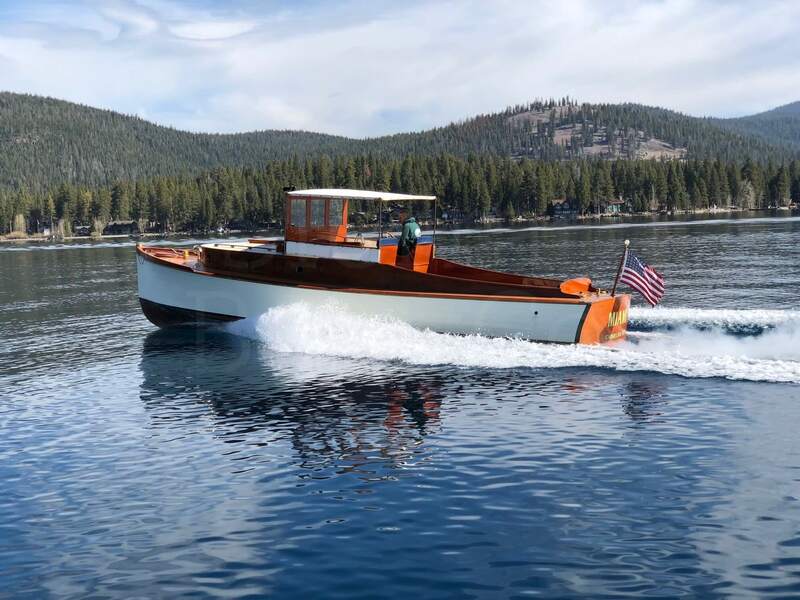 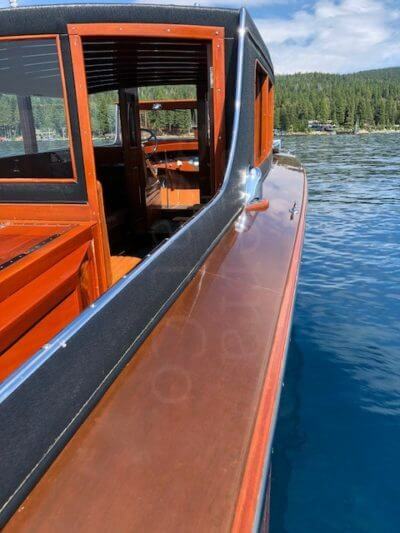 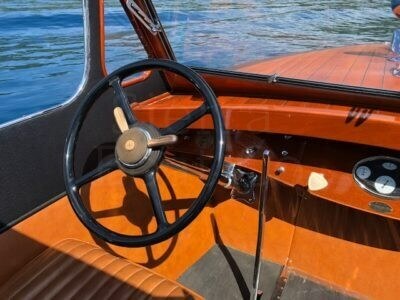 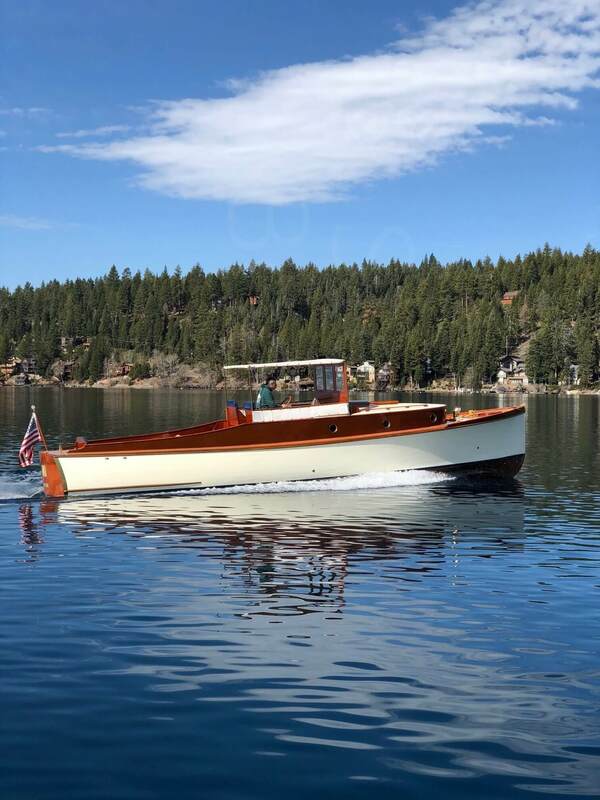 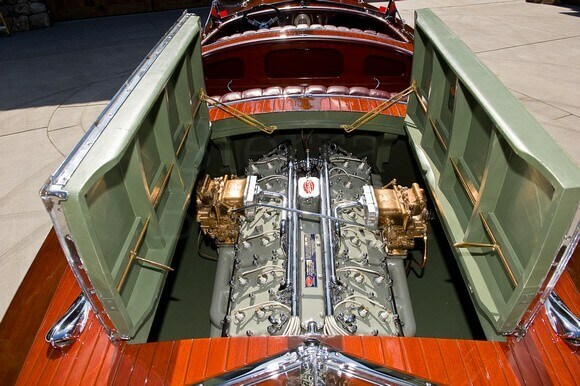 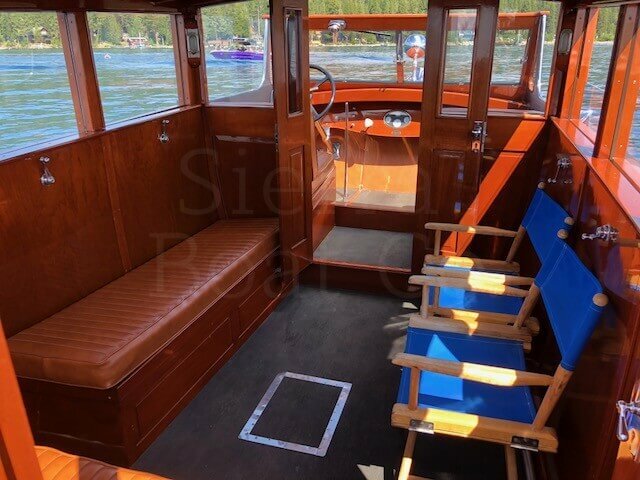 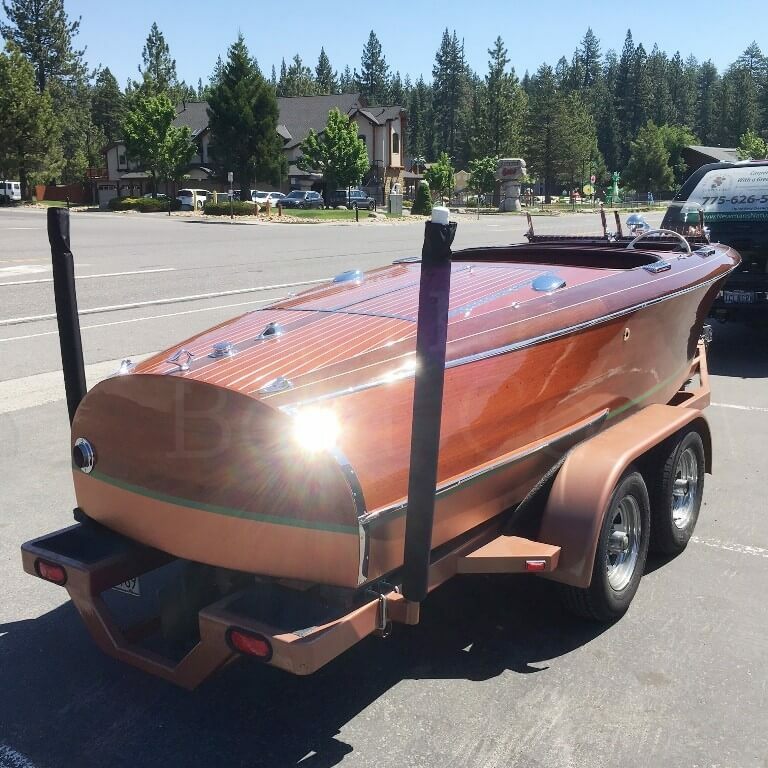 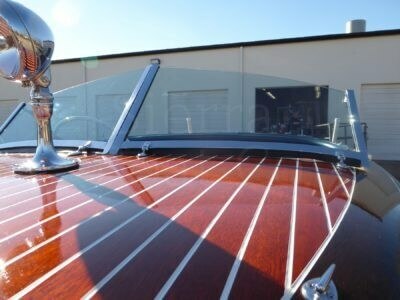 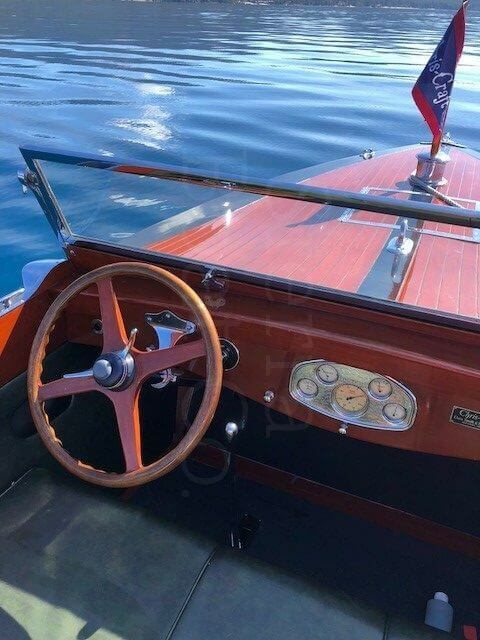 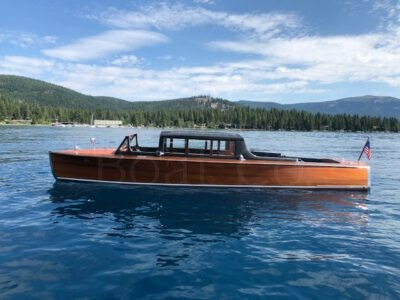 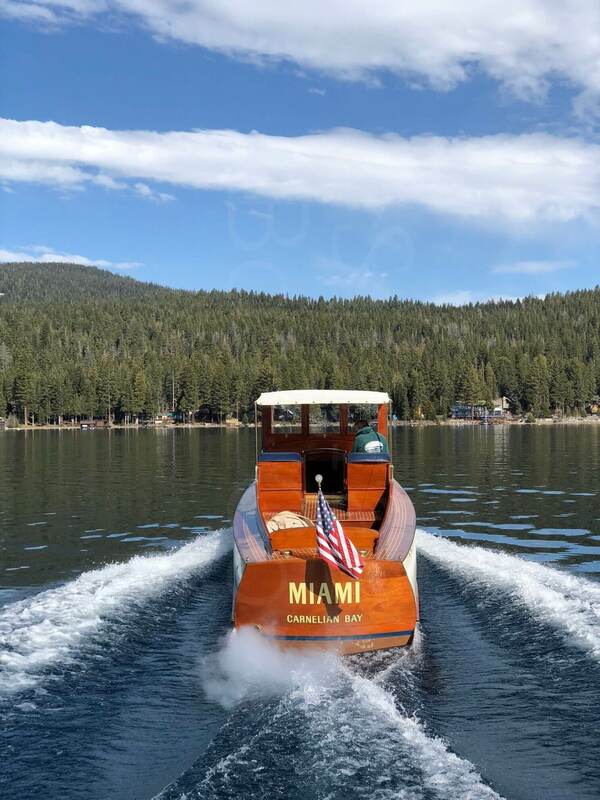 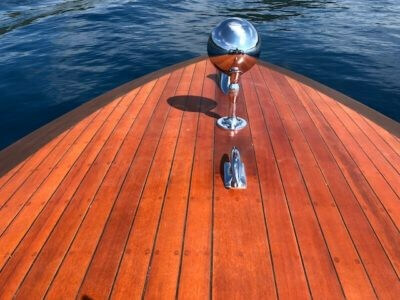 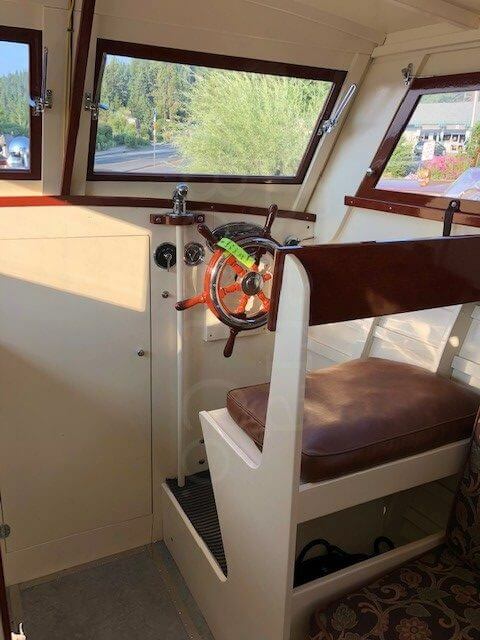 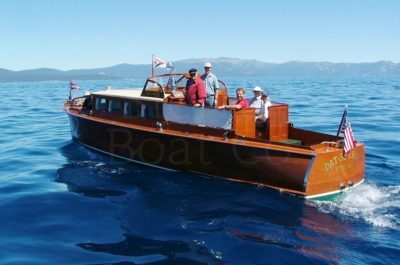 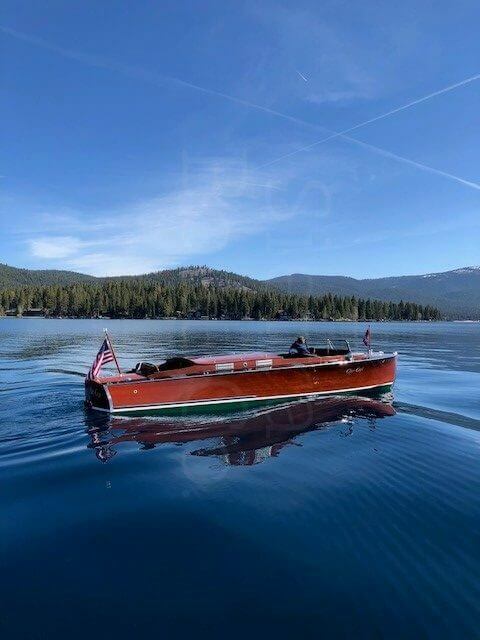 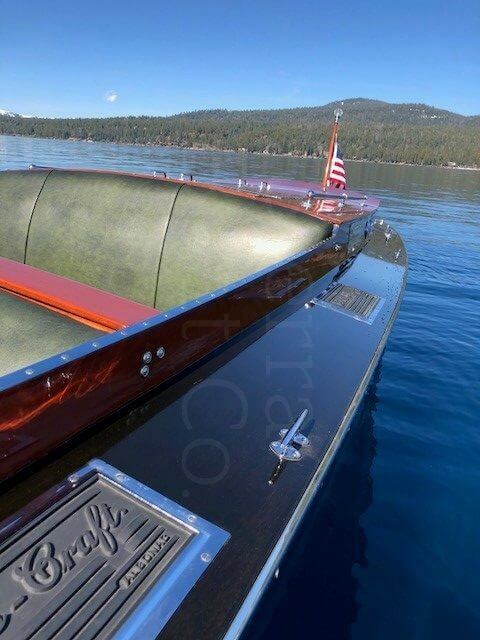 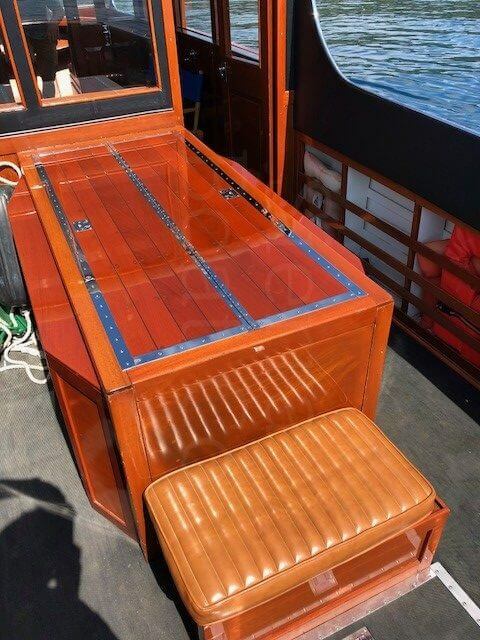 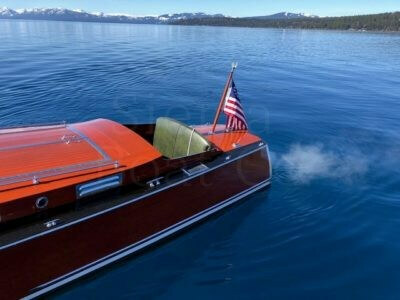 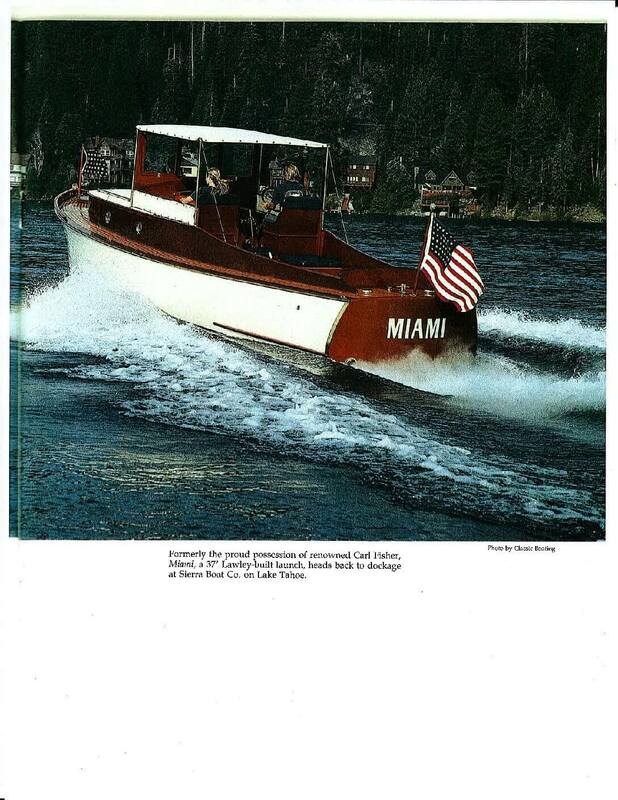 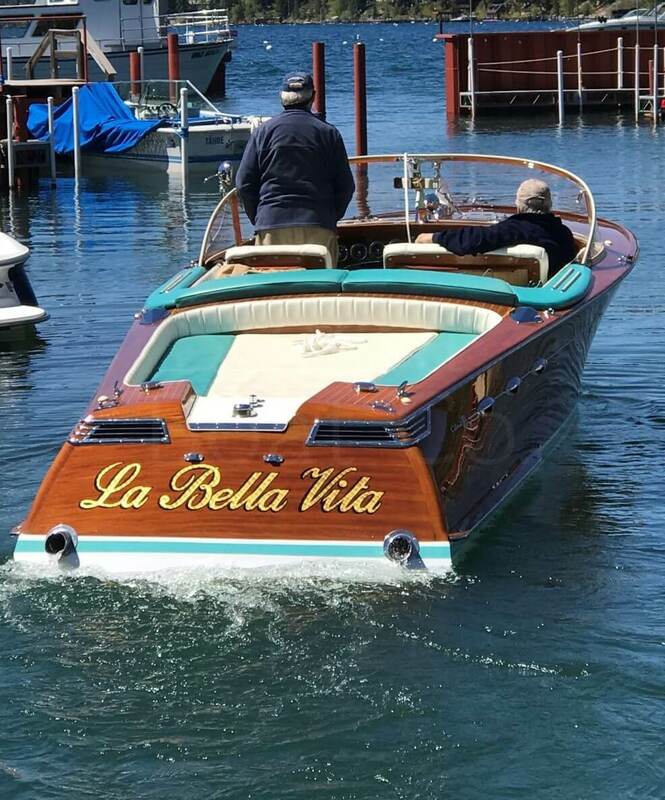 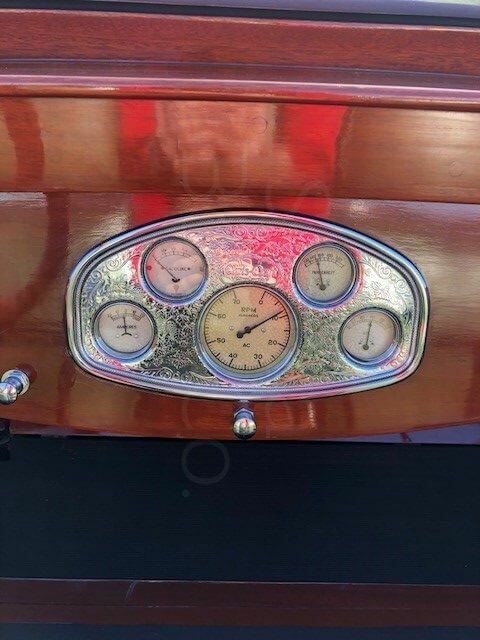 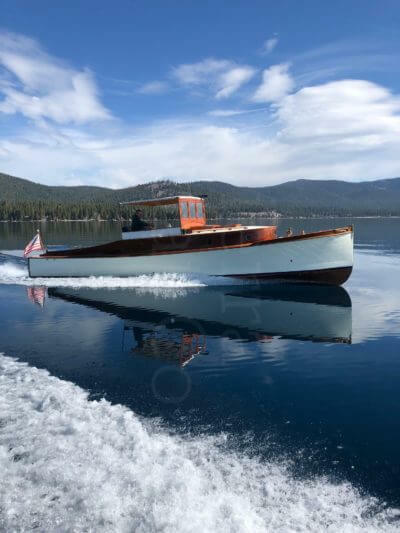 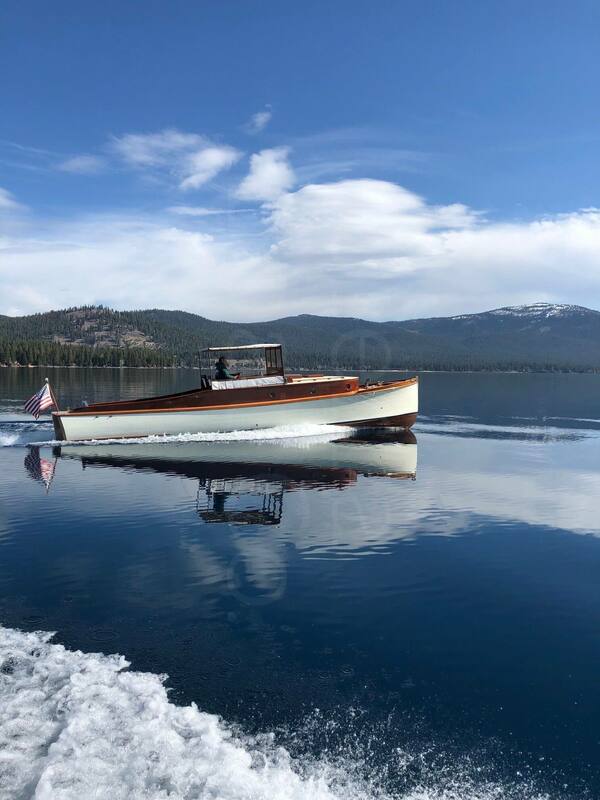 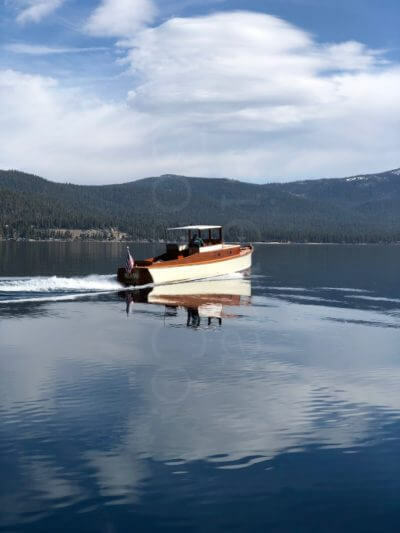 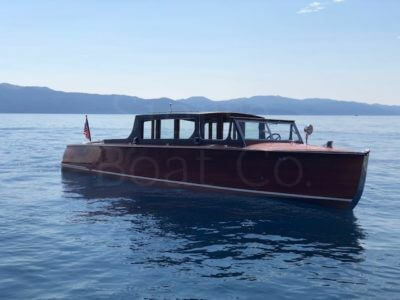 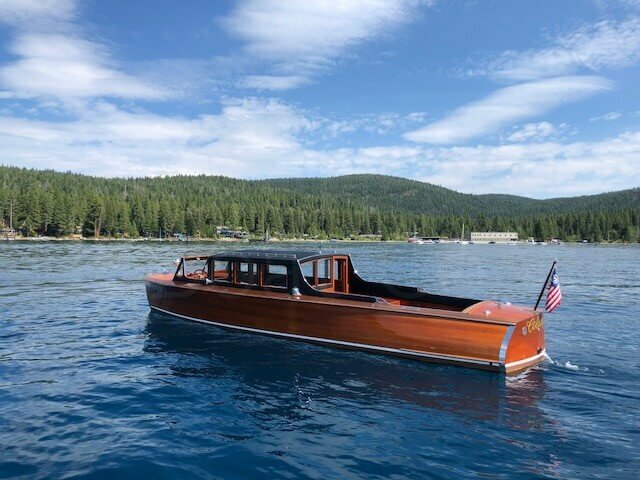 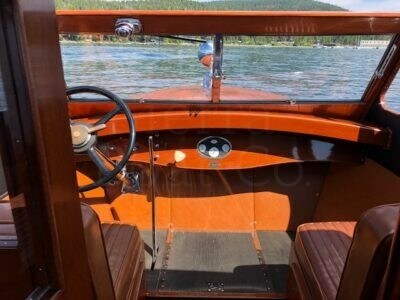 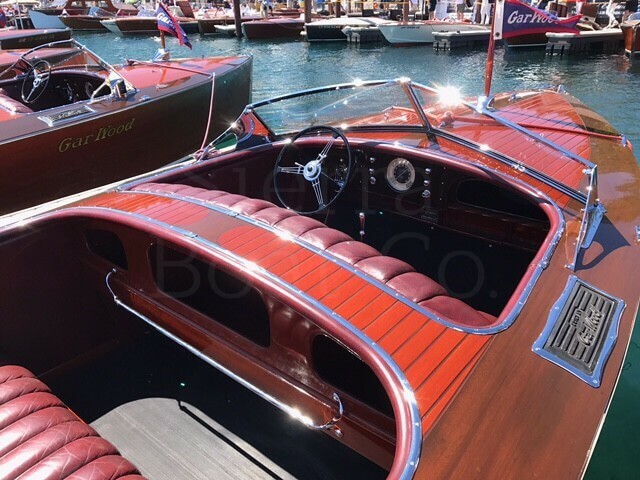 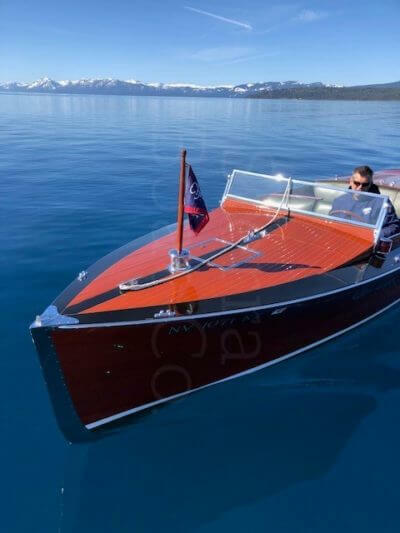 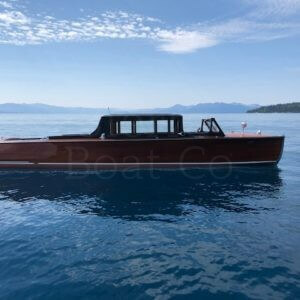 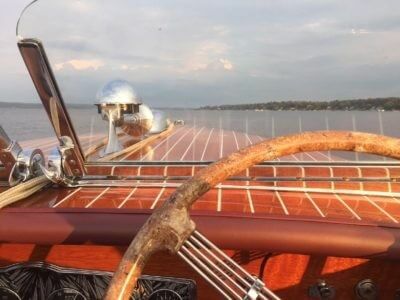 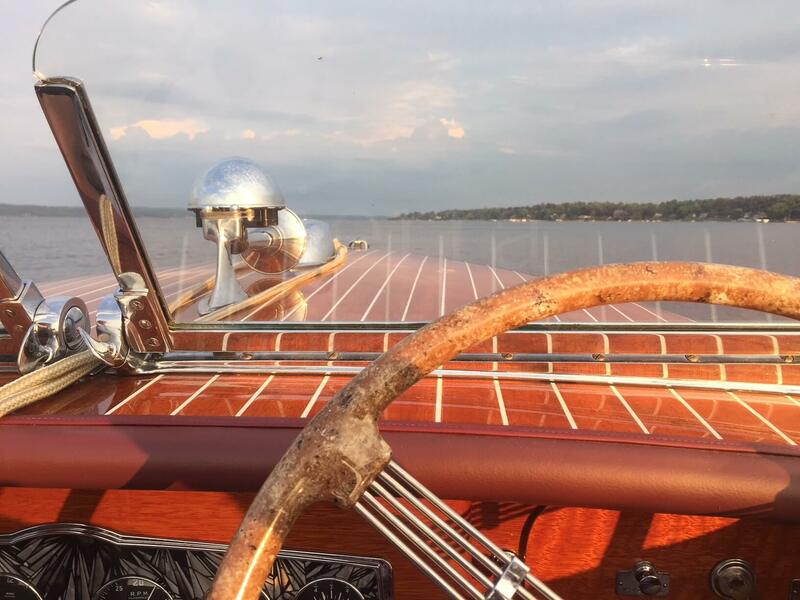 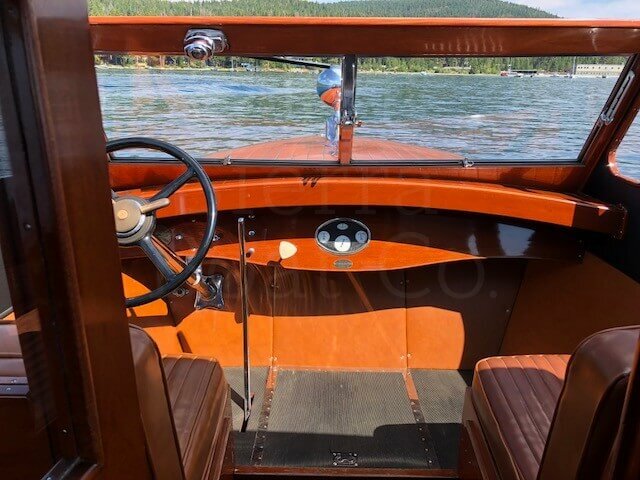 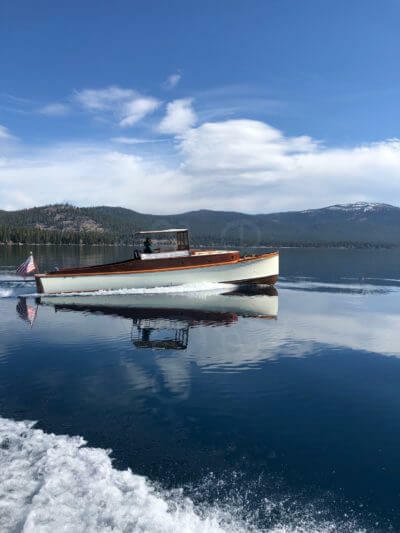 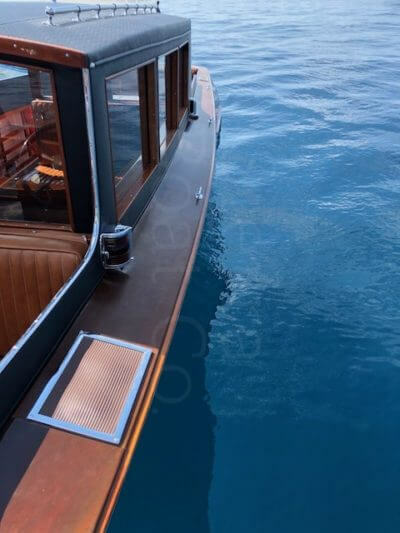 An abundance of the most beautiful streamlined chromed-brass hardware—which was a Gar Wood trademark—helped make the big, triple–cockpit Gar Woods the boat to own on Lake Tahoe. 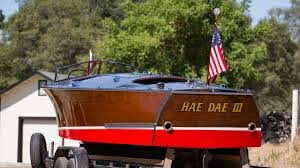 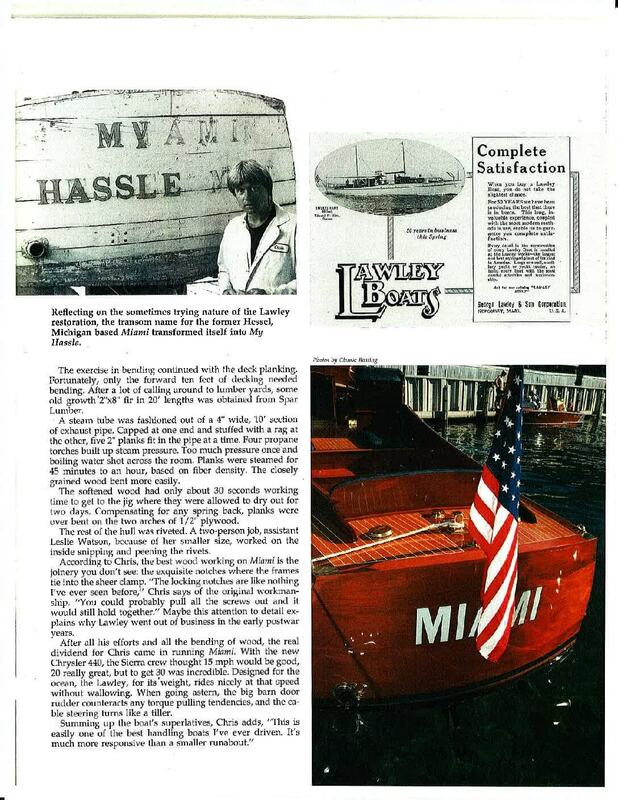 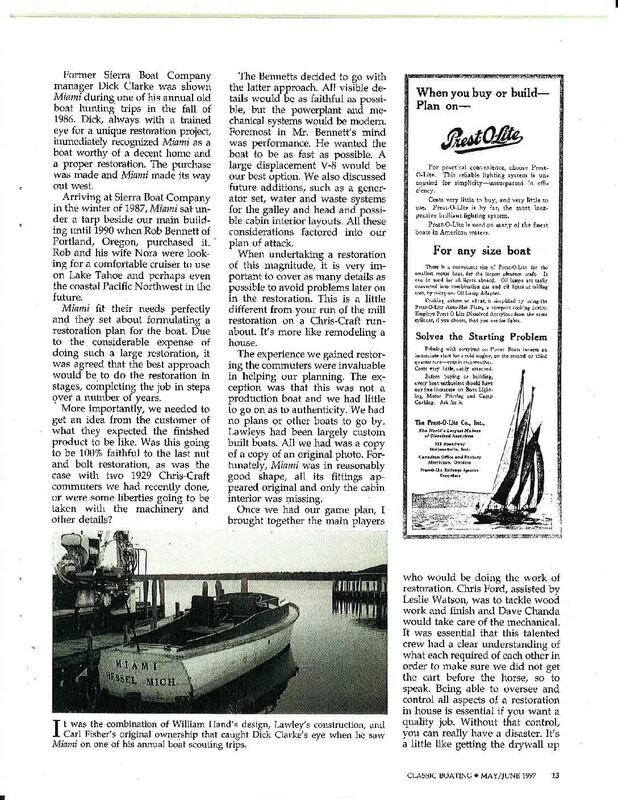 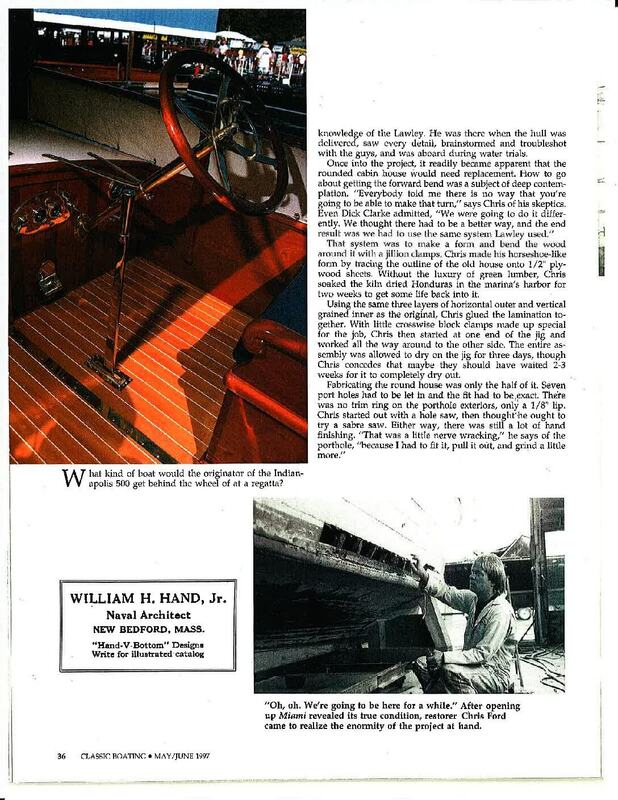 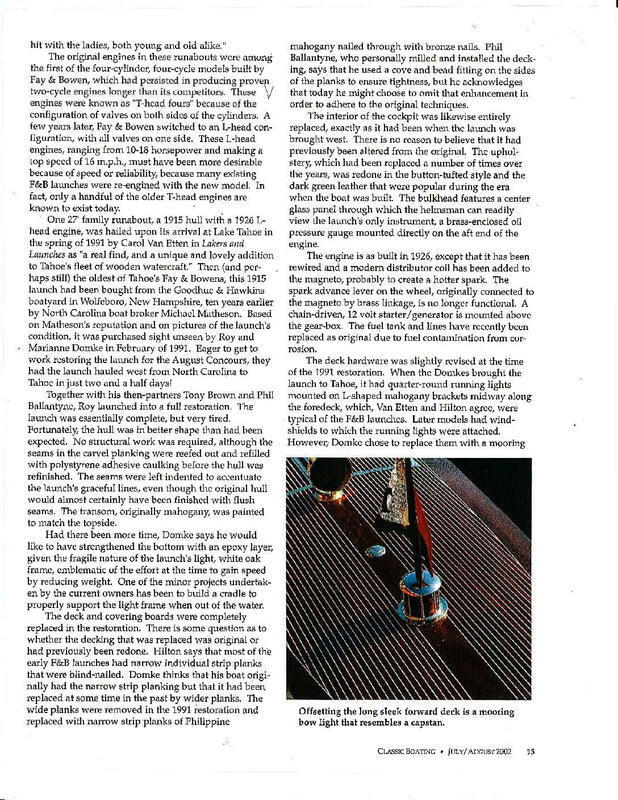 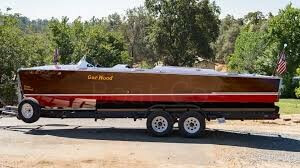 Though “Hae Dae III”—the name given to the boat by its original owner Herbert Day—was actually delivered new to Newport Beach, California, just after New Years in January 1941, by that summer, it was home at Tahoe, where it was raced in several of the Tahoe Yacht Club events. 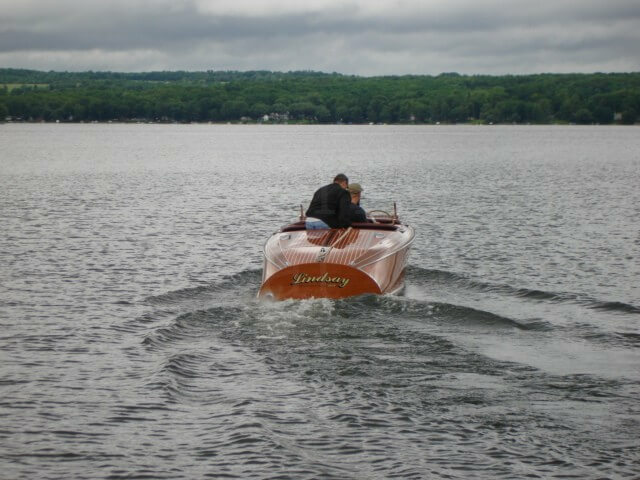 It won first place in the “Bang and Go Back” race and third place in the Lake Championship Free-For-All Race in both July and August 1941. 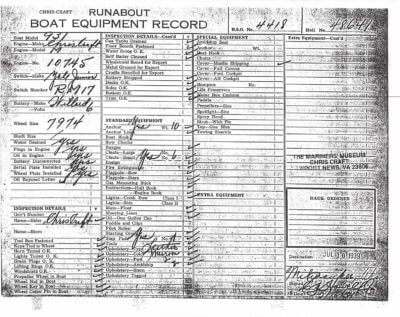 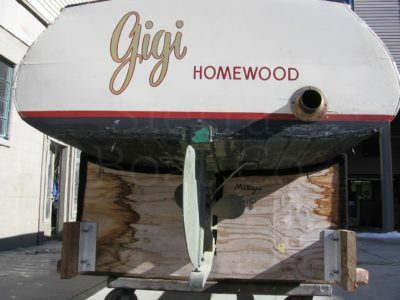 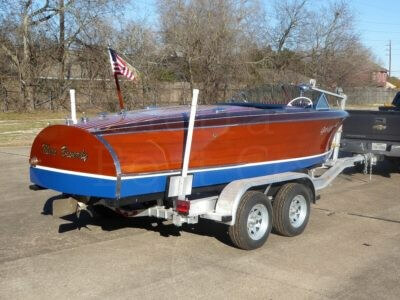 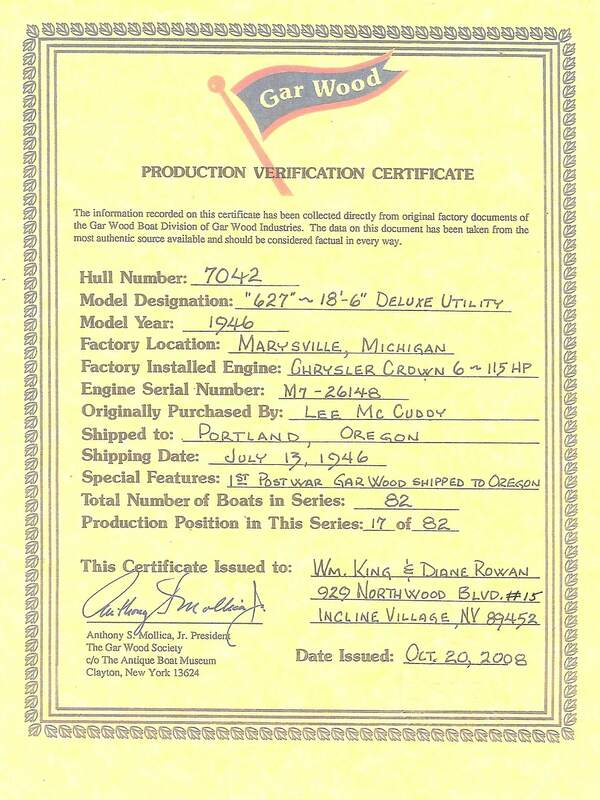 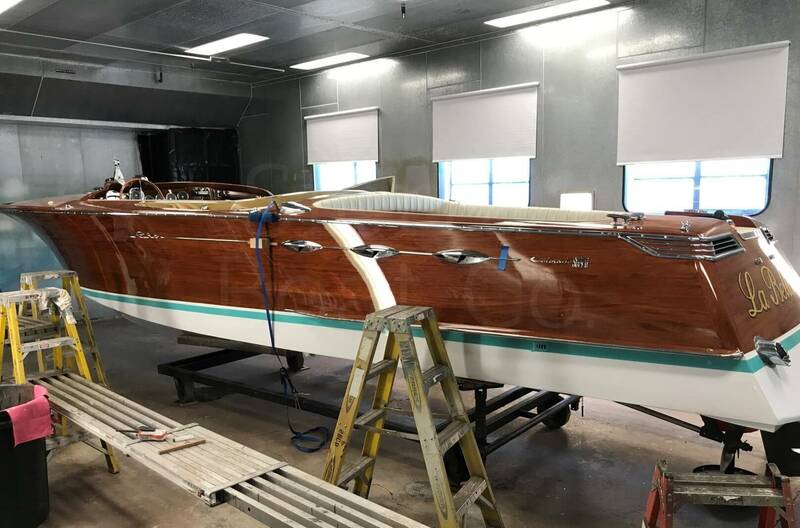 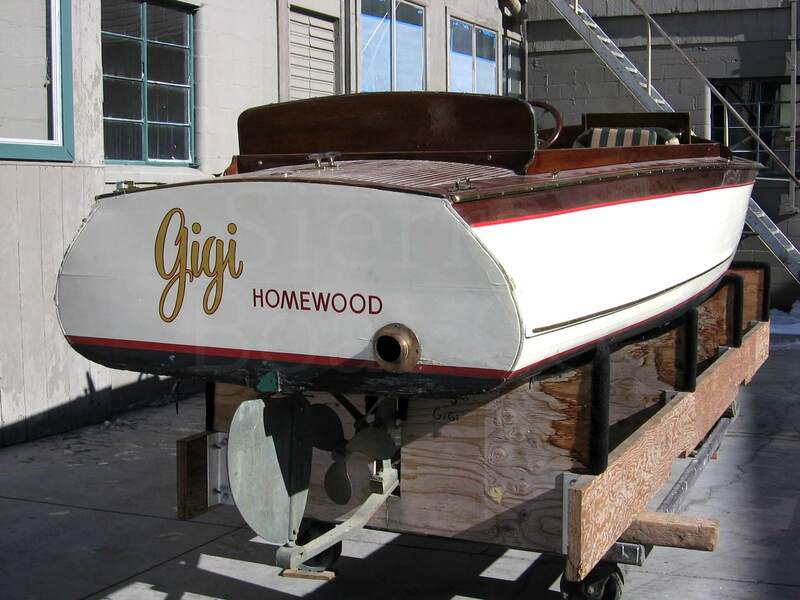 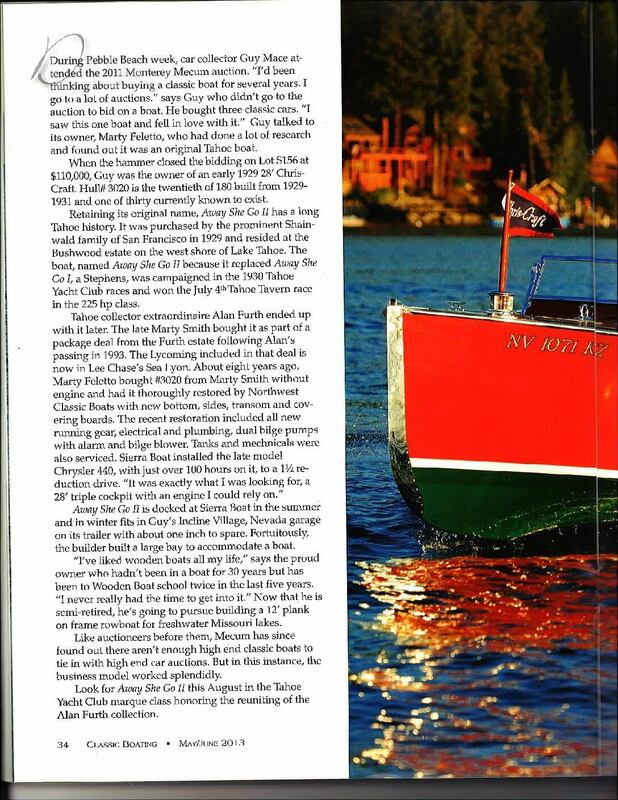 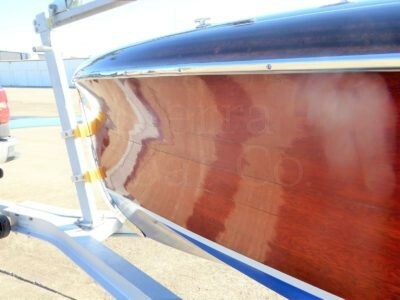 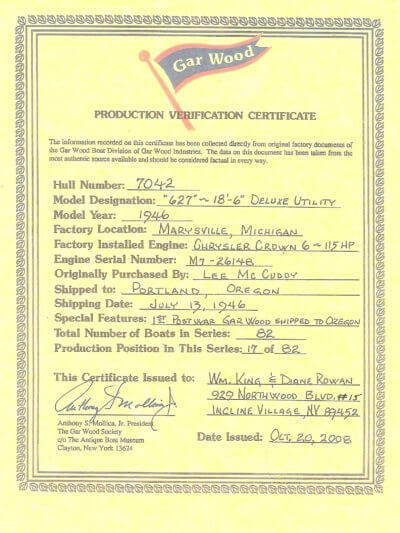 Hae Dae III was the last 25’6’’ Custom Runabout shipped by Gar Wood. 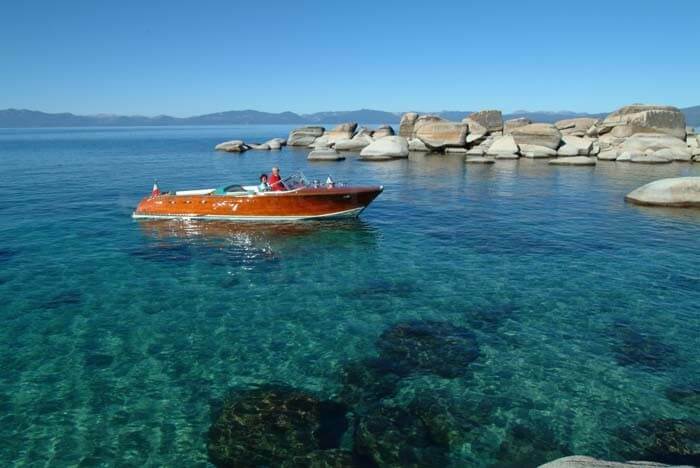 Hae Dae III has only had four owners in its lifetime on Lake Tahoe. 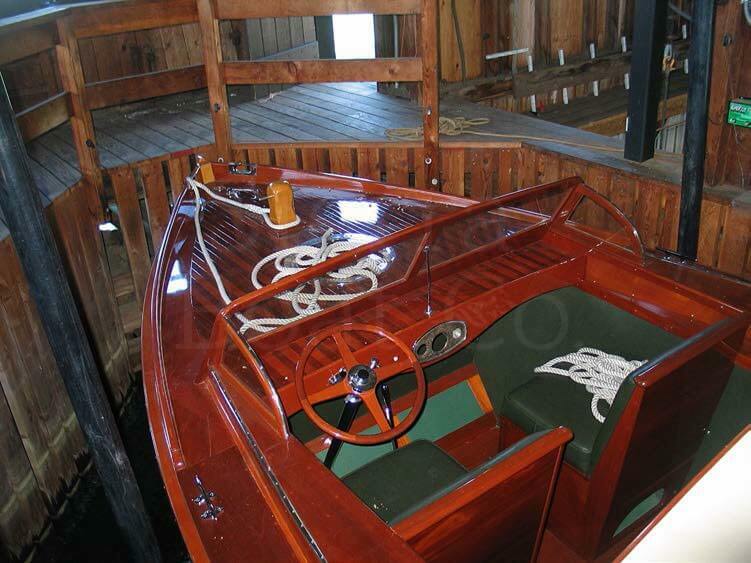 Tony Brown of Western Runabouts completed a significant preservation restoration in 2002. 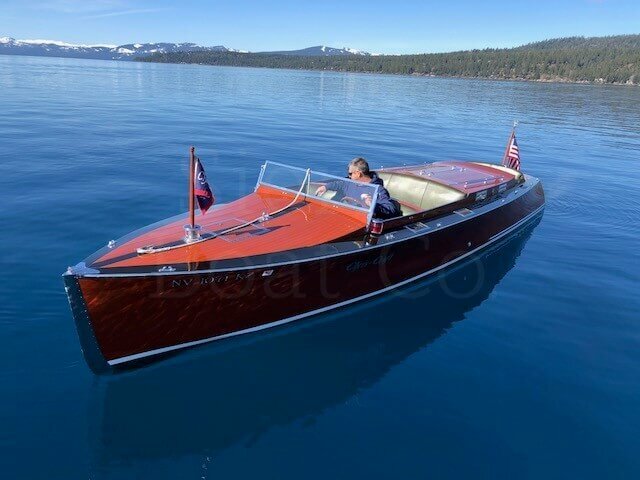 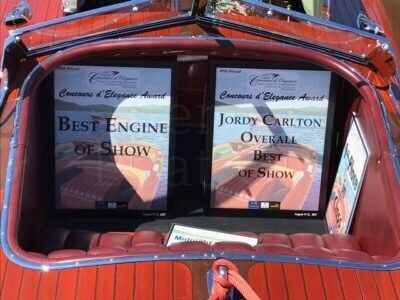 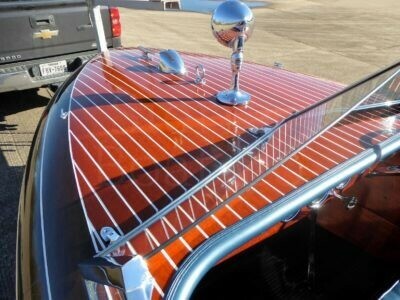 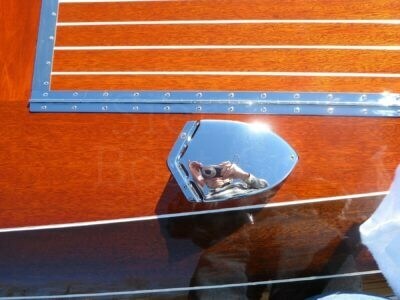 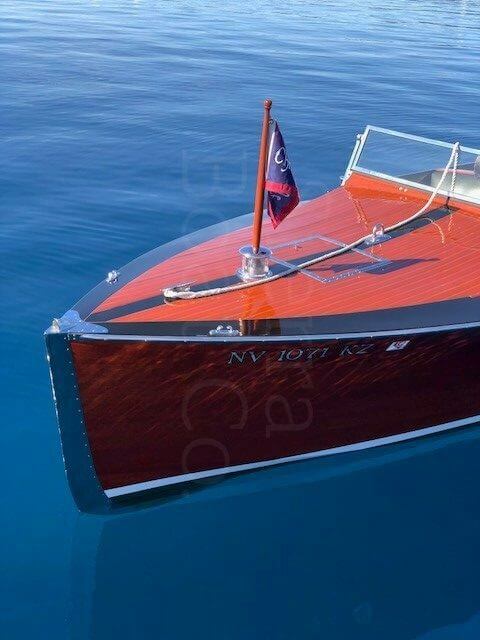 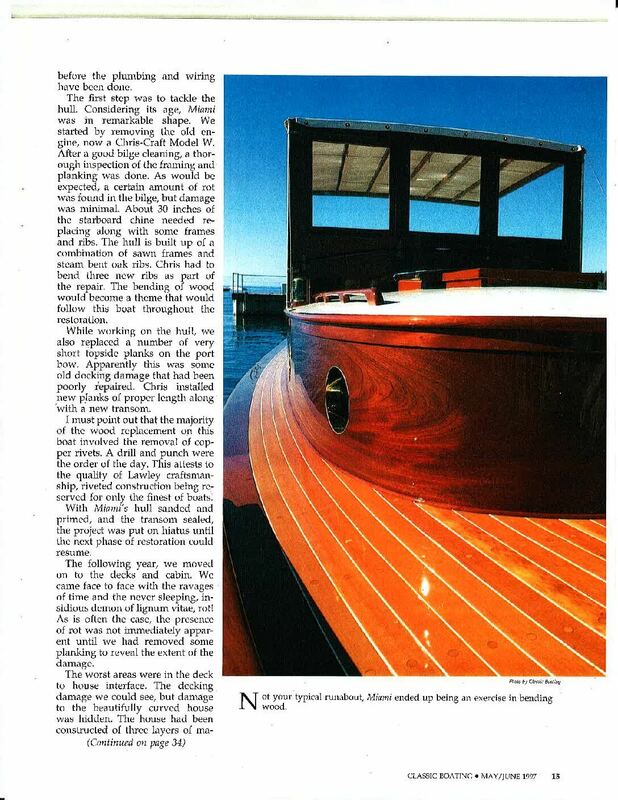 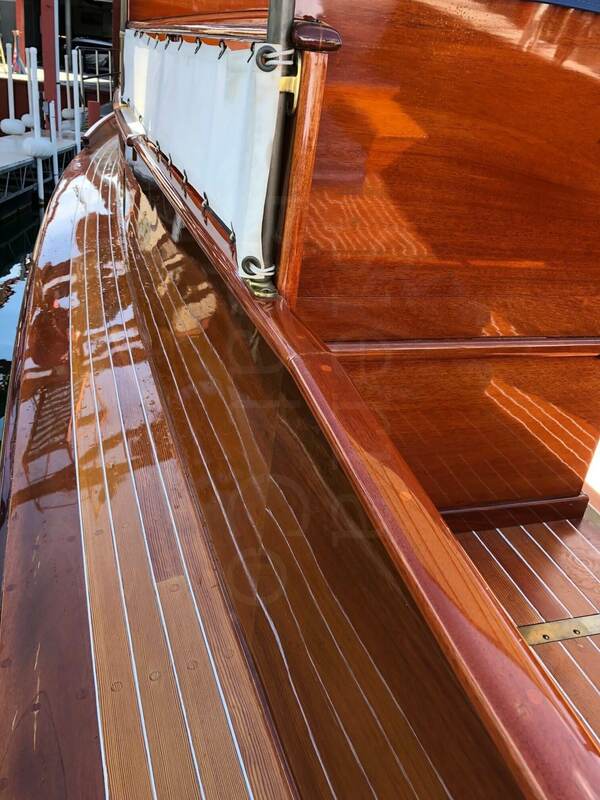 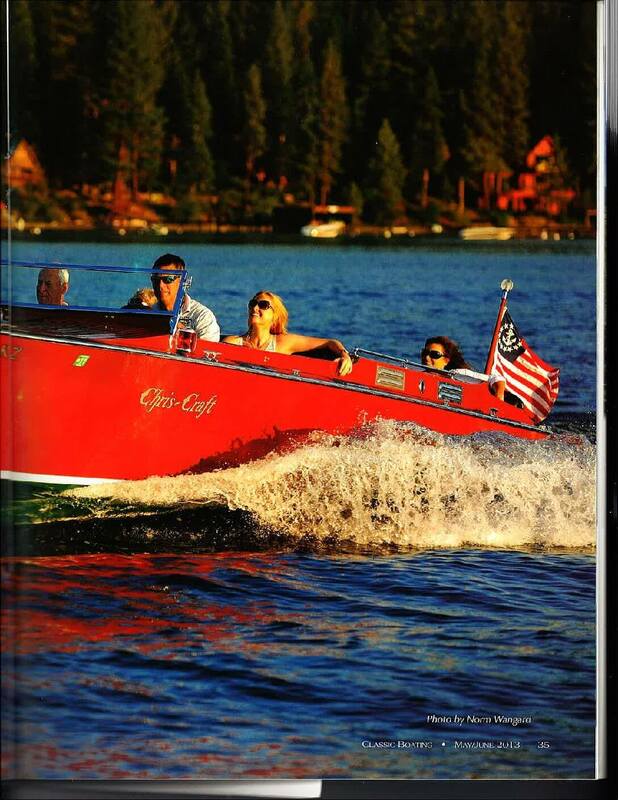 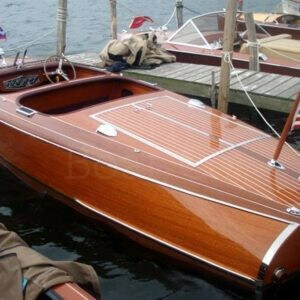 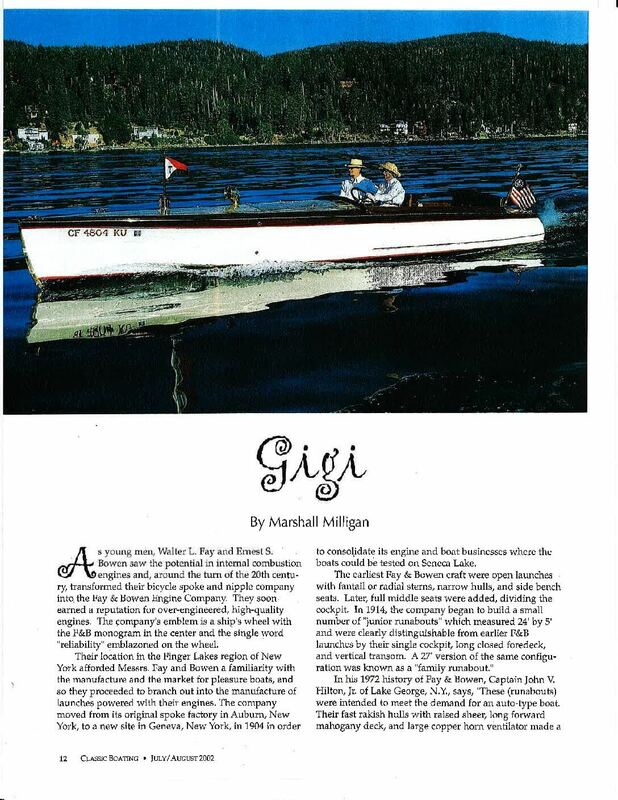 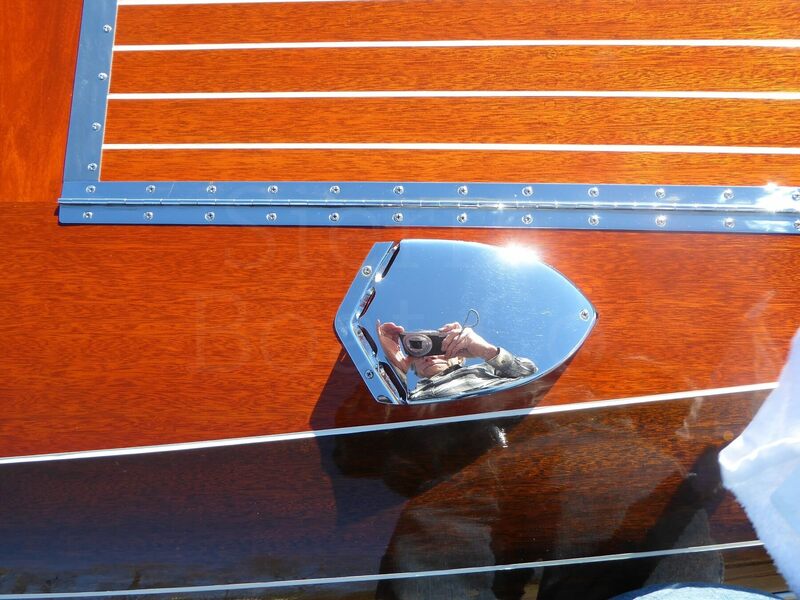 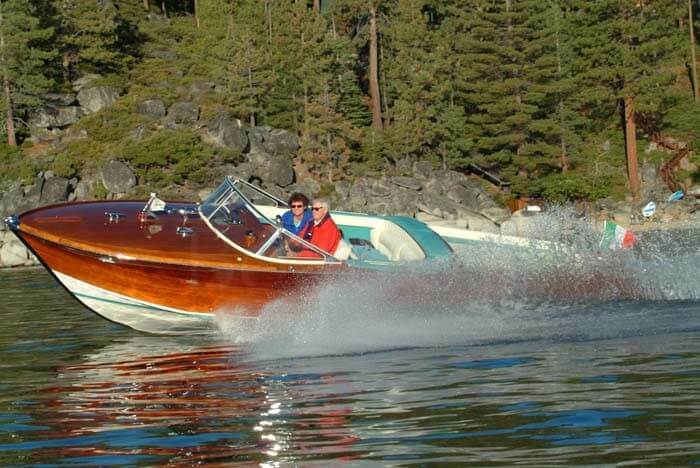 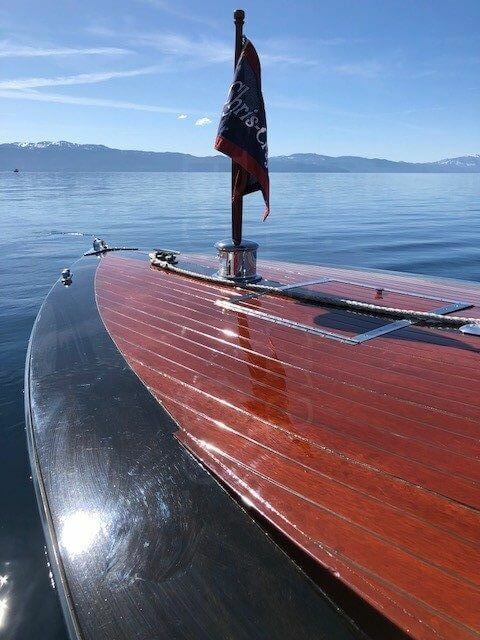 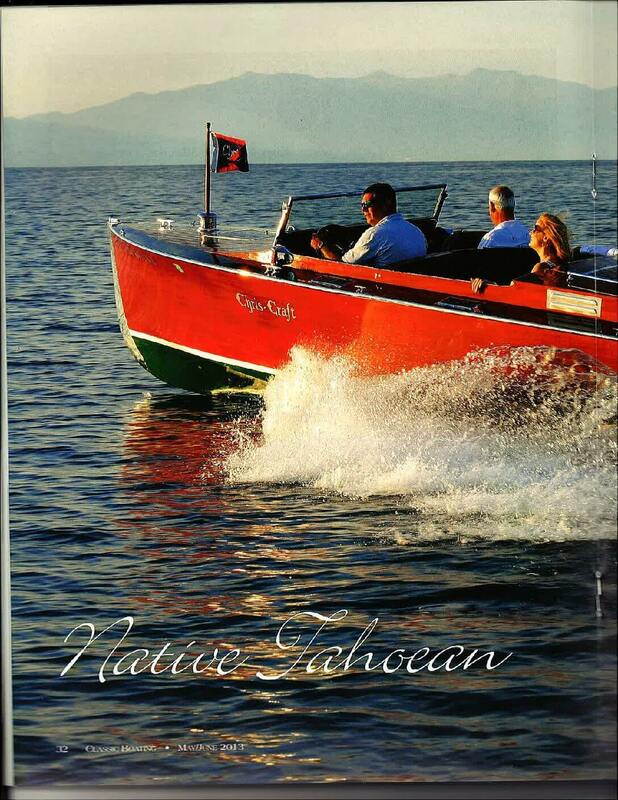 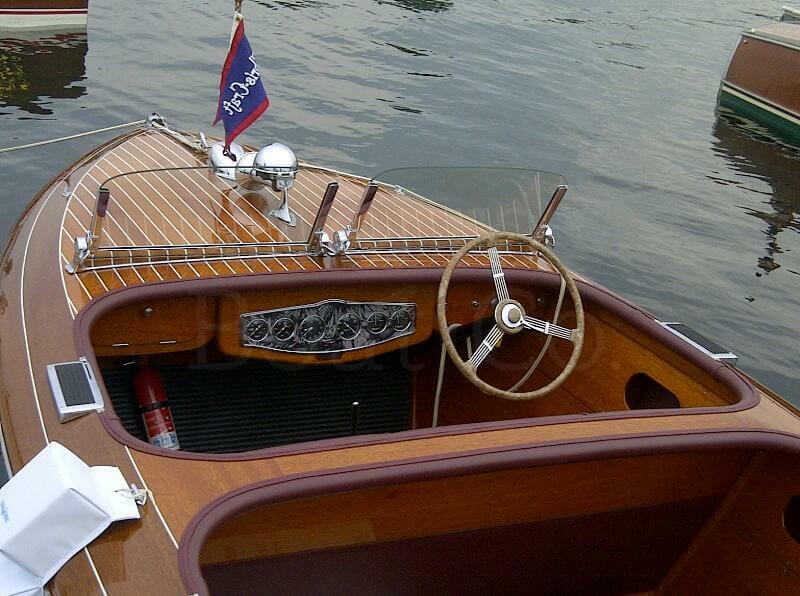 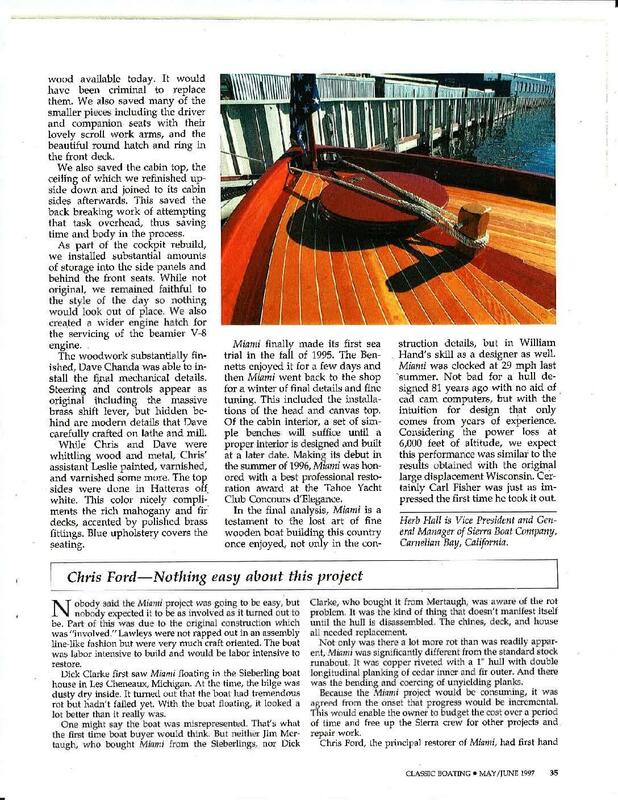 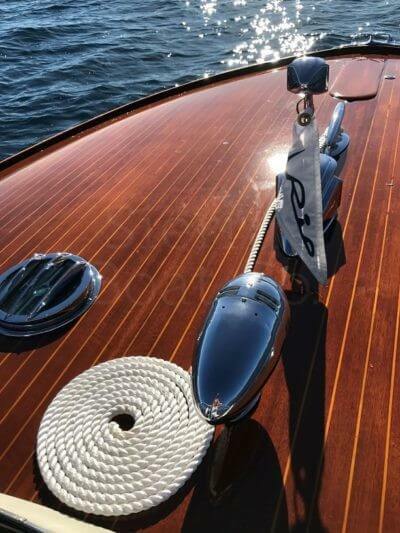 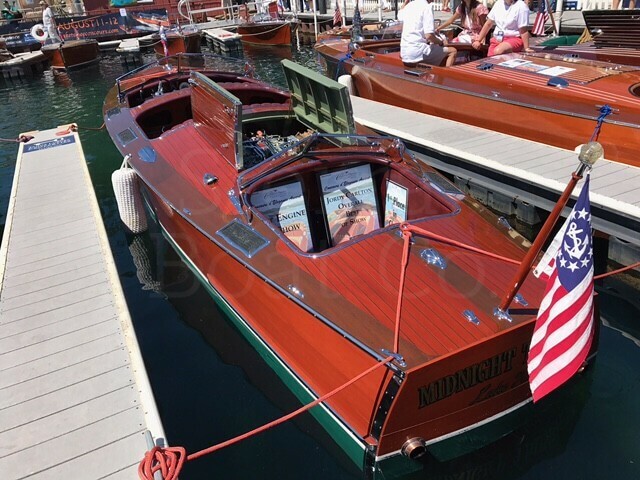 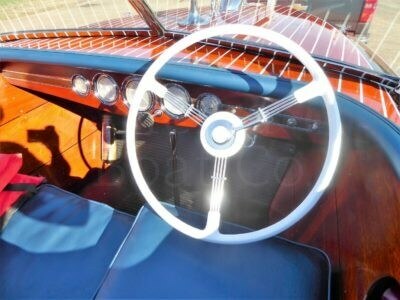 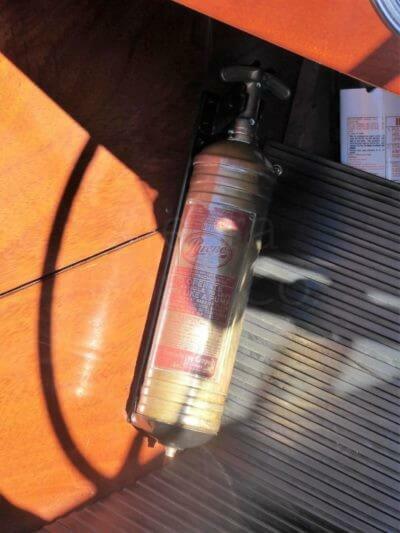 It has been awarded “Best Gar Wood of Show” at the prestigious Lake Tahoe Concours d’Elegance twice, in 2002 and 2004.